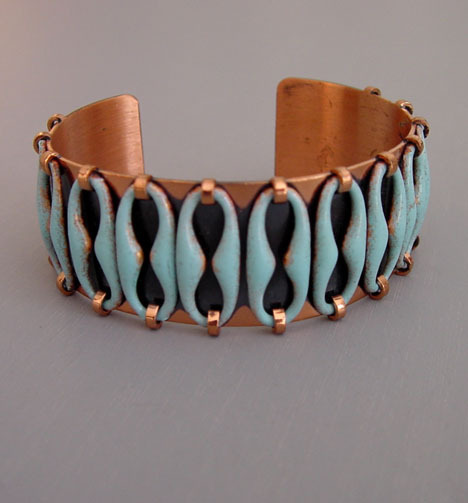 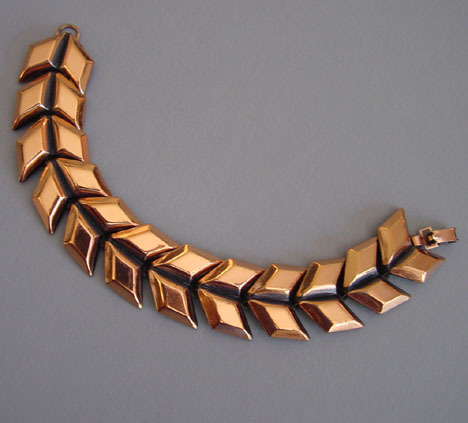 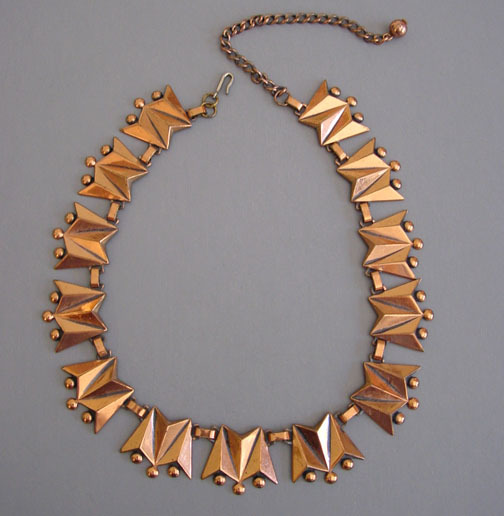 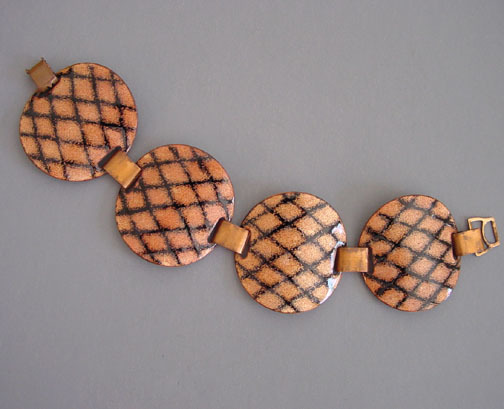 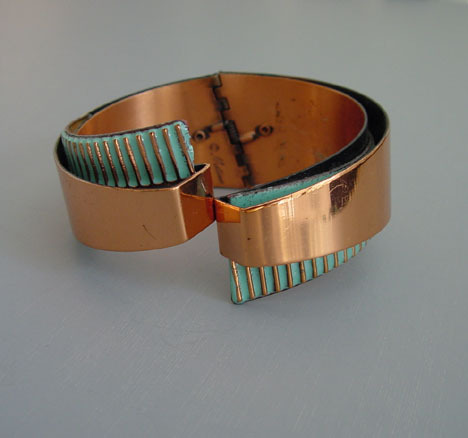 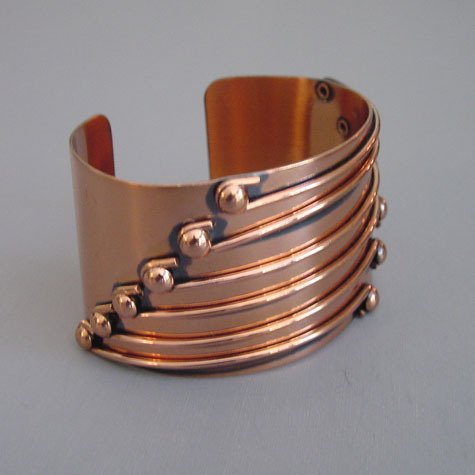 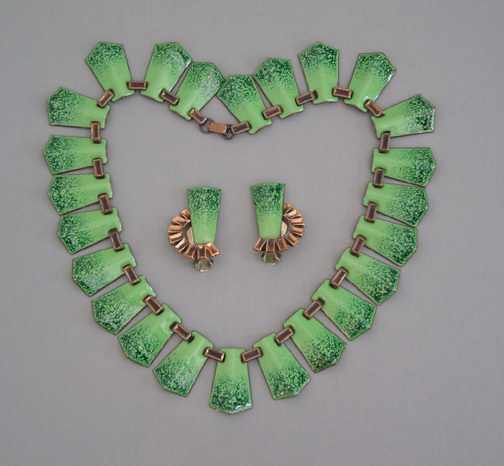 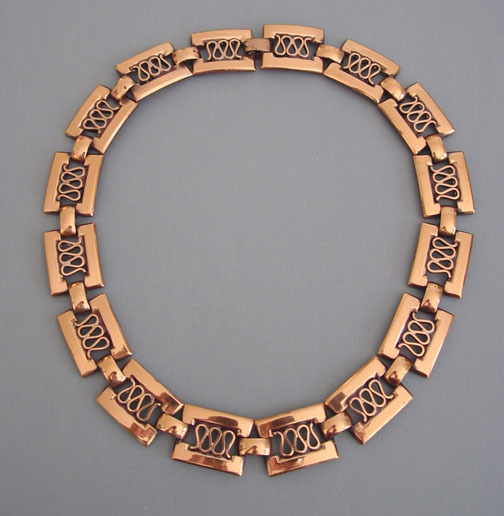 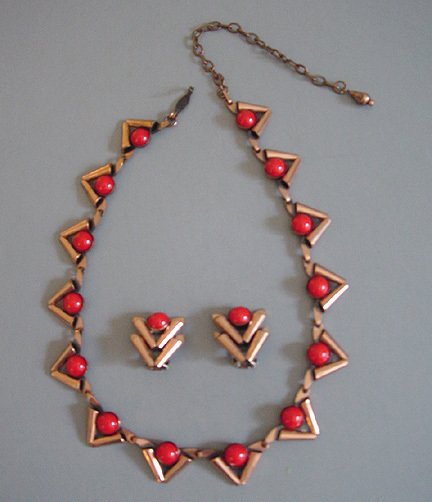 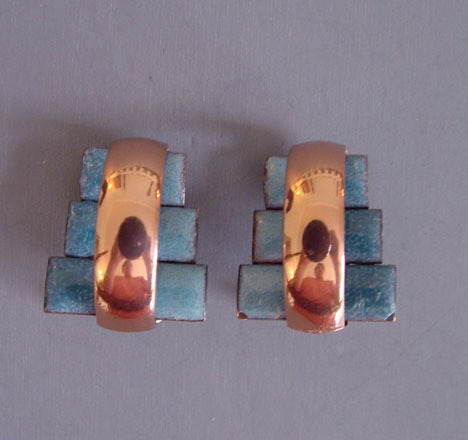 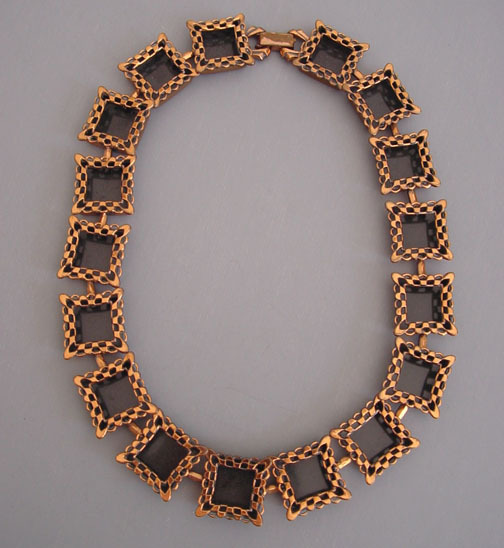 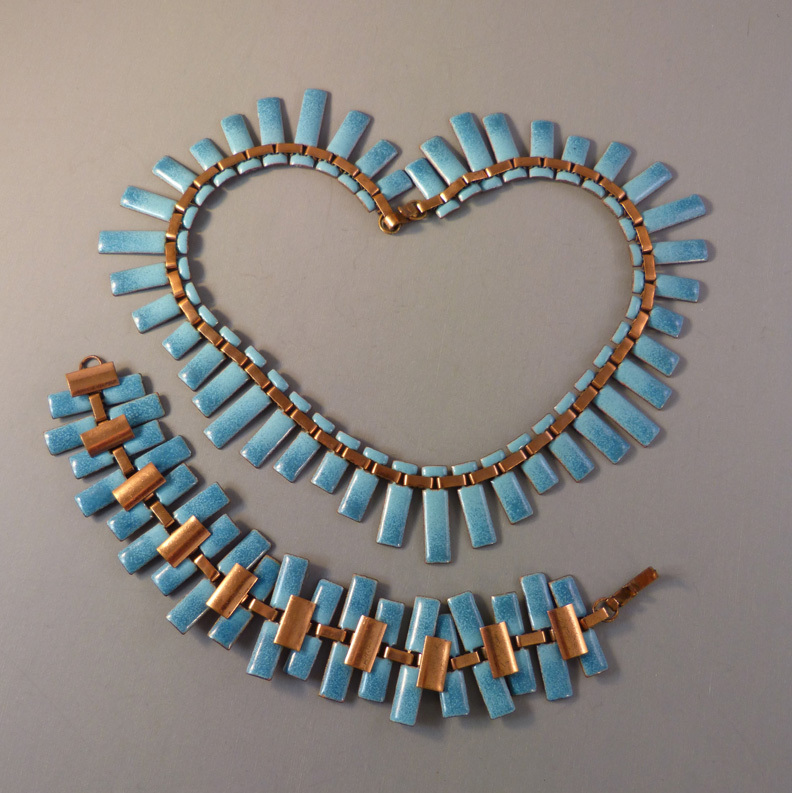 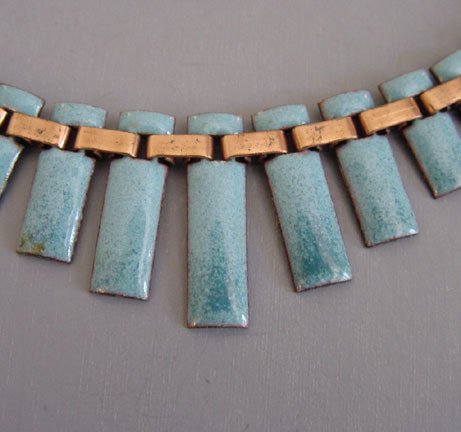 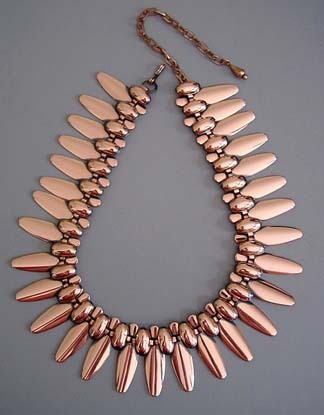 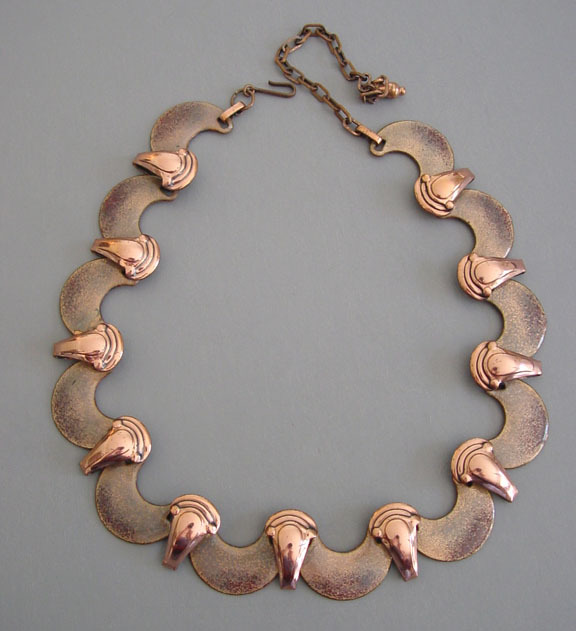 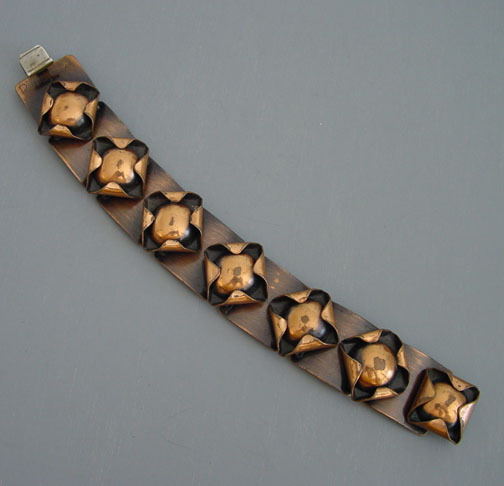 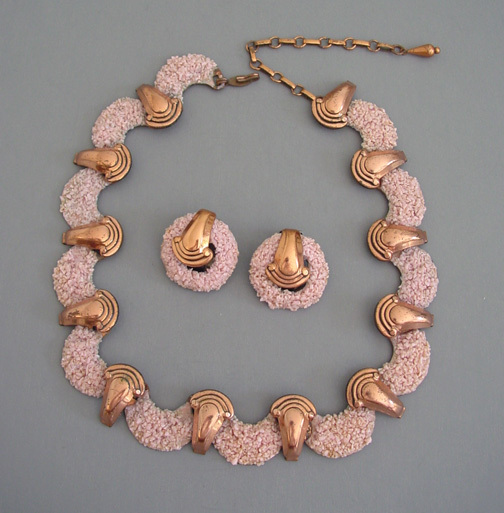 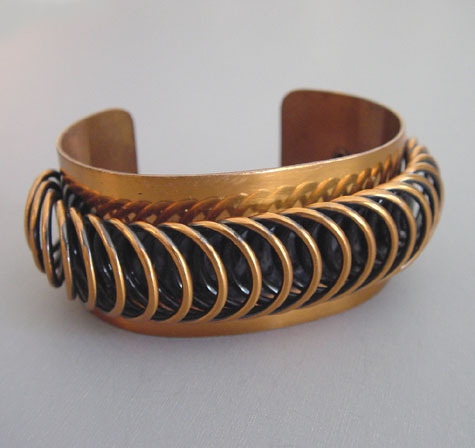 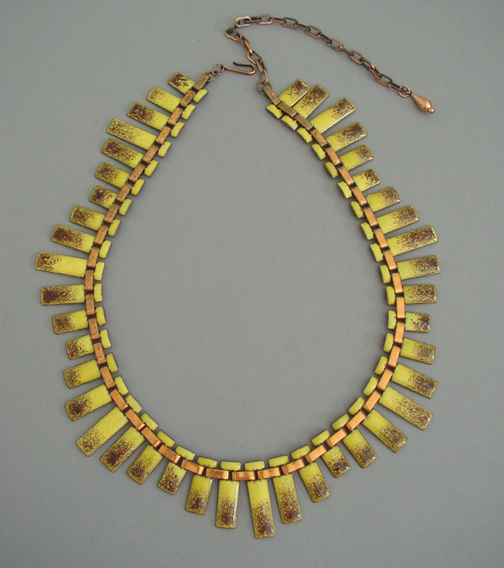 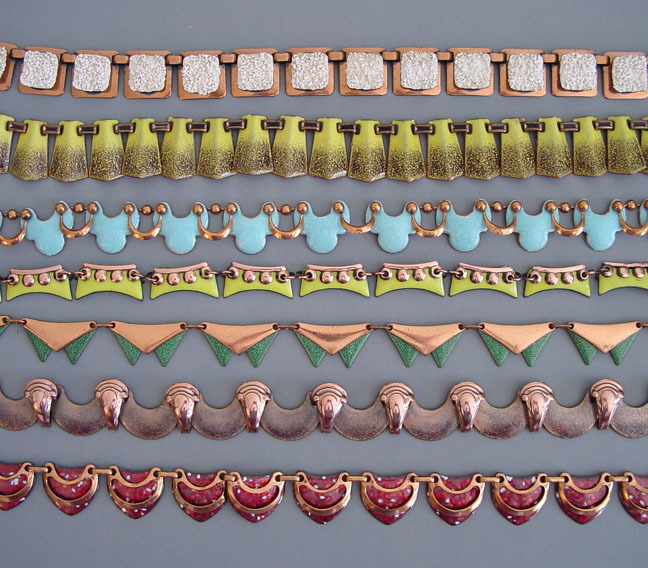 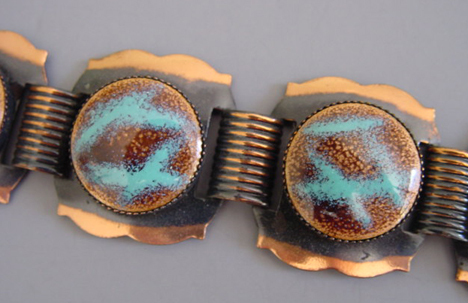 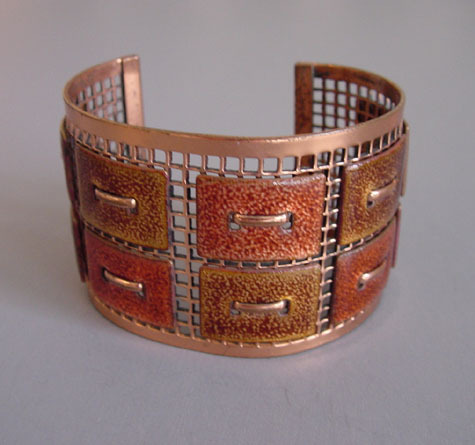 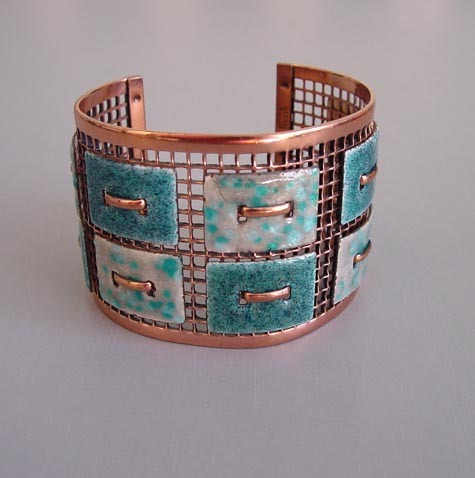 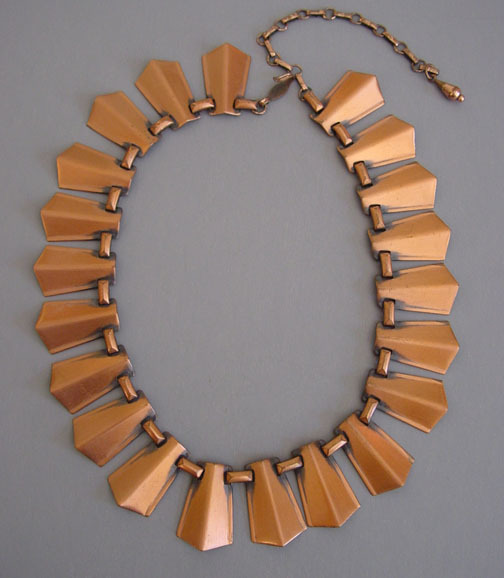 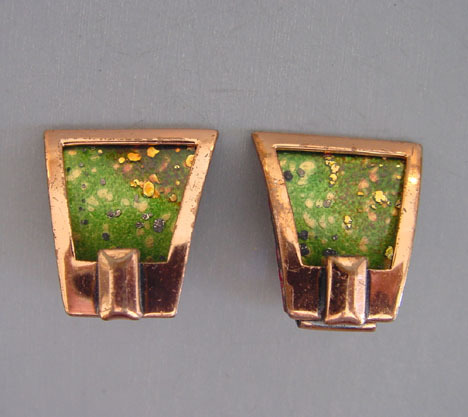 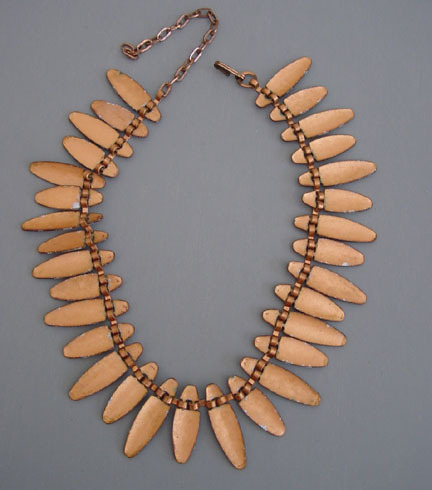 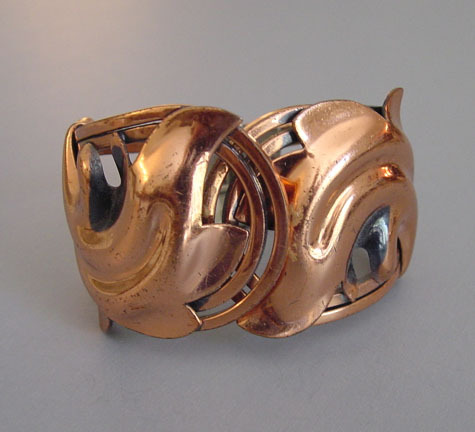 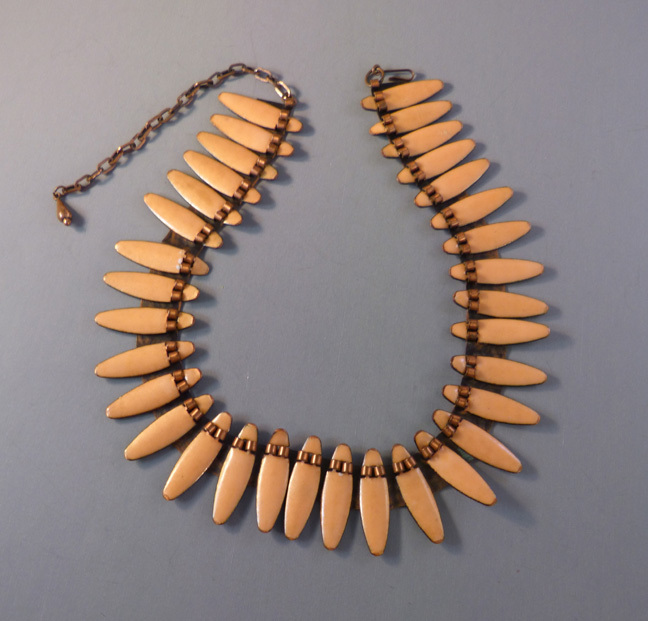 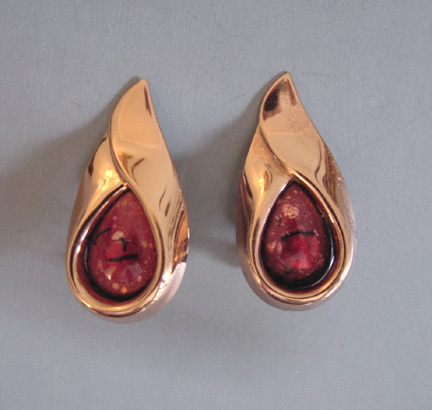 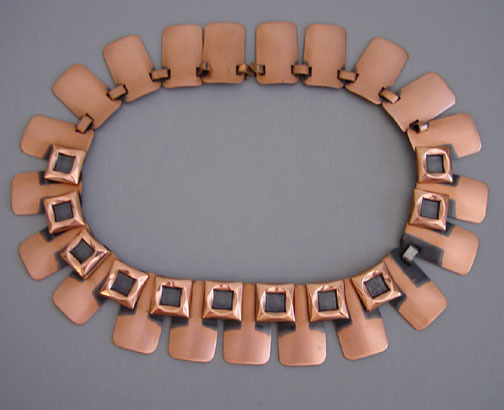 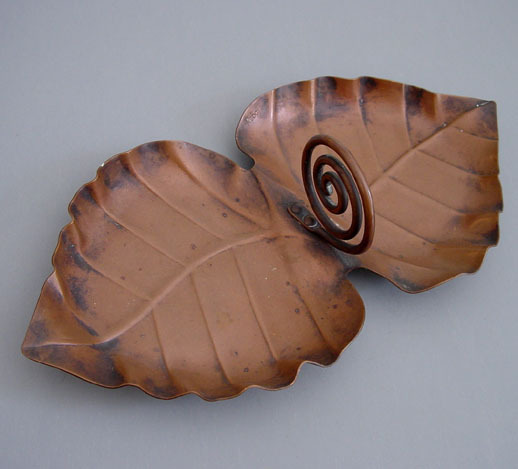 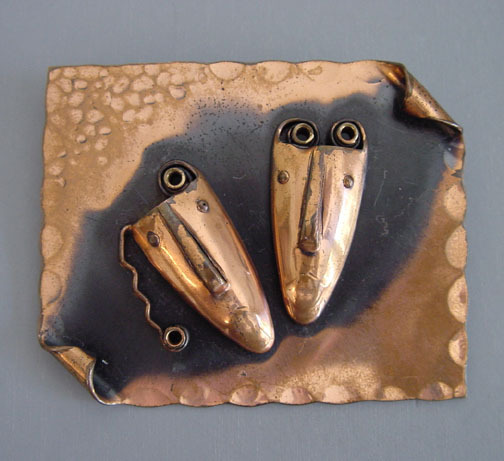 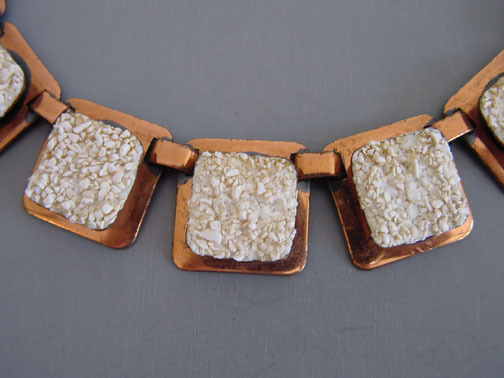 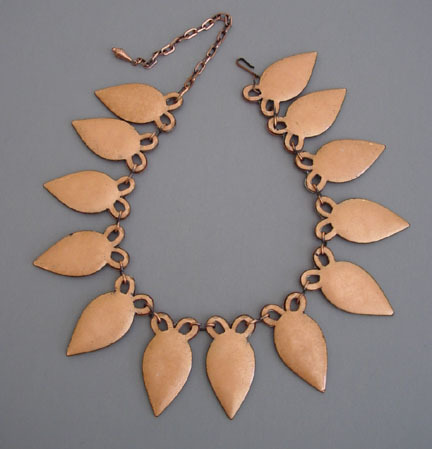 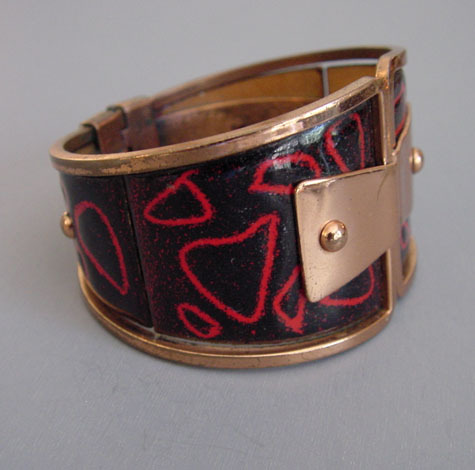 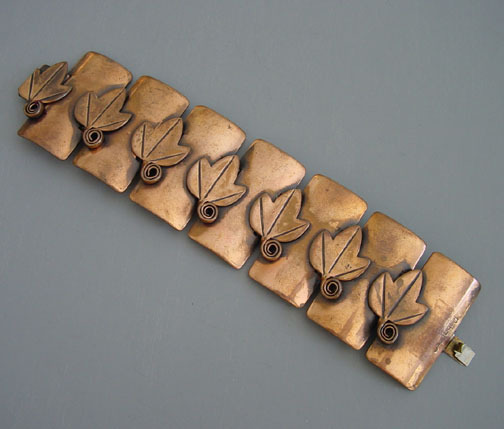 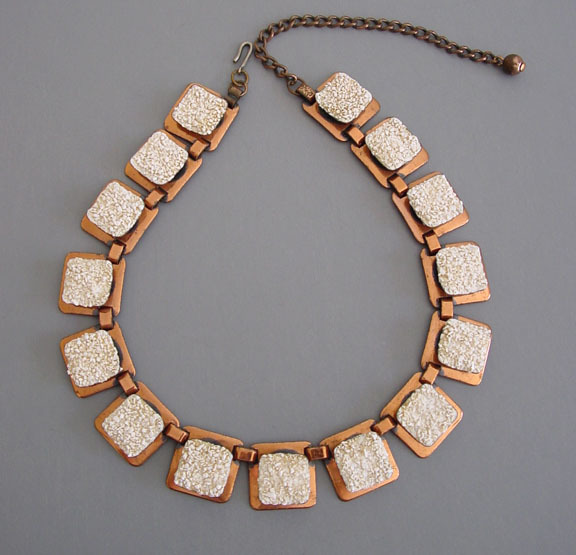 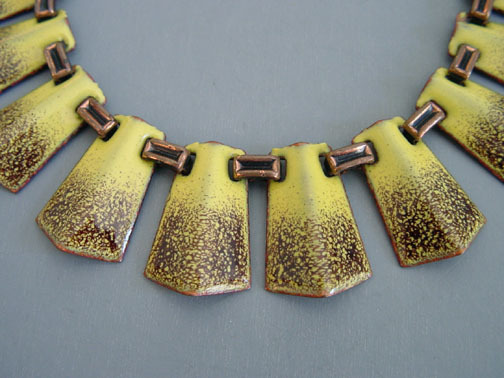 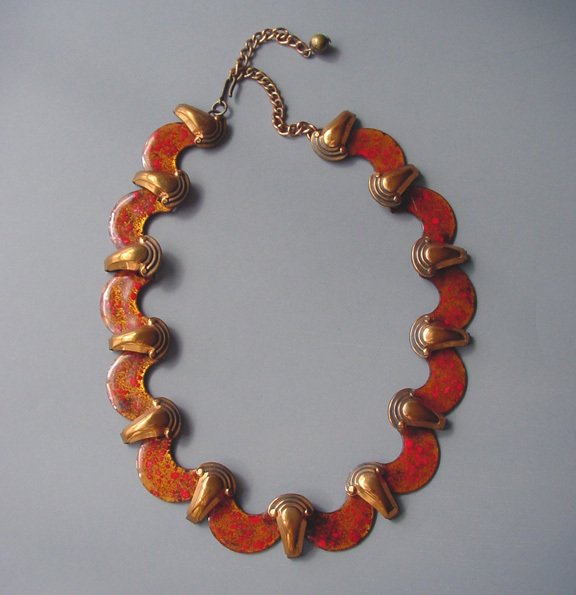 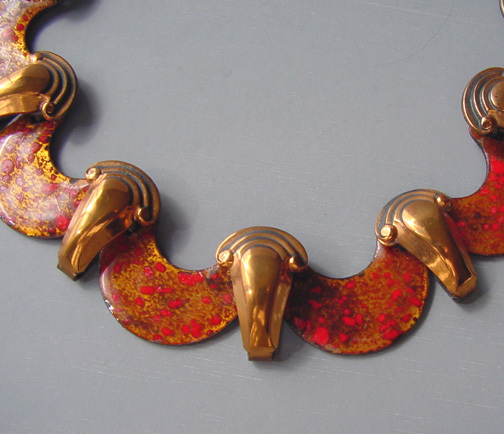 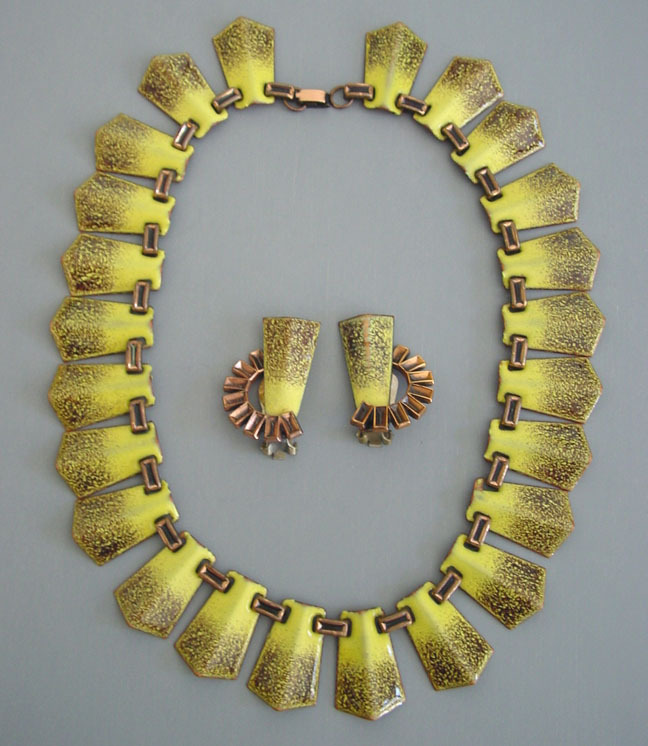 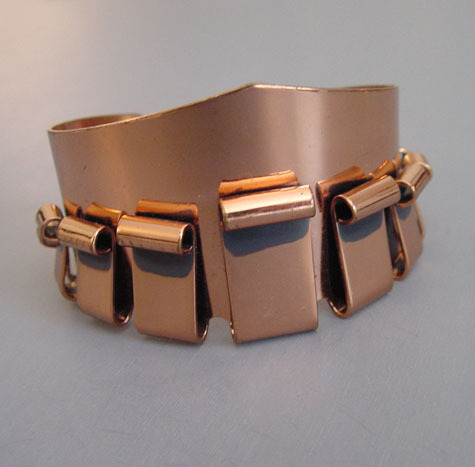 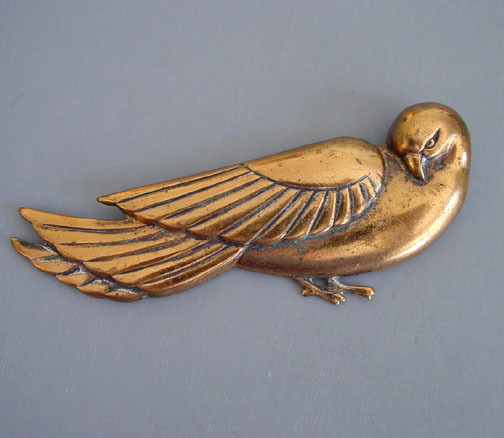 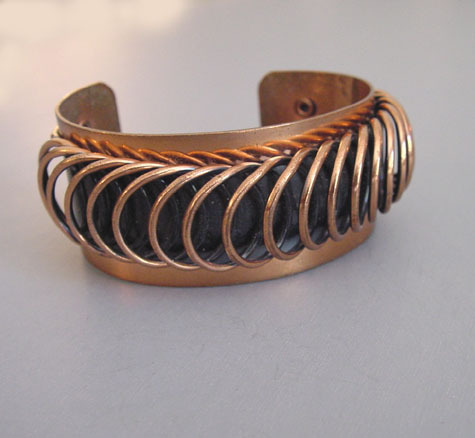 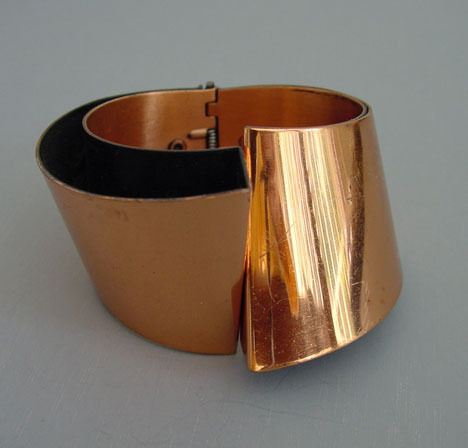 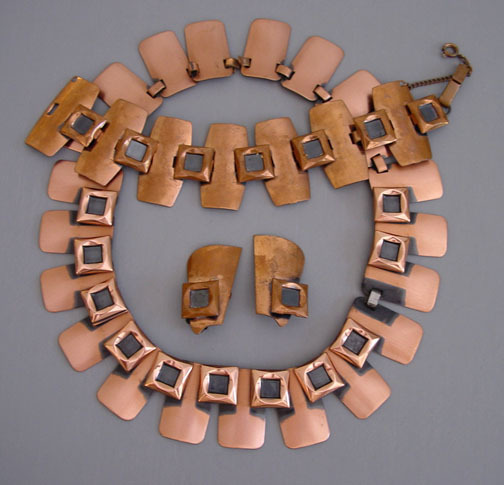 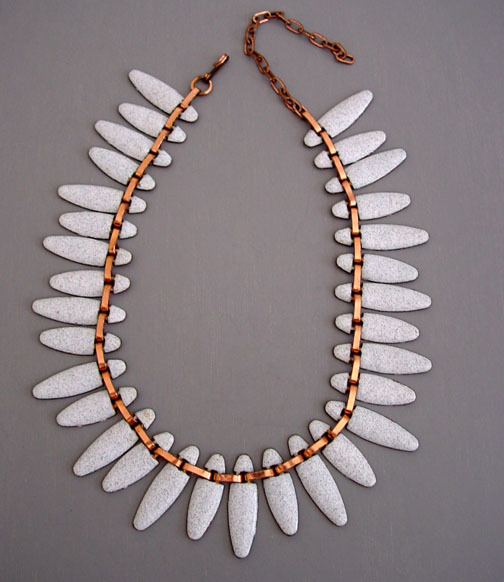 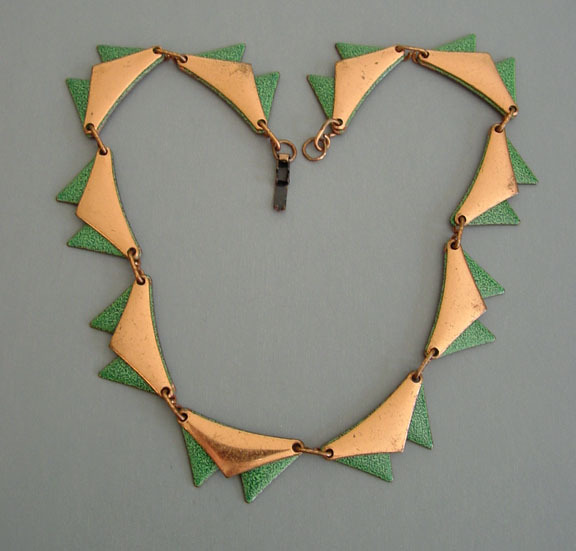 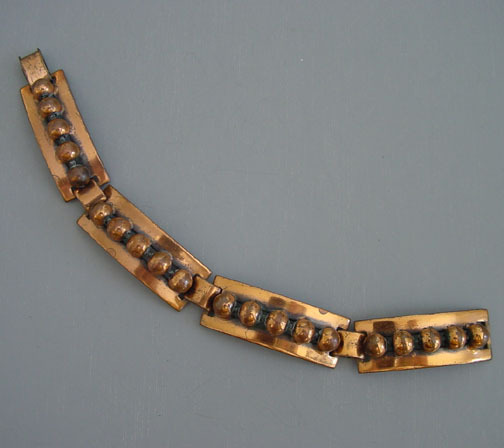 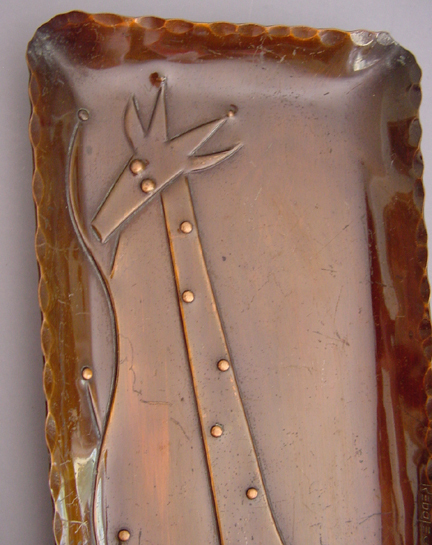 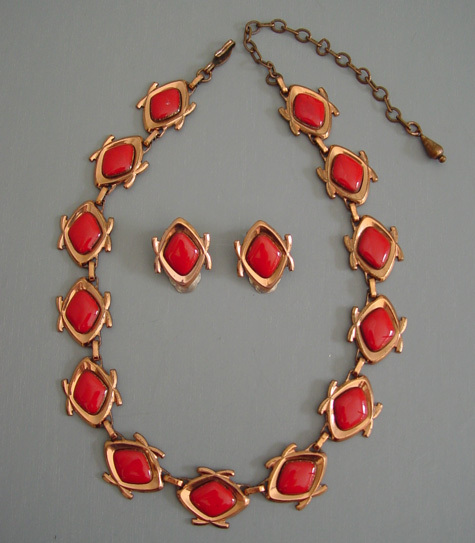 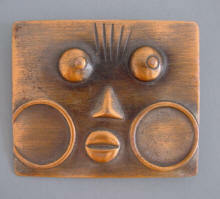 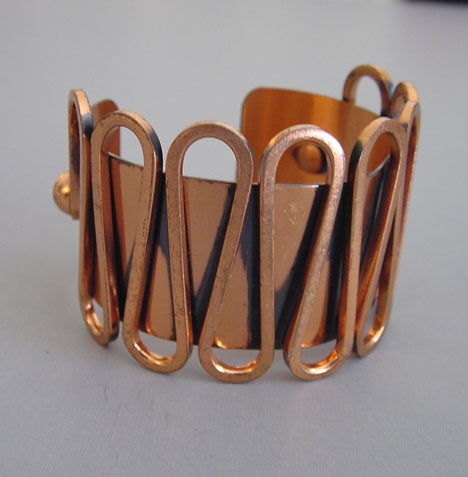 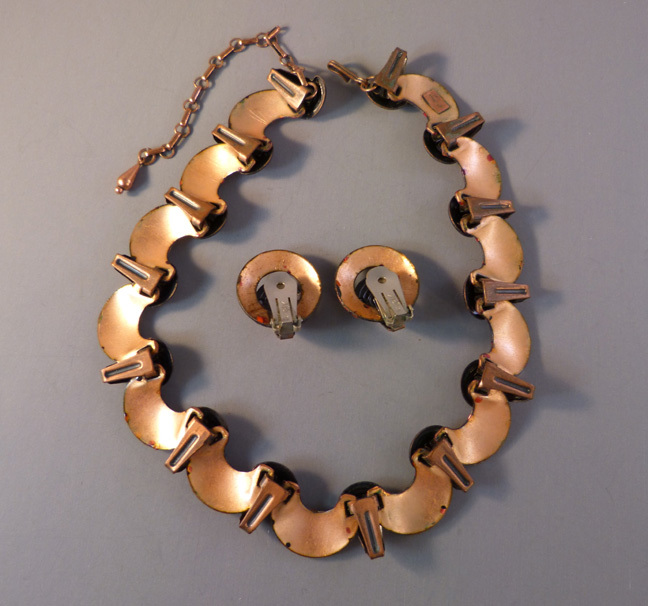 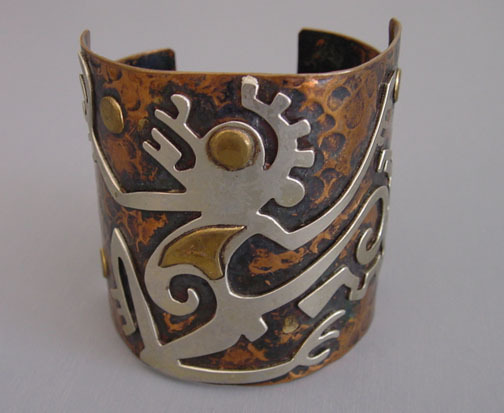 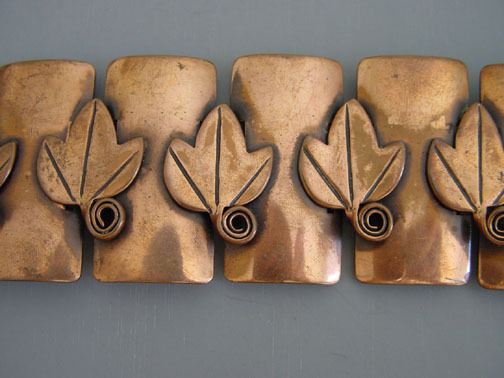 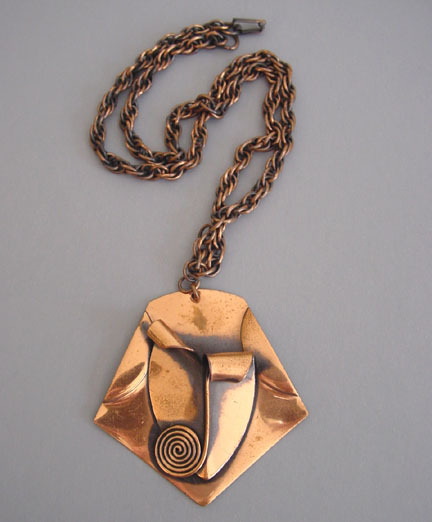 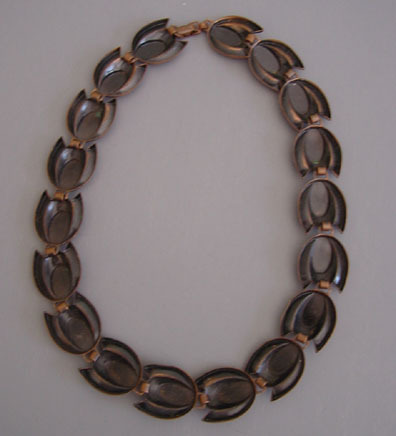 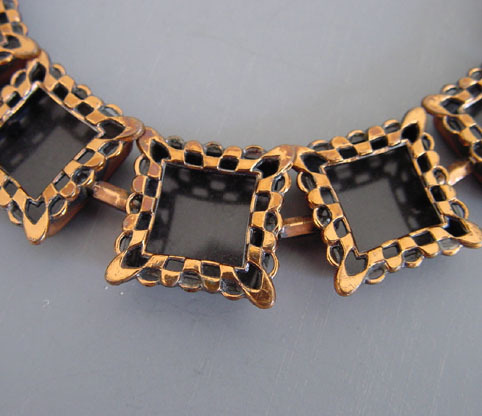 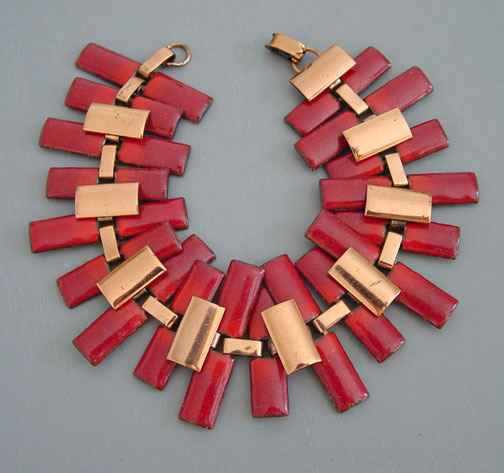 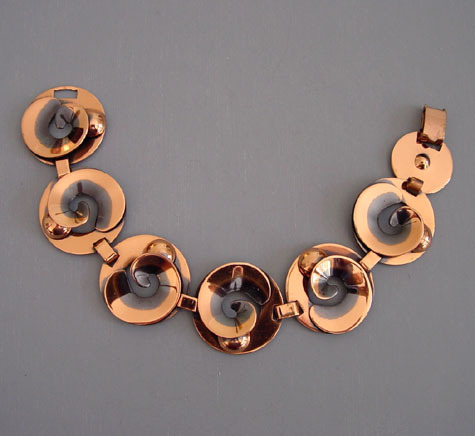 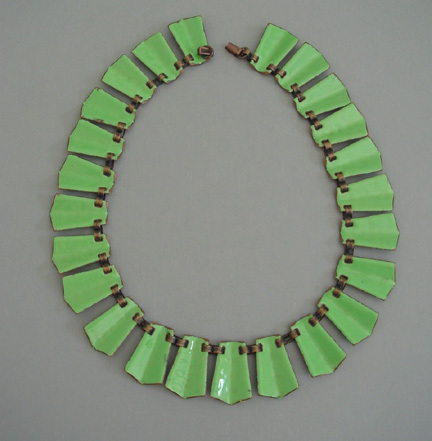 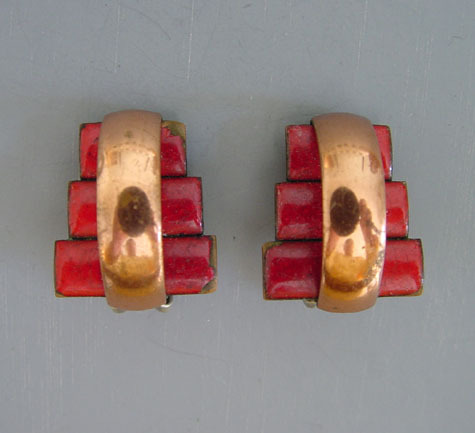 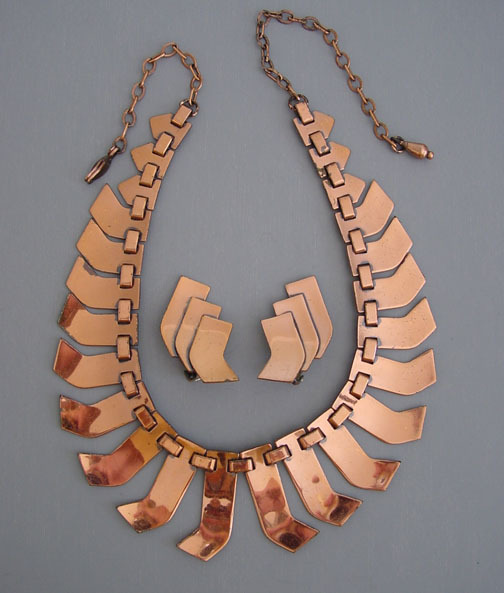 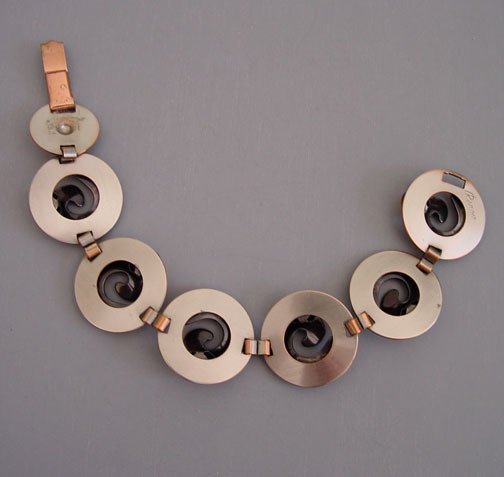 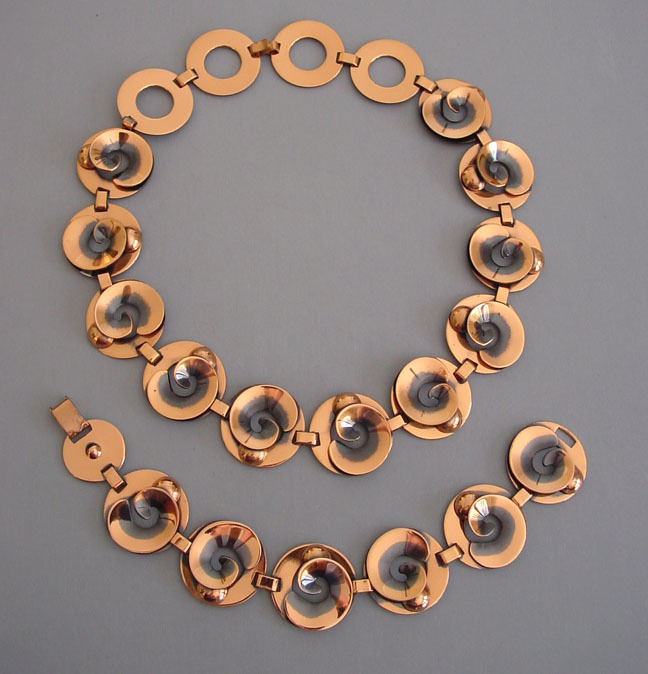 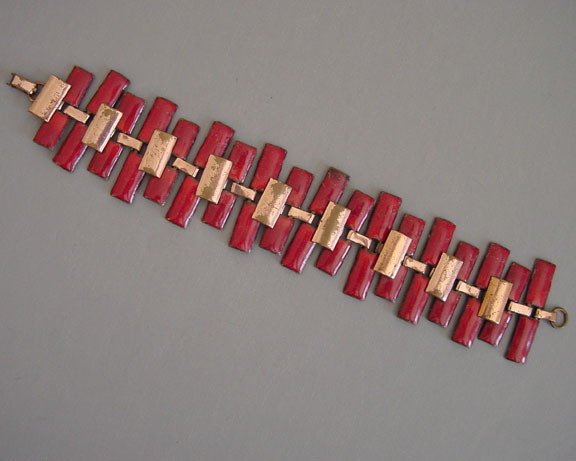 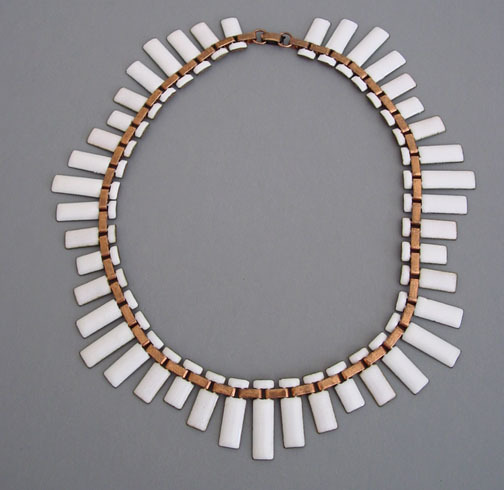 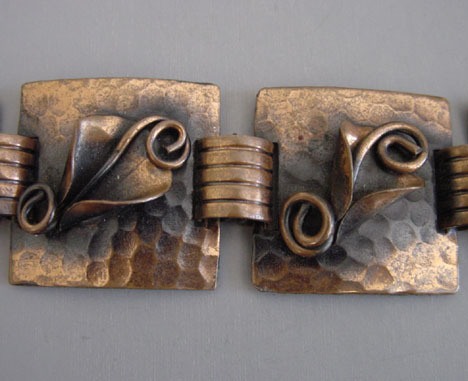 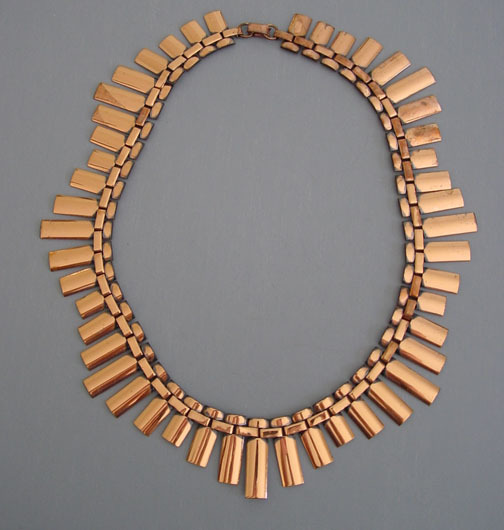 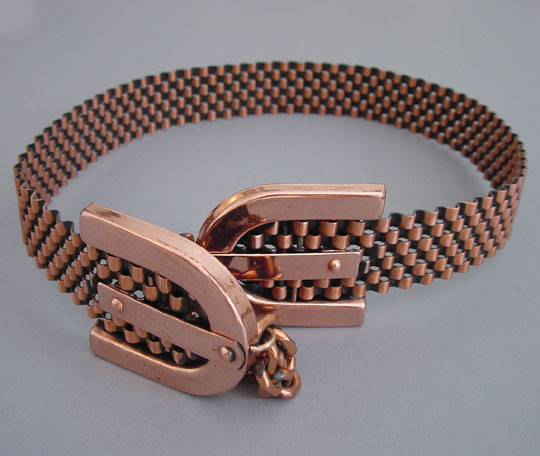 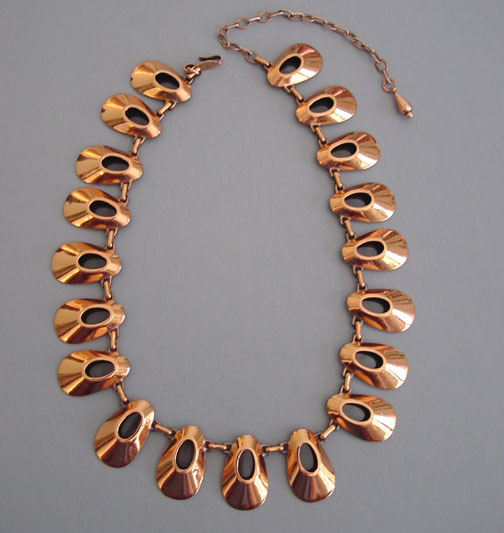 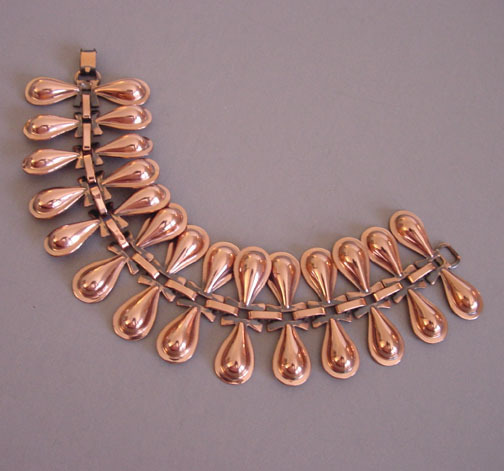 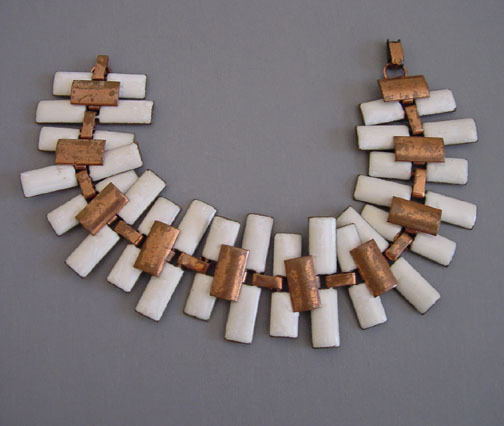 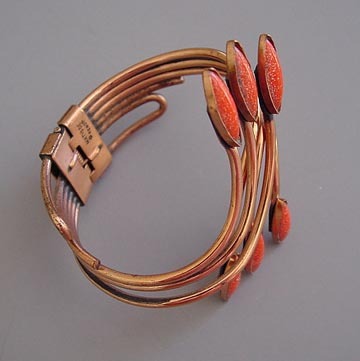 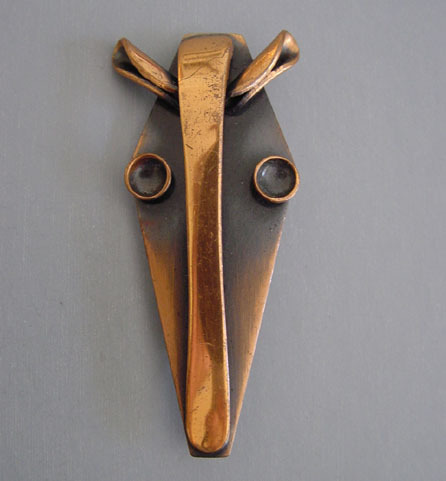 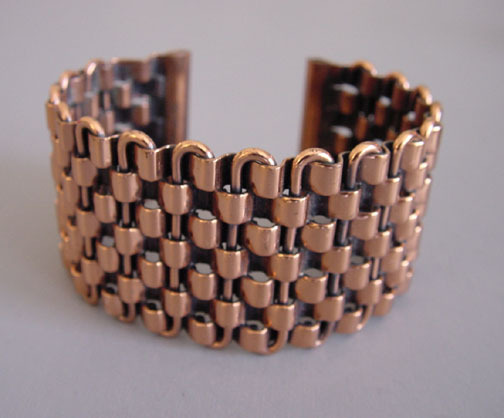 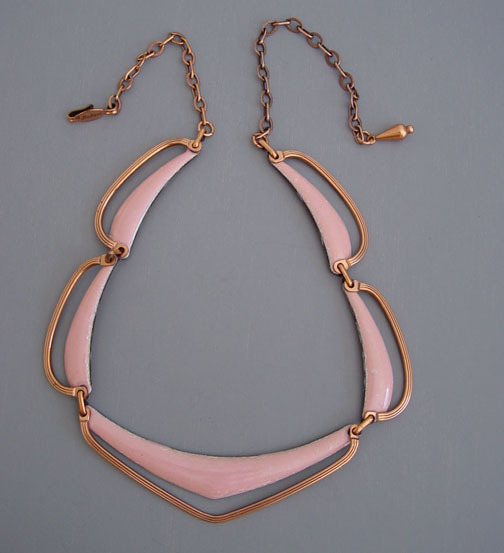 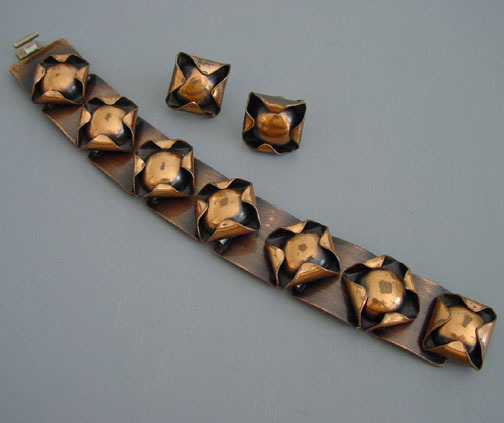 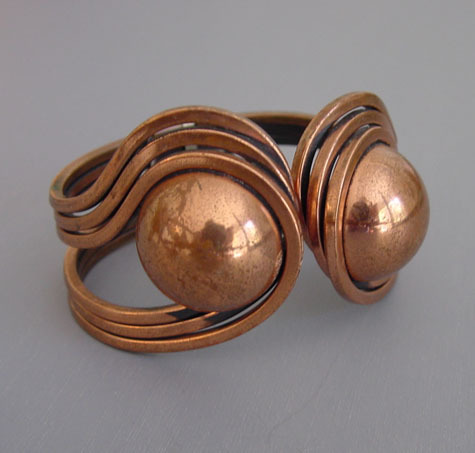 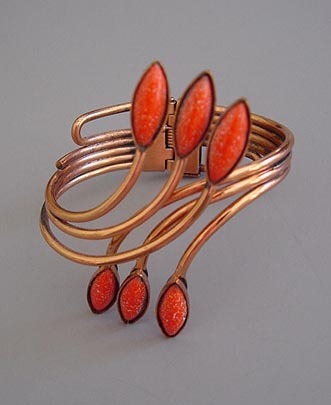 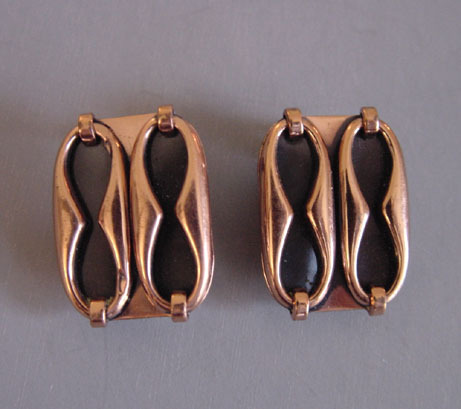 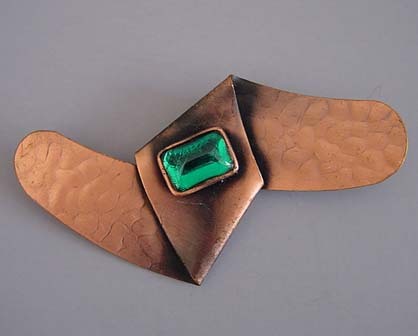 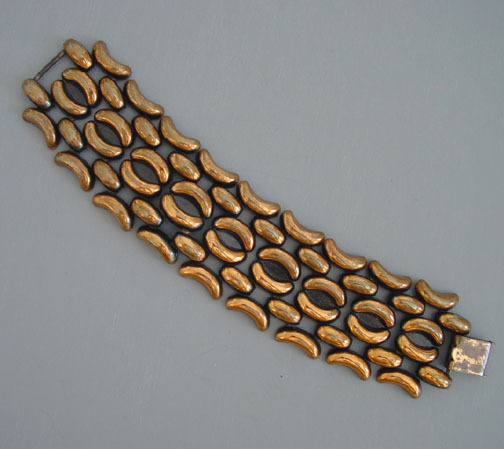 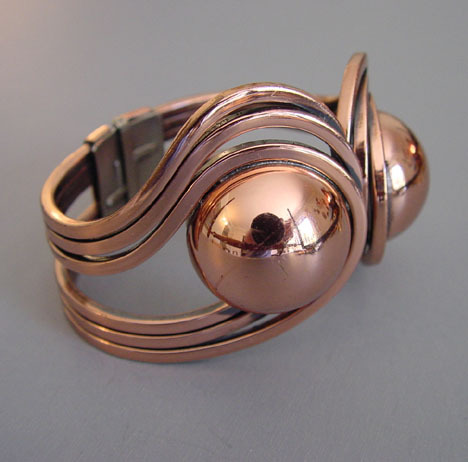 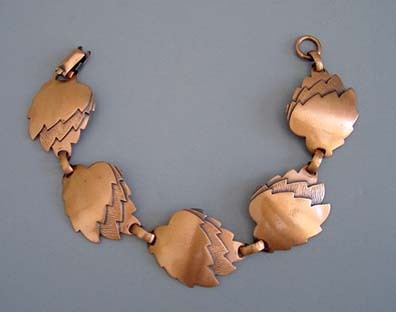 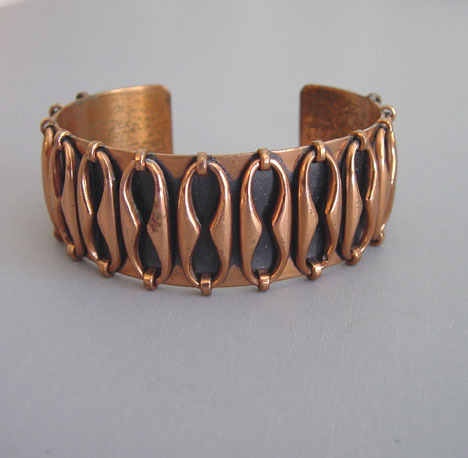 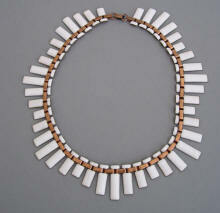 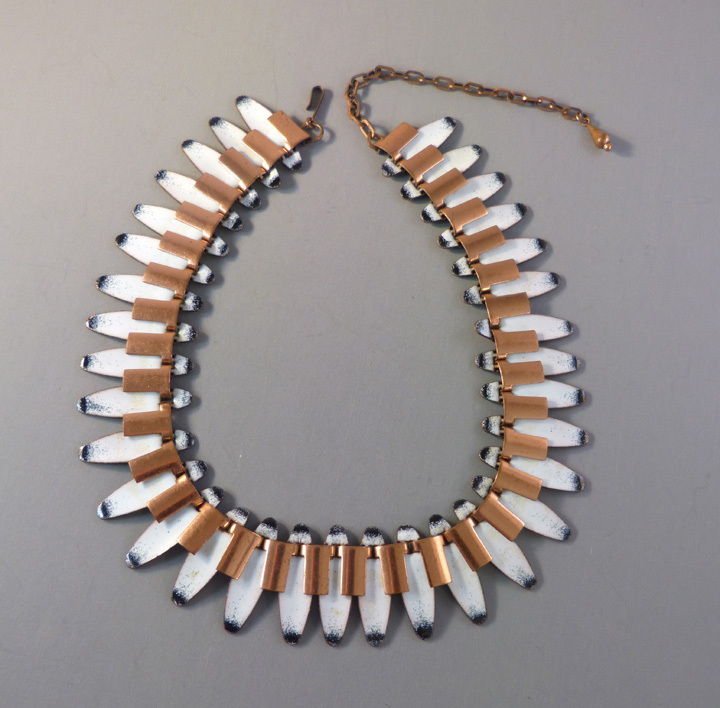 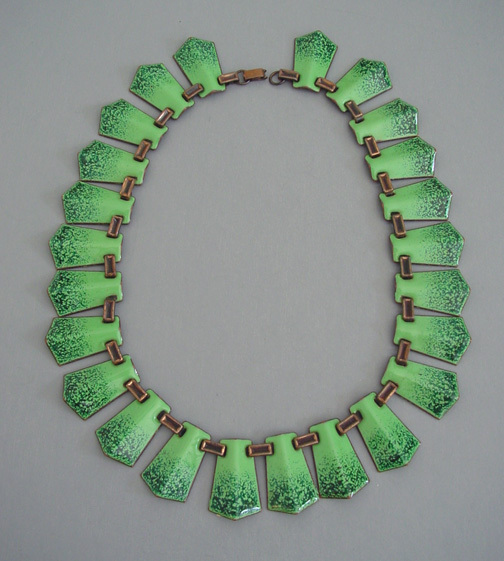 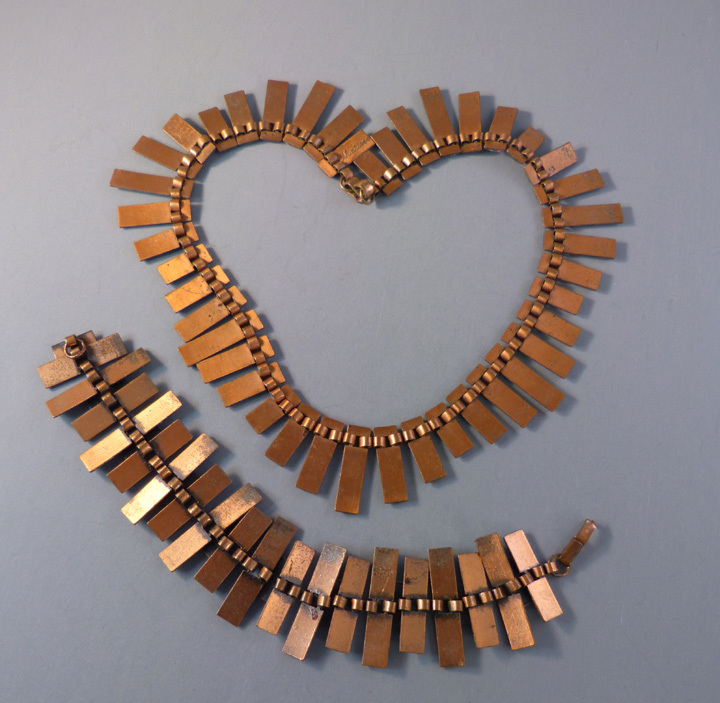 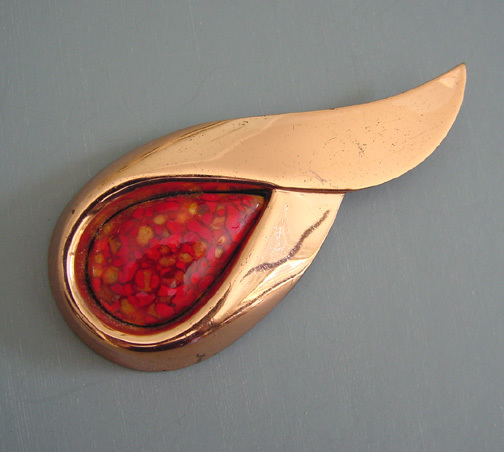 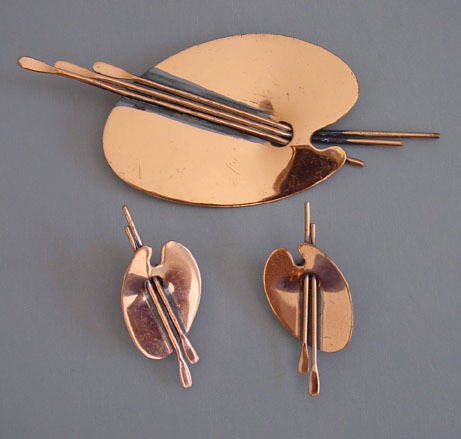 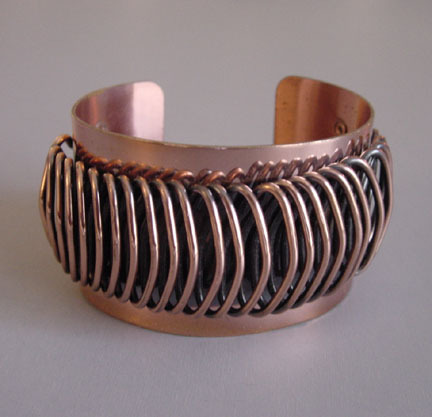 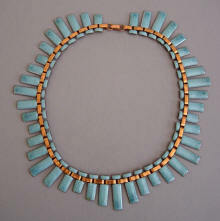 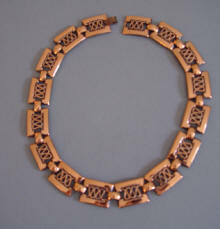 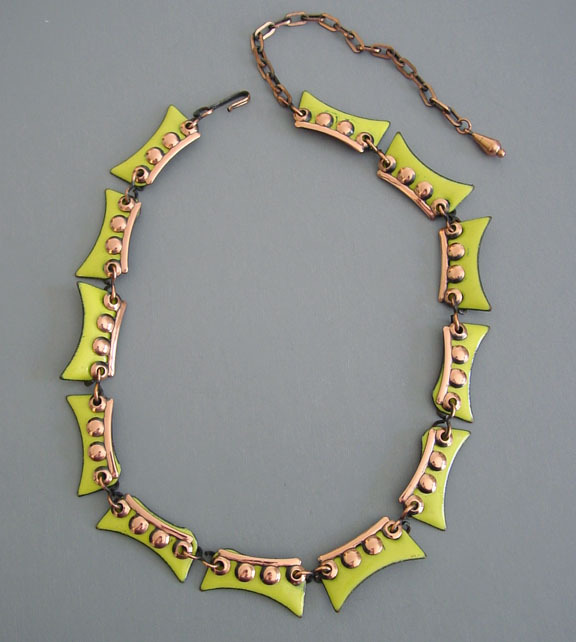 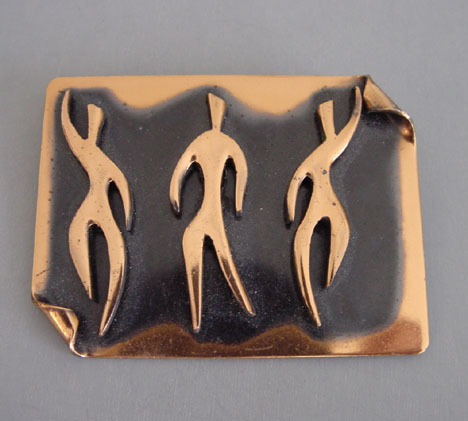 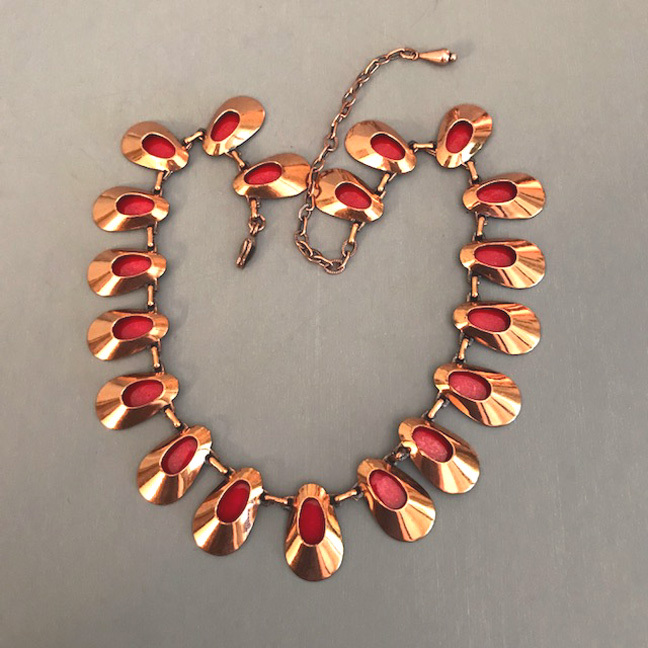 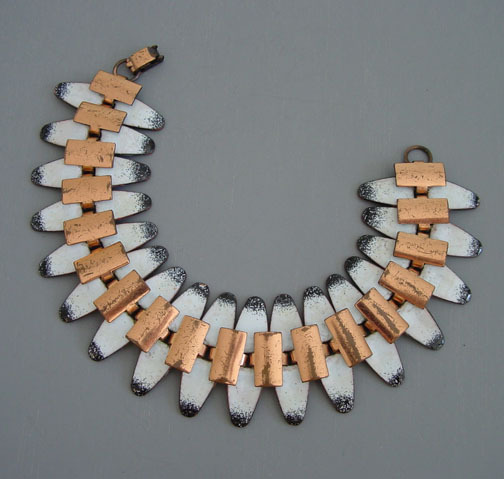 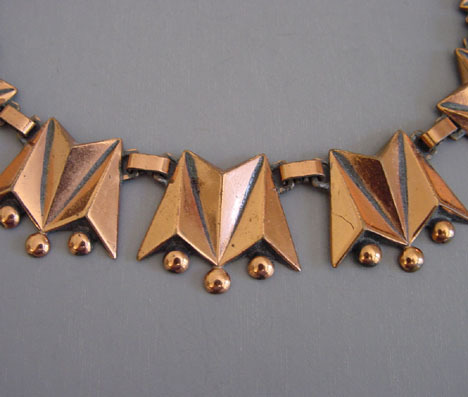 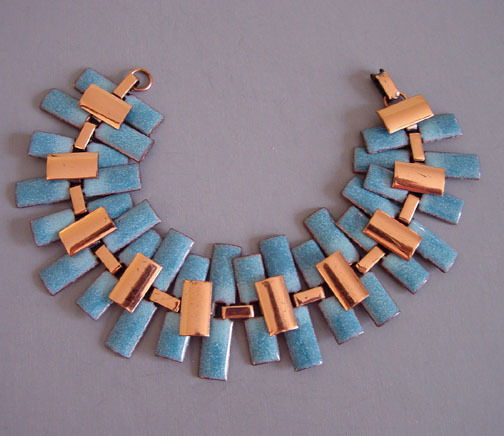 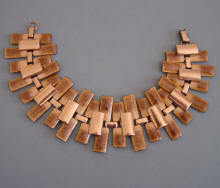 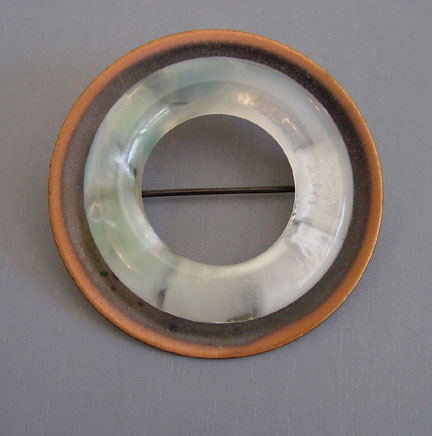 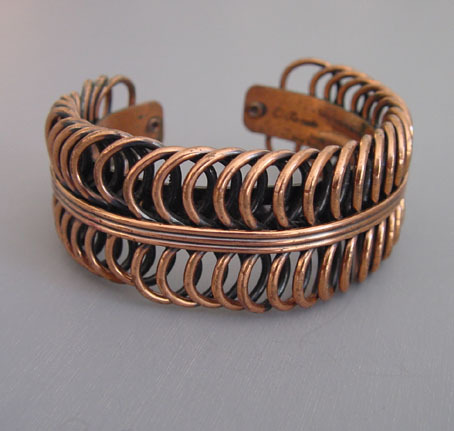 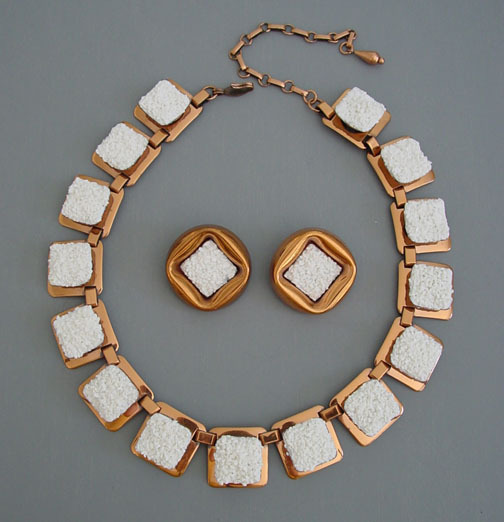 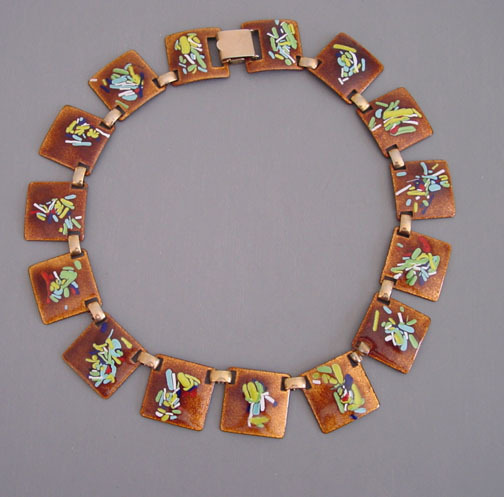 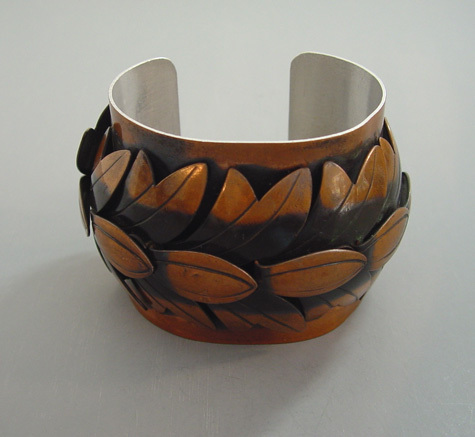 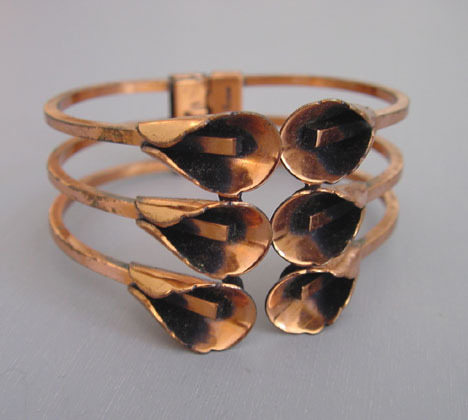 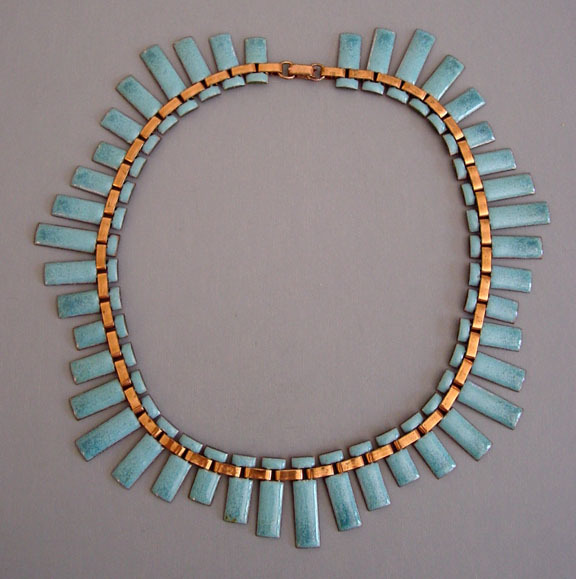 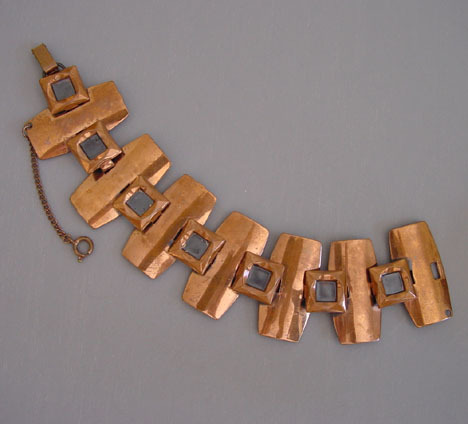 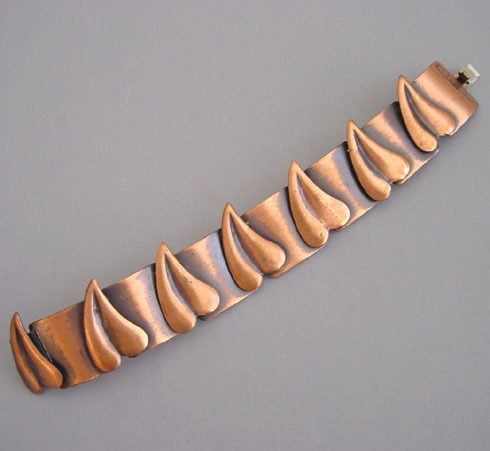 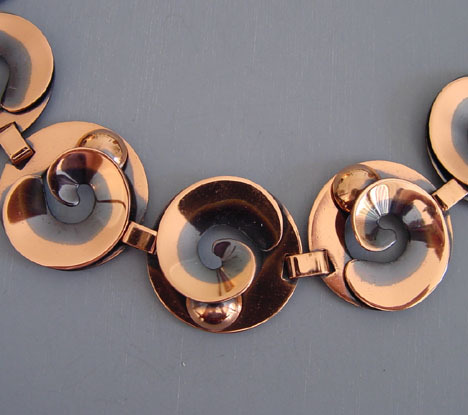 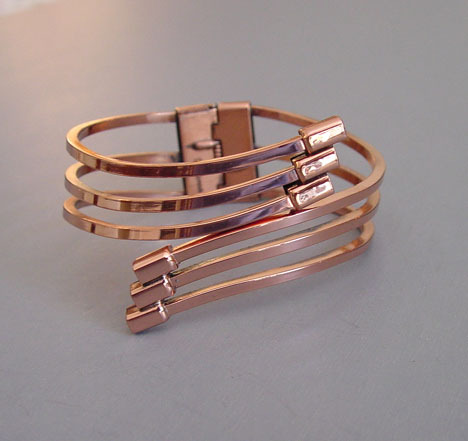 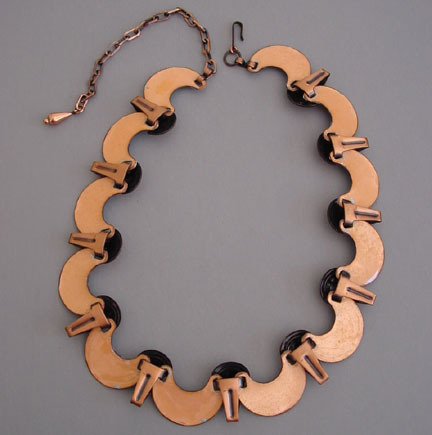 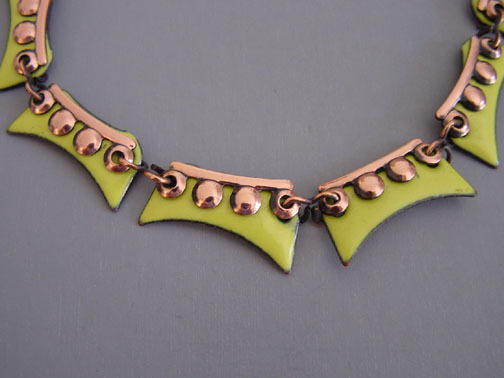 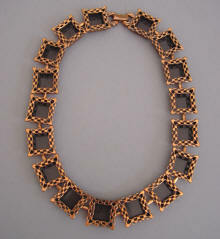 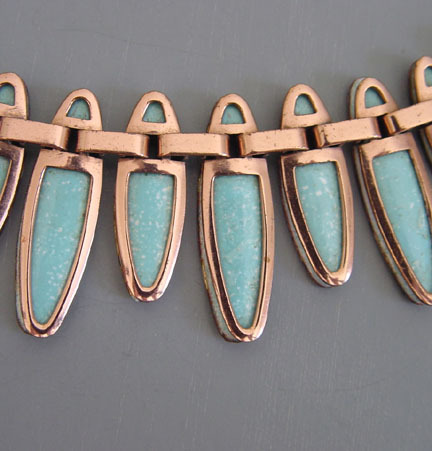 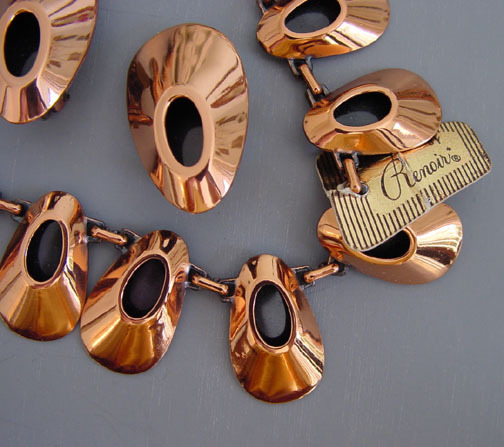 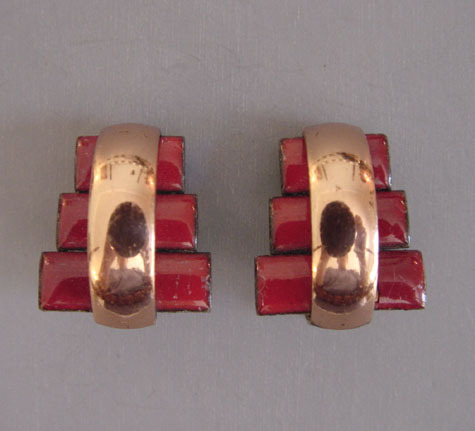 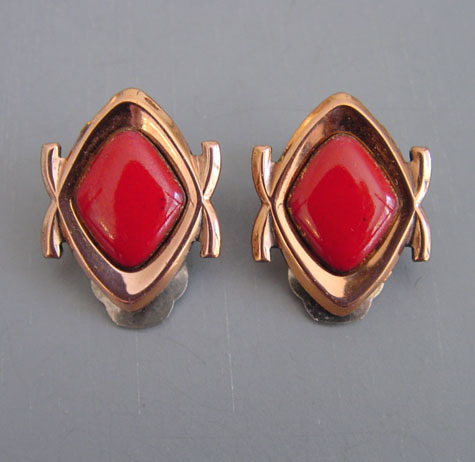 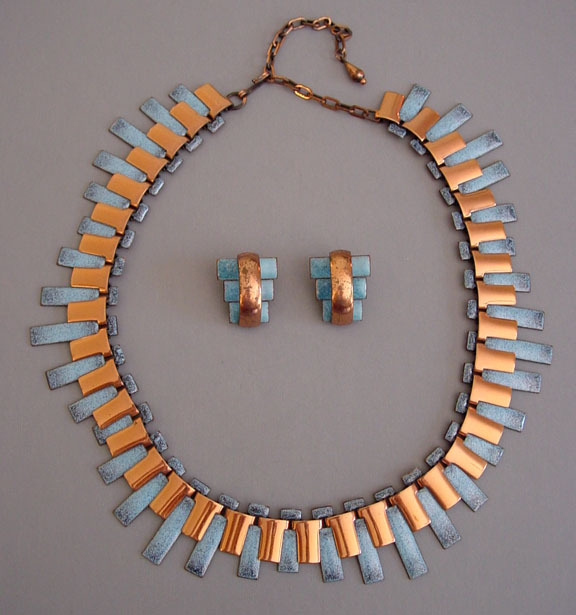 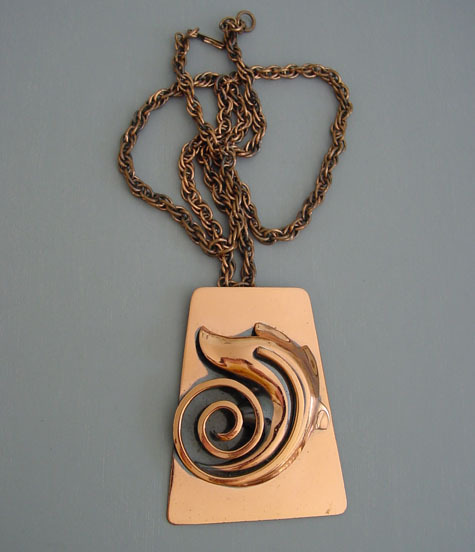 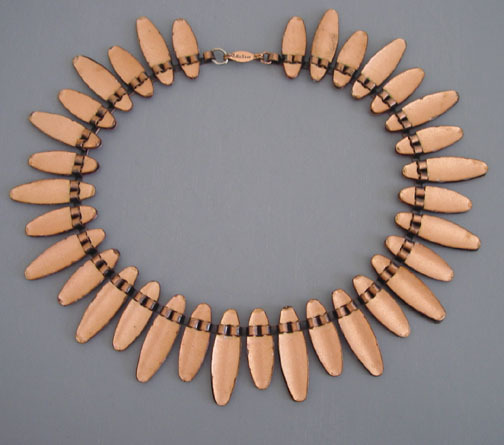 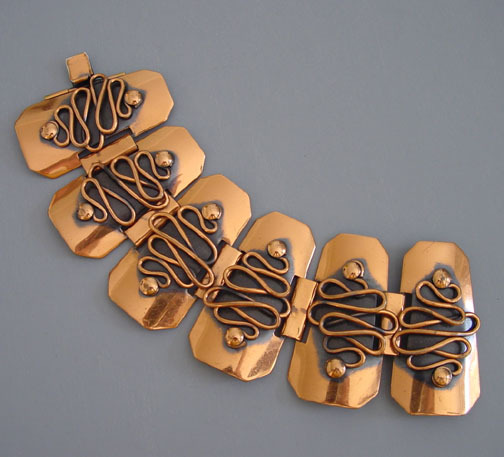 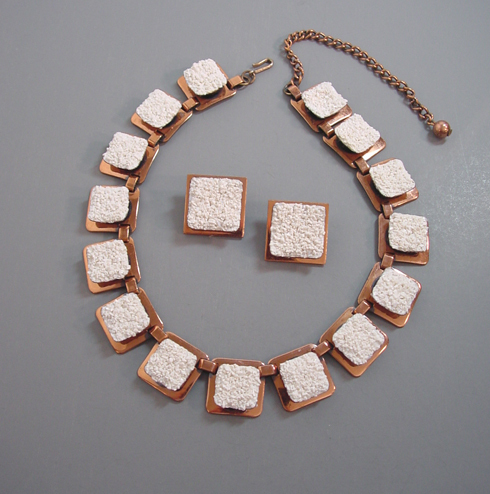 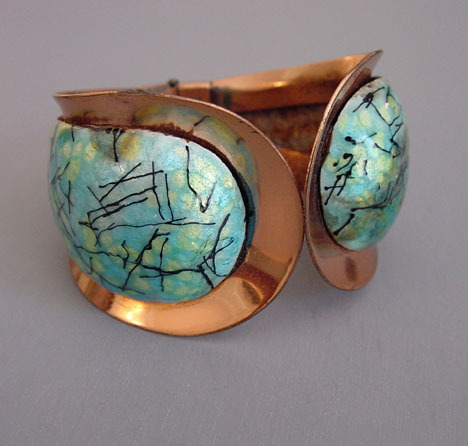 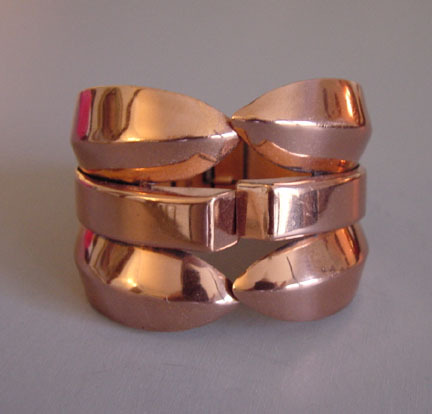 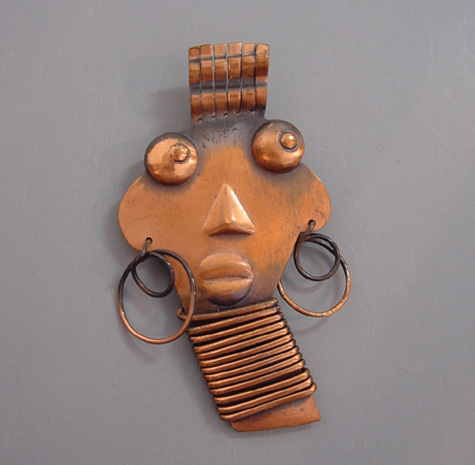 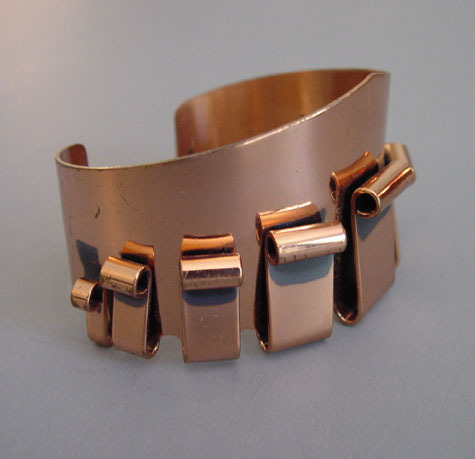 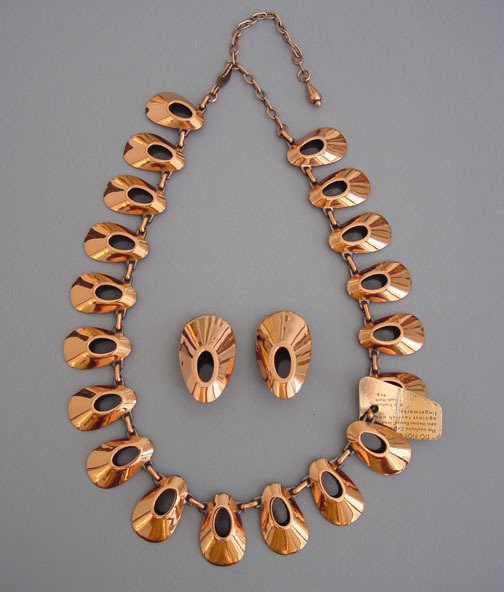 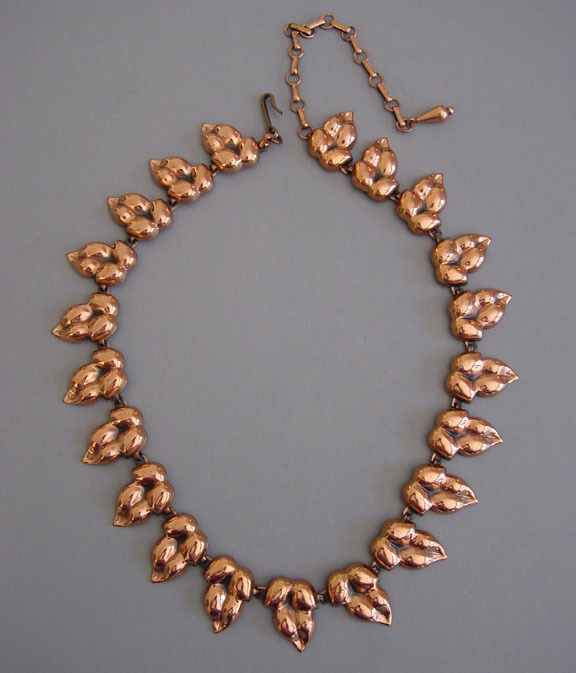 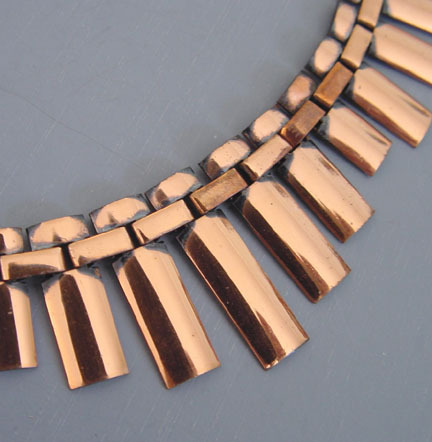 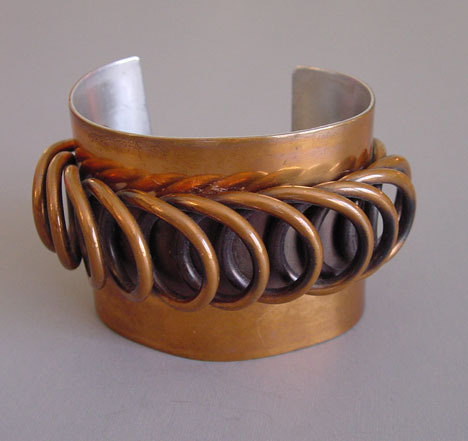 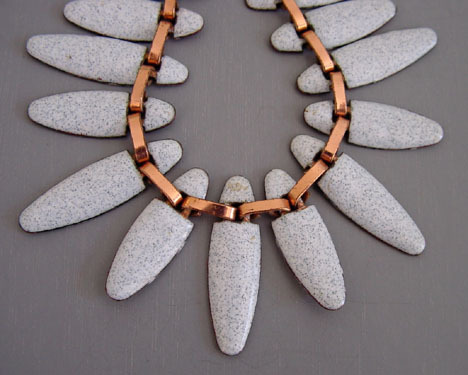 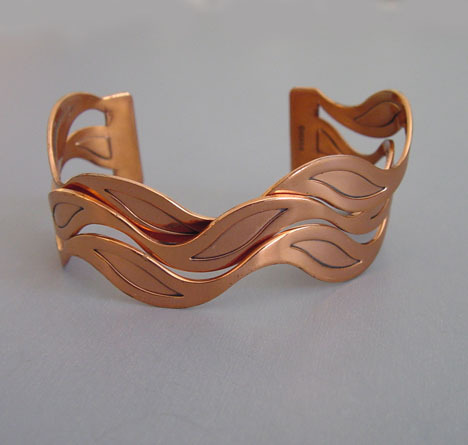 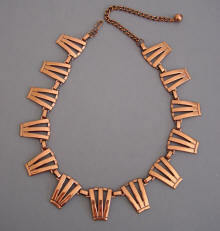 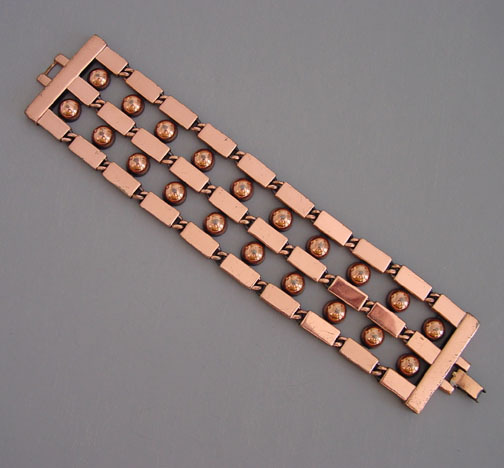 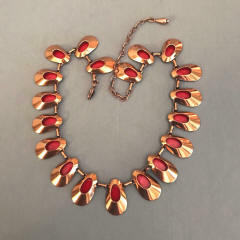 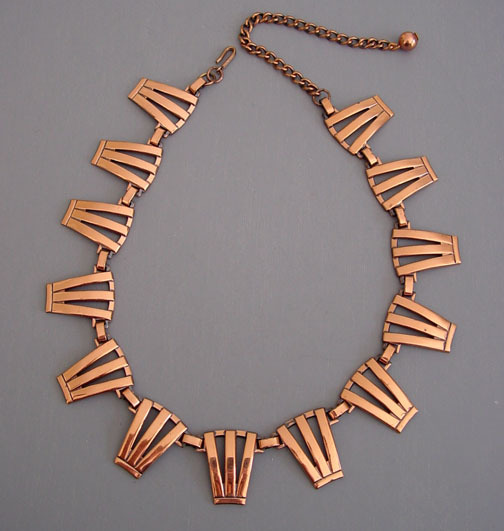 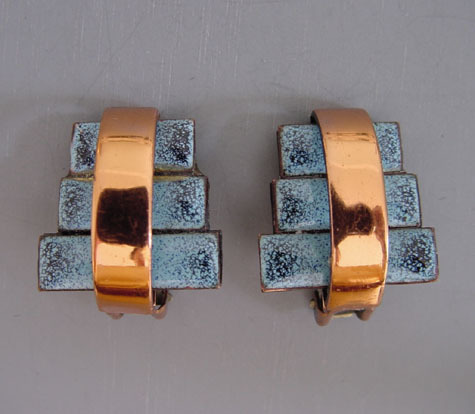 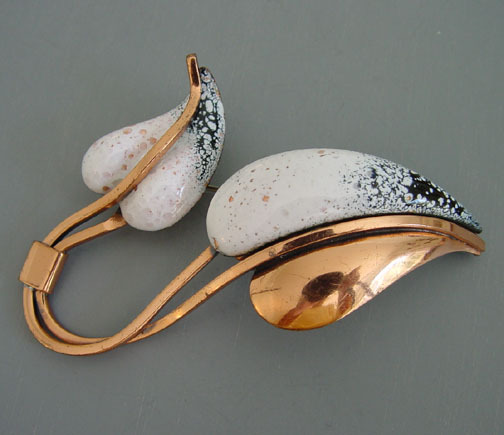 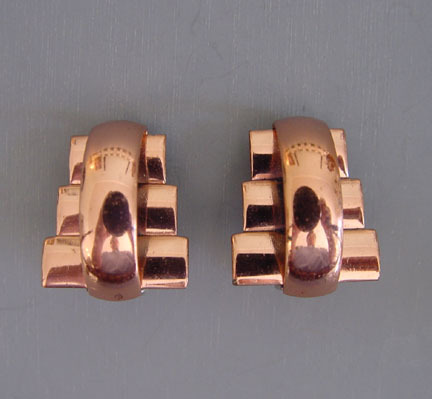 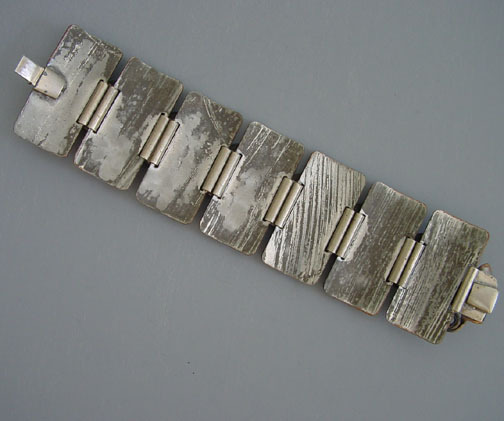 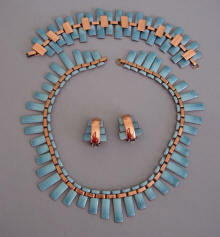 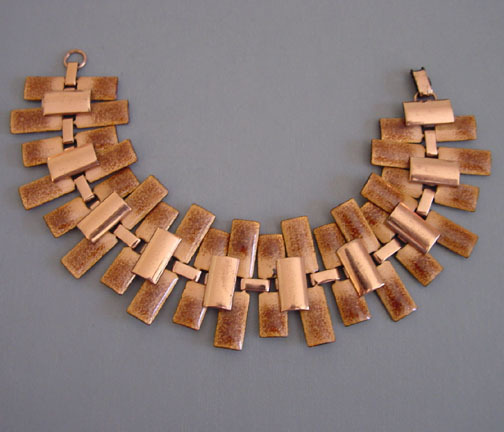 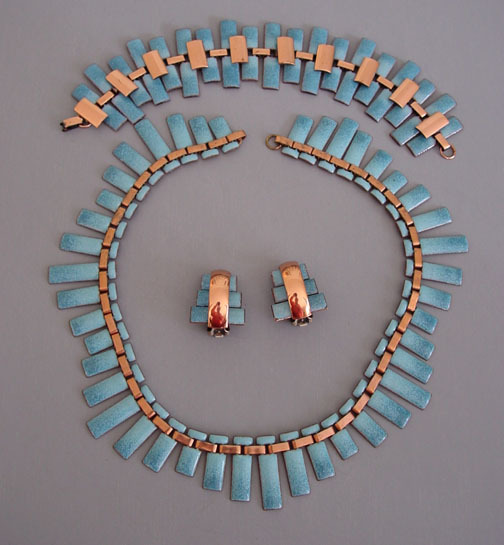 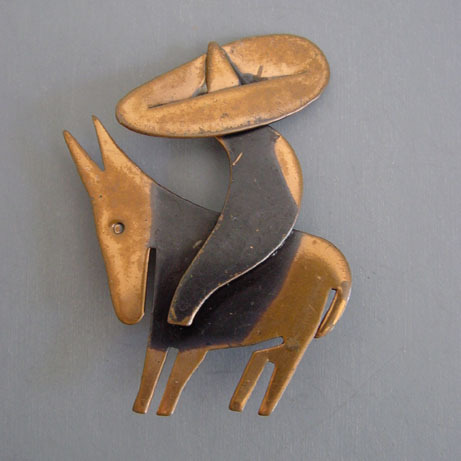 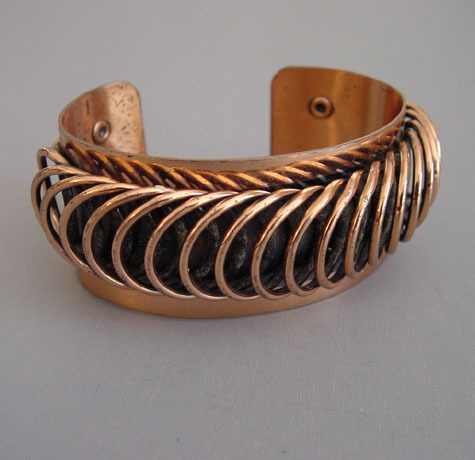 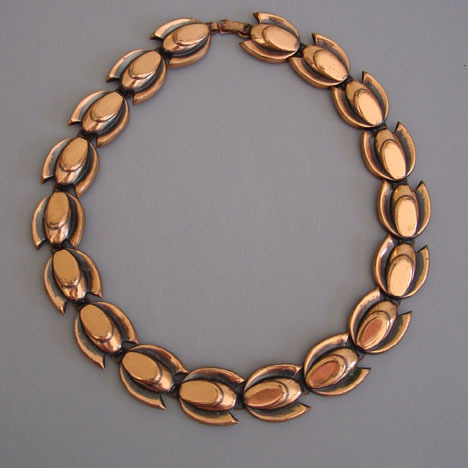 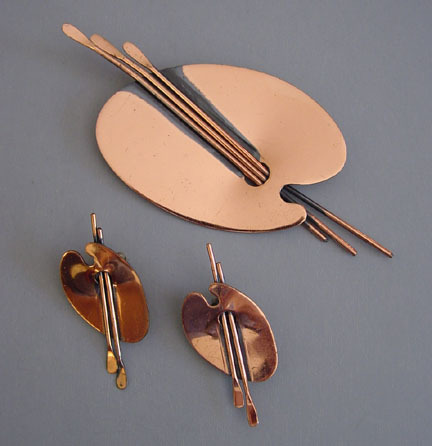 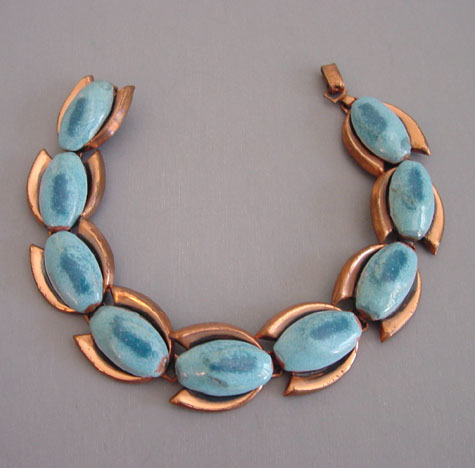 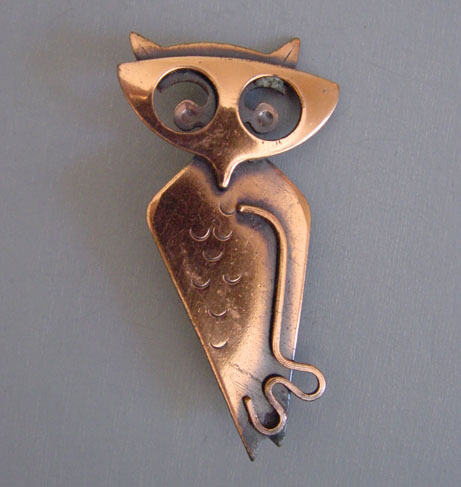 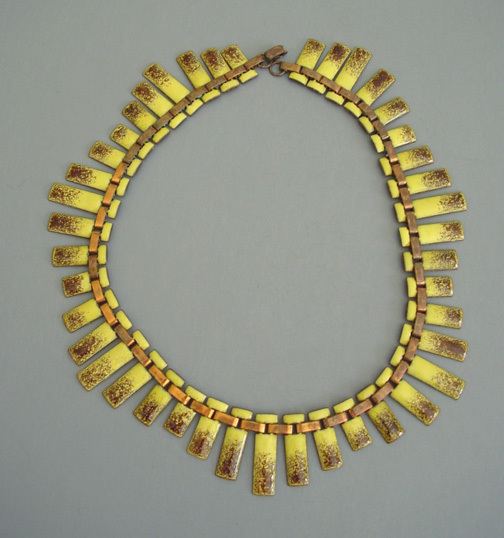 Frank (Francisco Torres) Rebajes was a mid-century modern jewelry maker in Greenwich, New York and later at 377 5th Avenue from 1937-1960s and his work was included in the famous "Messengers of Modernism Show". 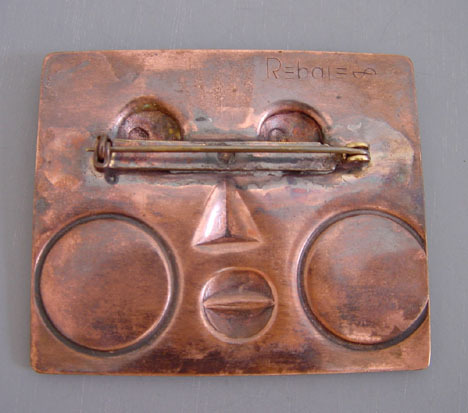 Rebajes was both a Bohemian and a successful entrepreneur and his designs, while reflecting ethnic motifs, we all original to him. 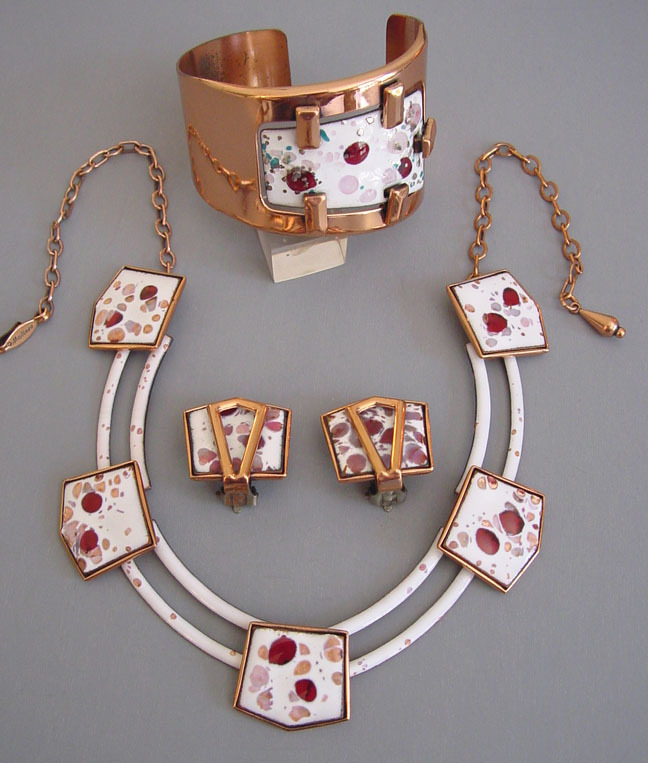 He made not only jewelry but plates, candlesticks, house wares and other decorative objects. 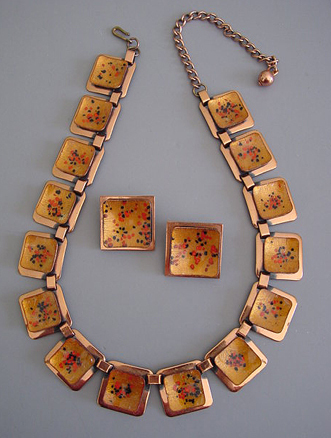 In the first few years he fashioned his pieces himself, but his popularity enabled him to hire a staff to bring his designs to life. 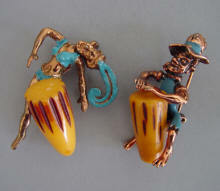 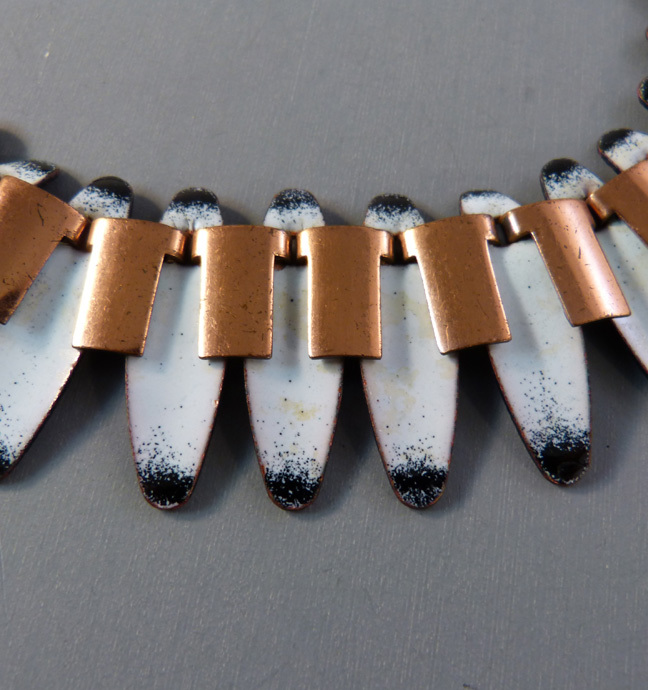 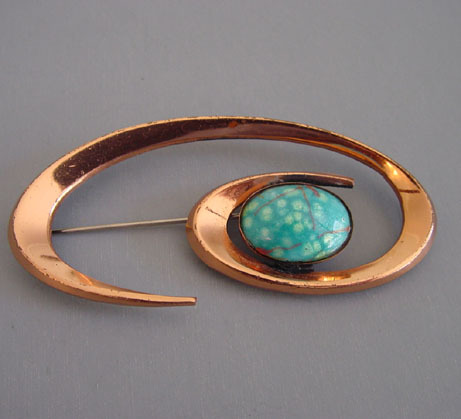 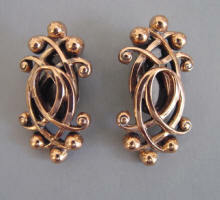 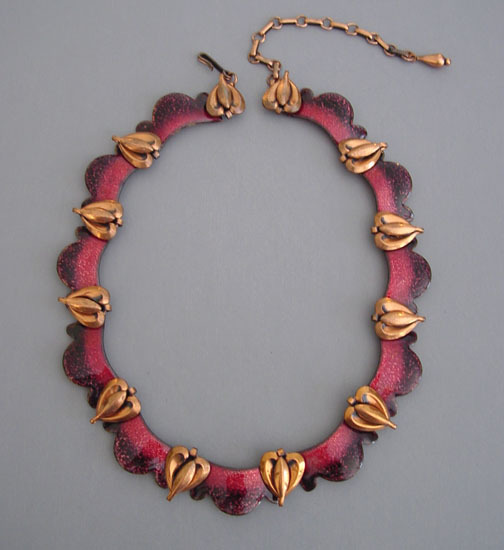 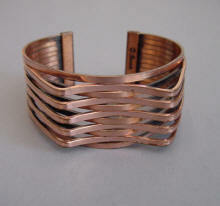 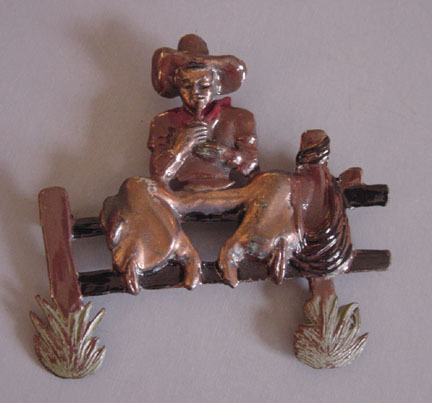 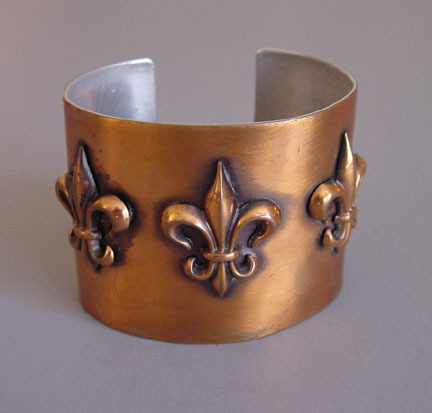 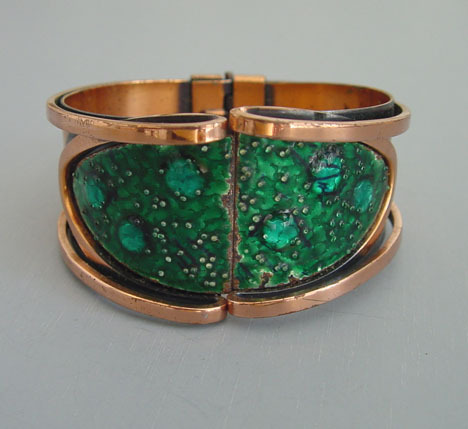 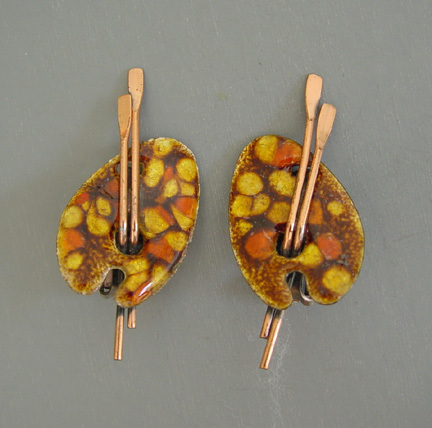 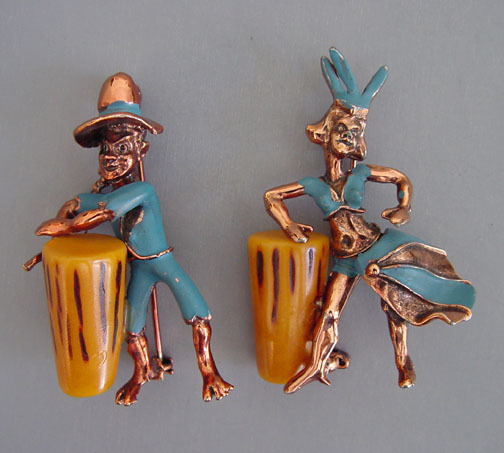 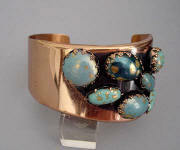 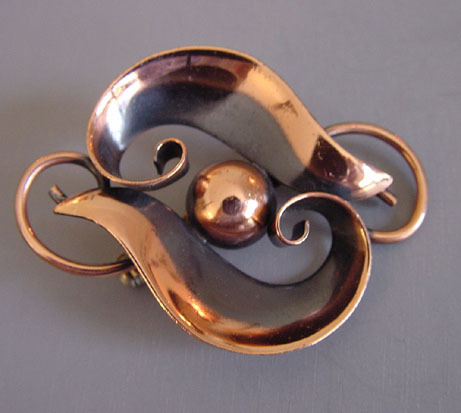 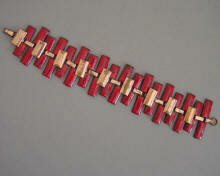 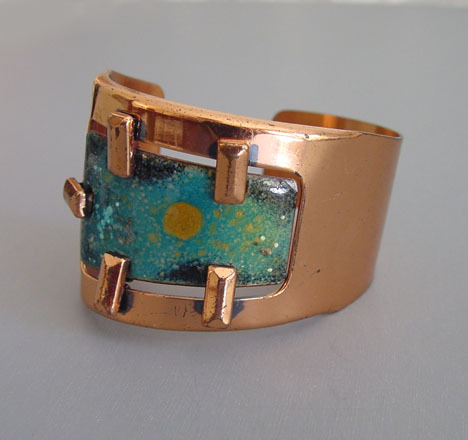 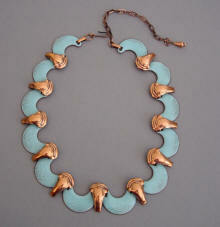 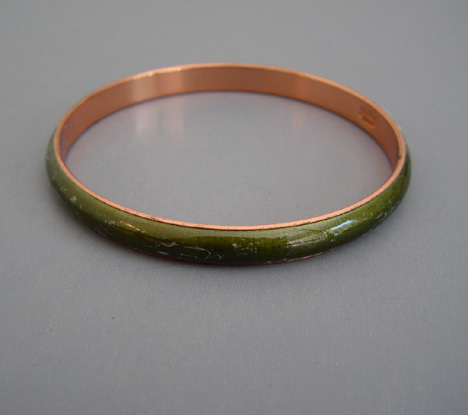 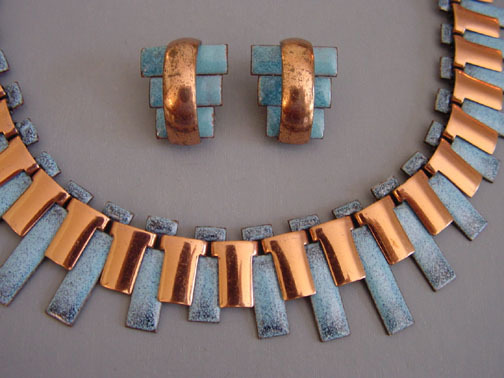 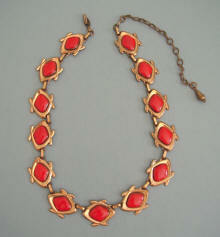 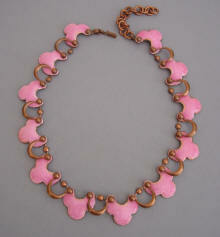 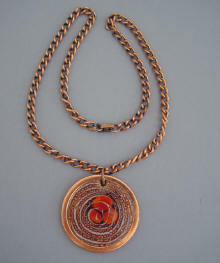 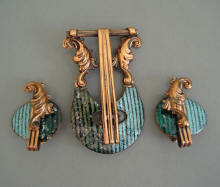 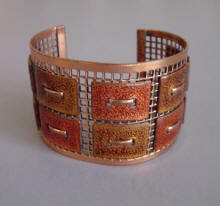 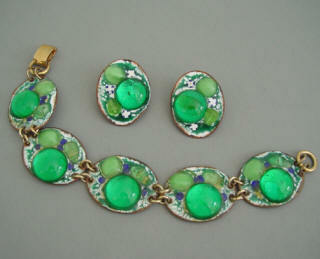 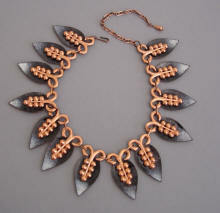 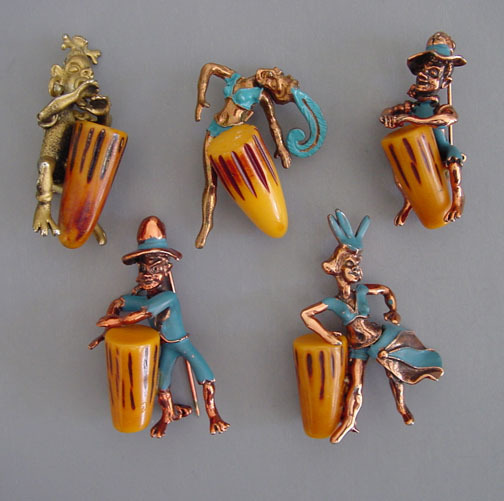 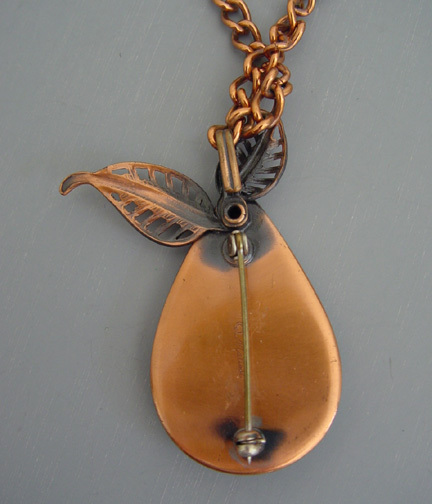 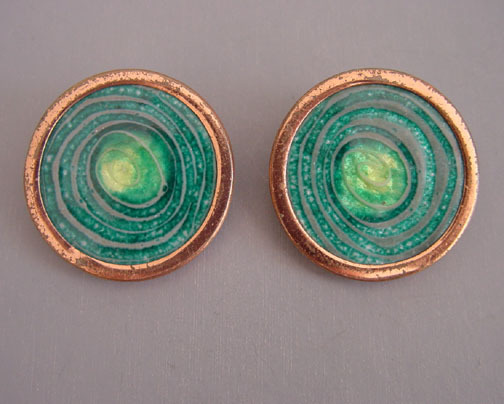 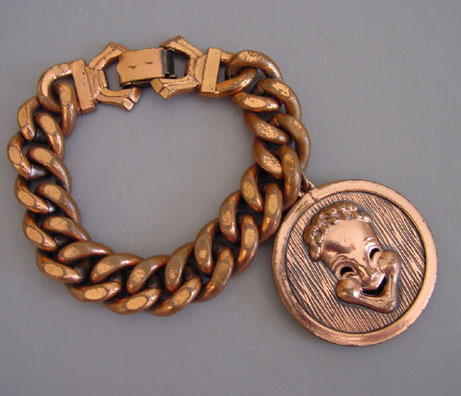 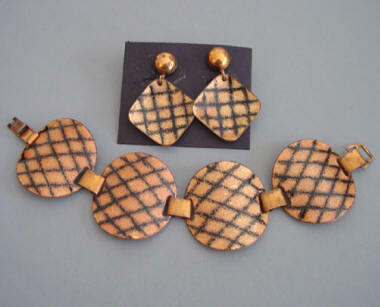 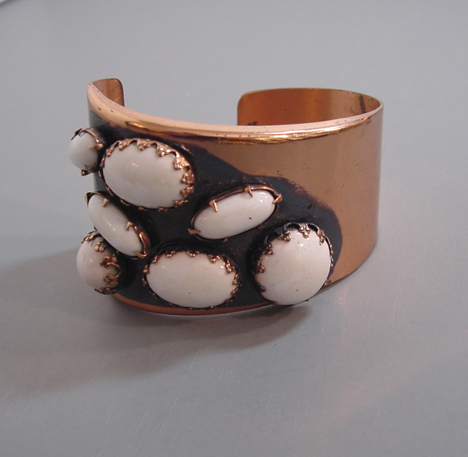 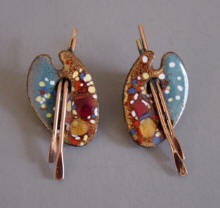 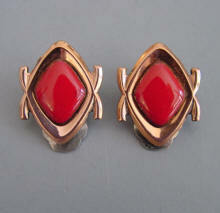 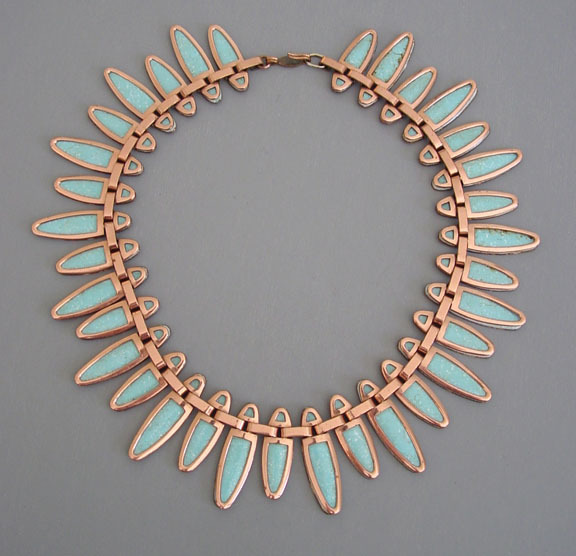 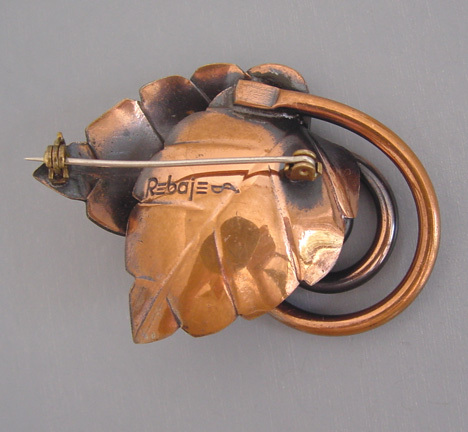 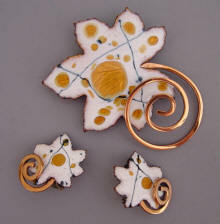 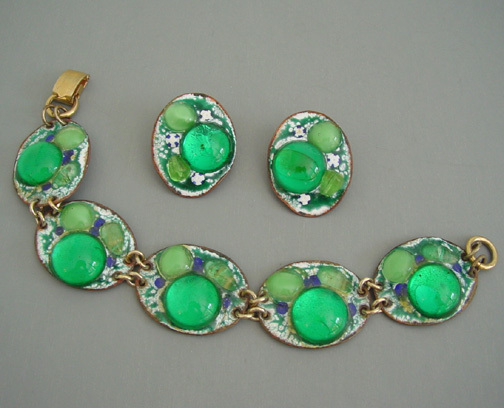 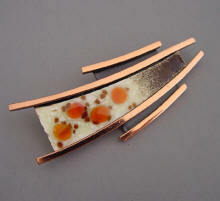 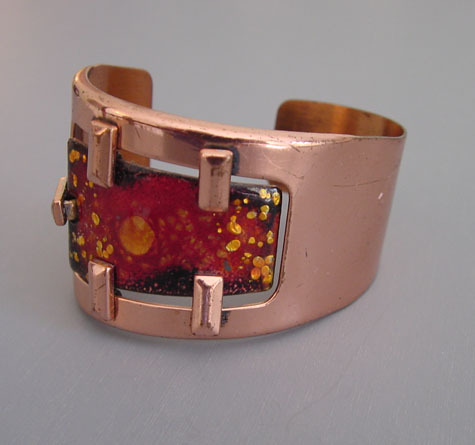 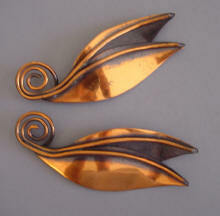 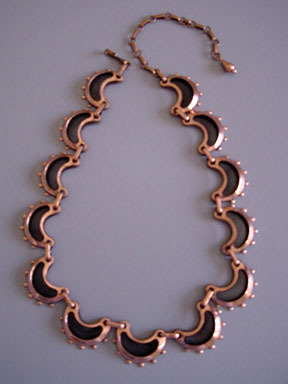 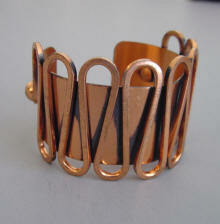 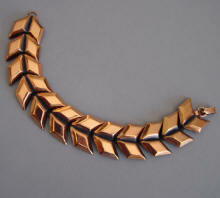 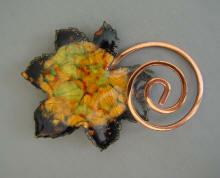 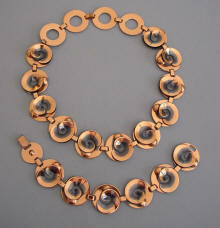 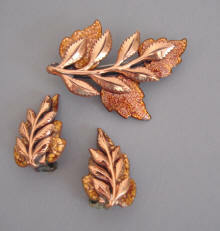 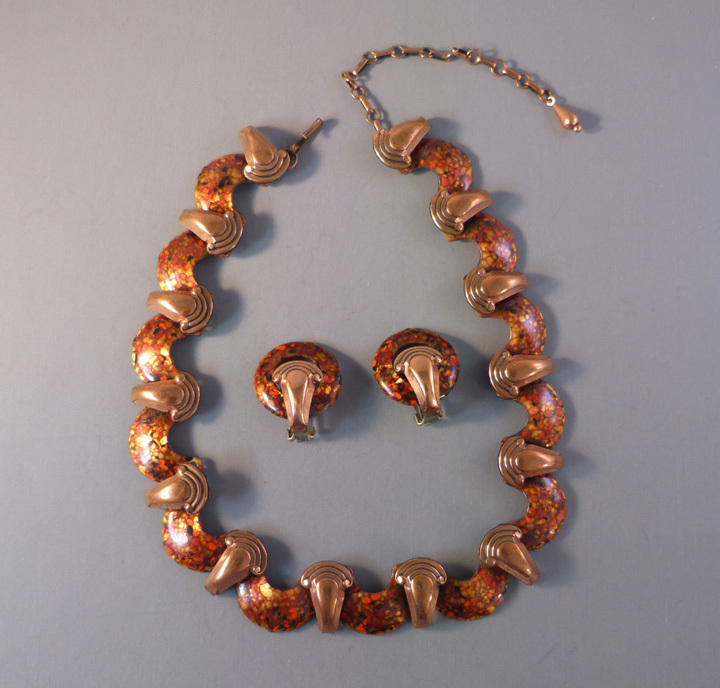 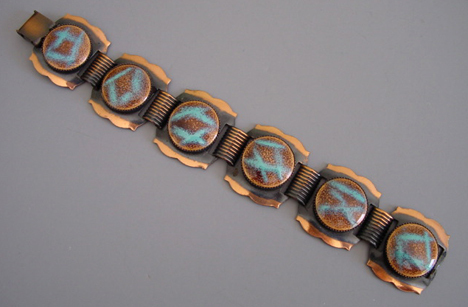 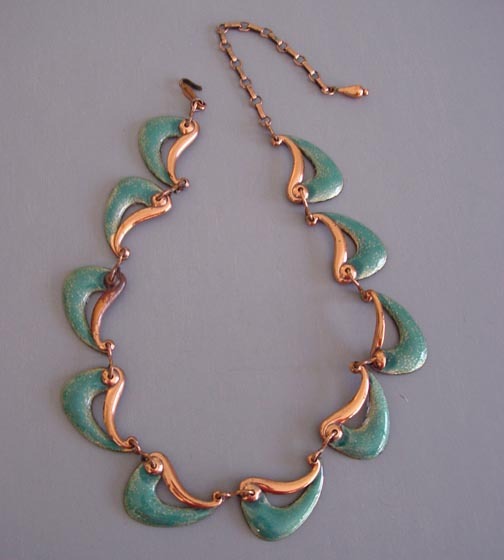 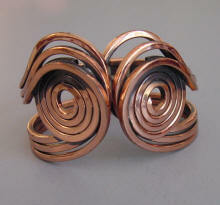 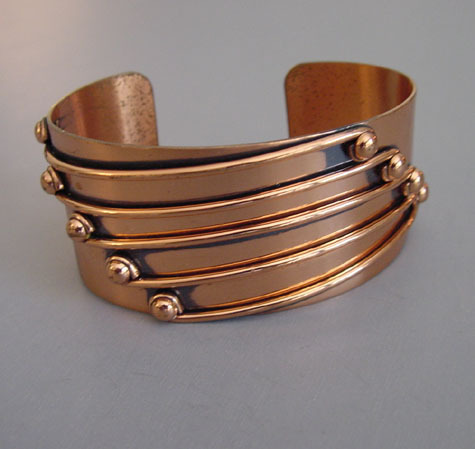 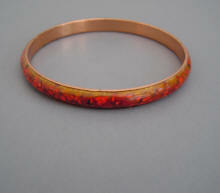 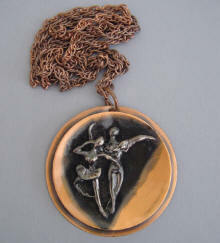 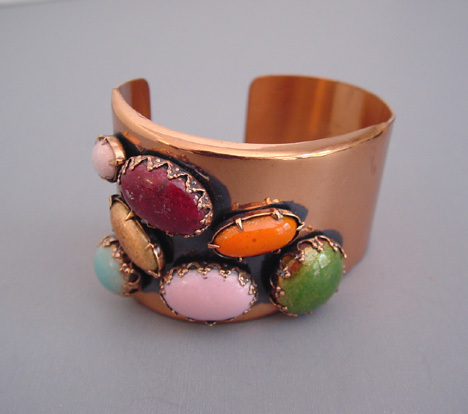 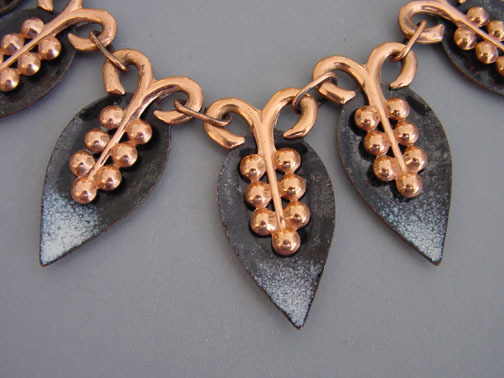 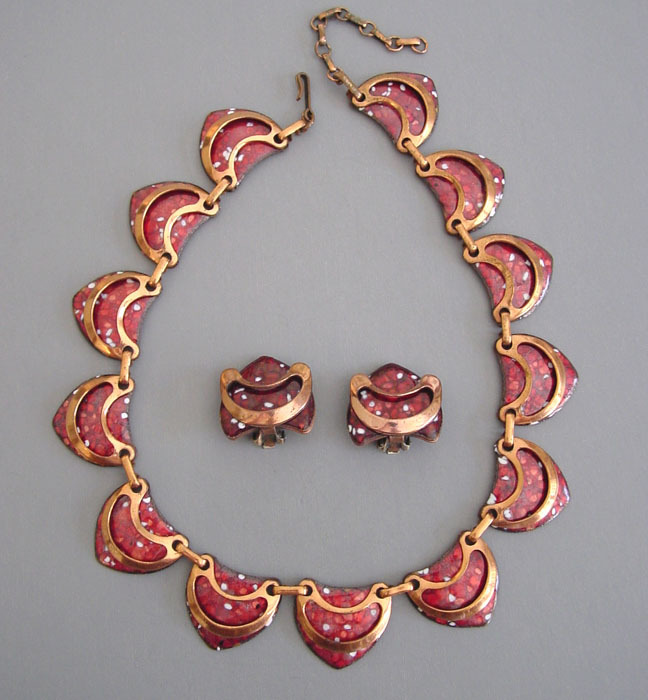 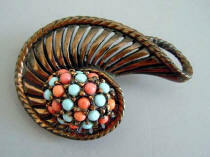 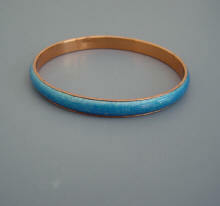 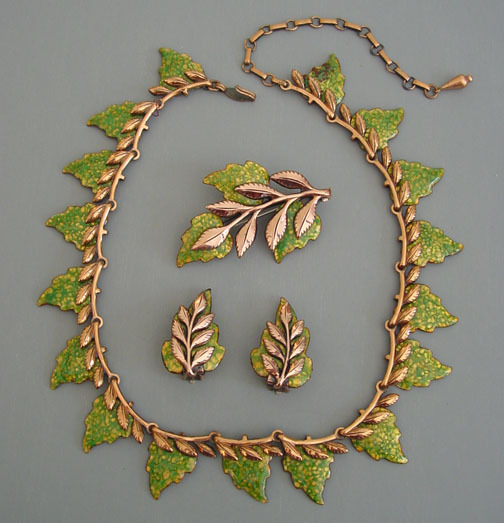 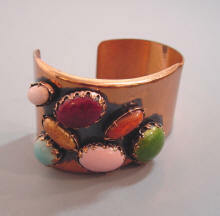 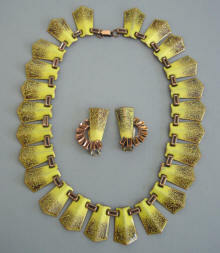 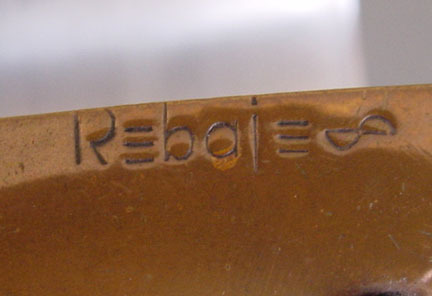 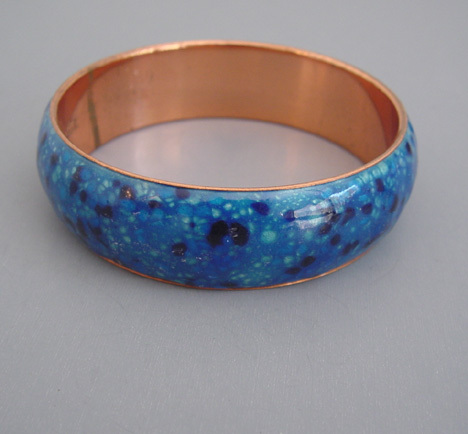 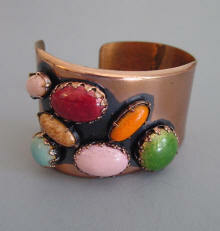 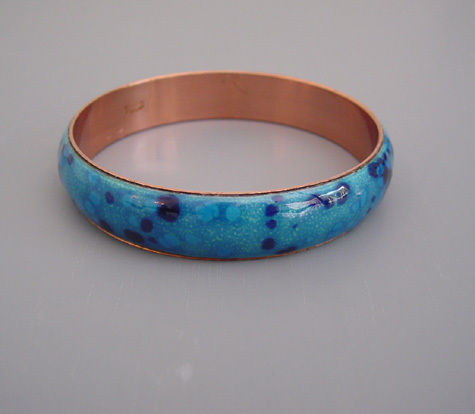 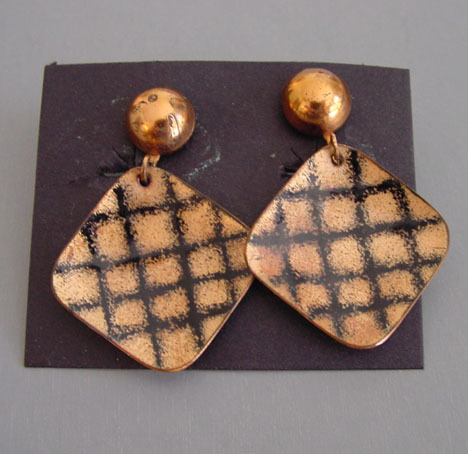 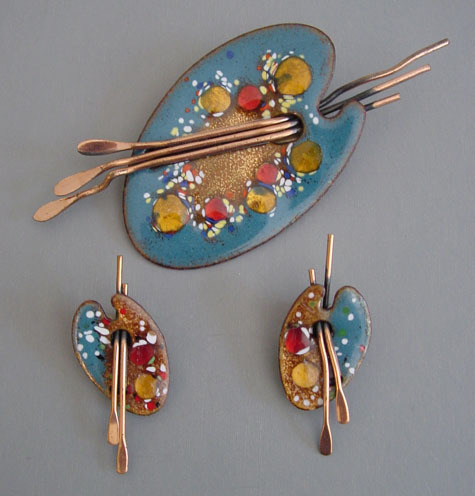 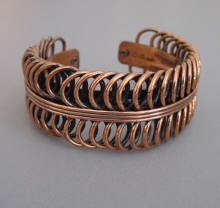 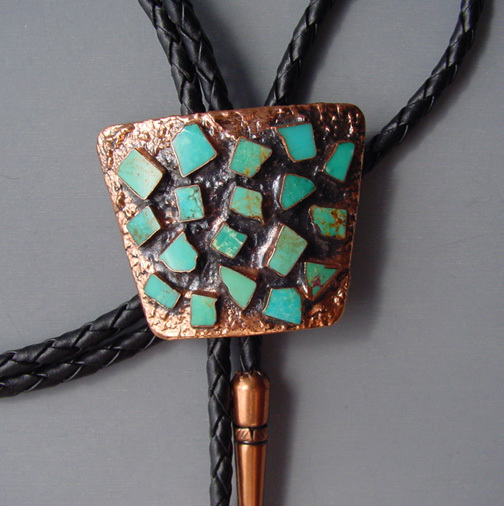 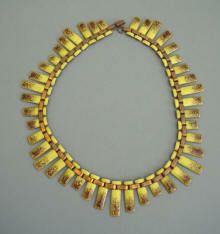 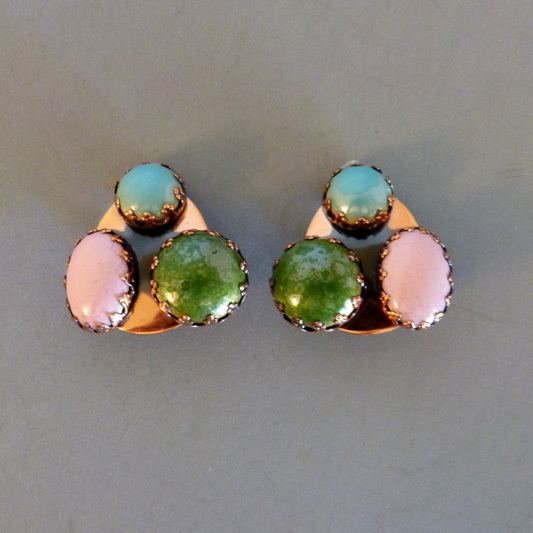 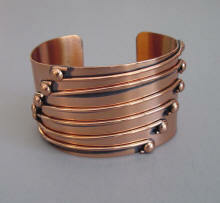 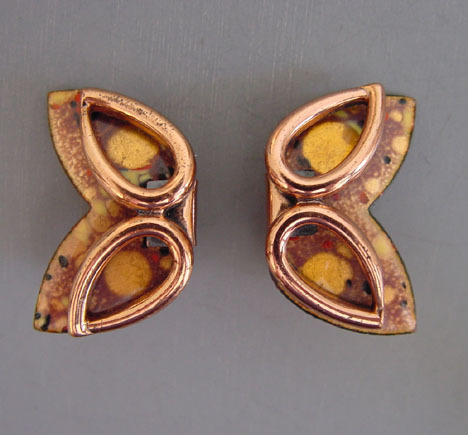 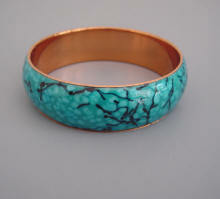 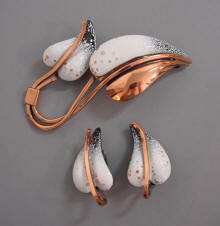 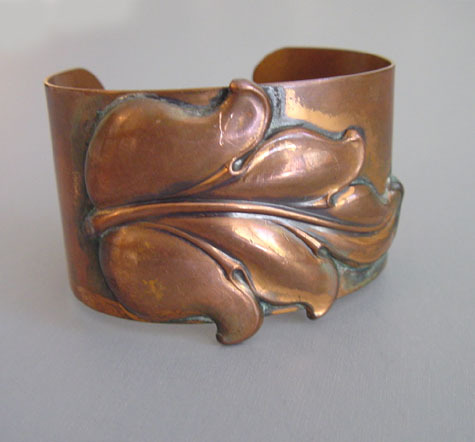 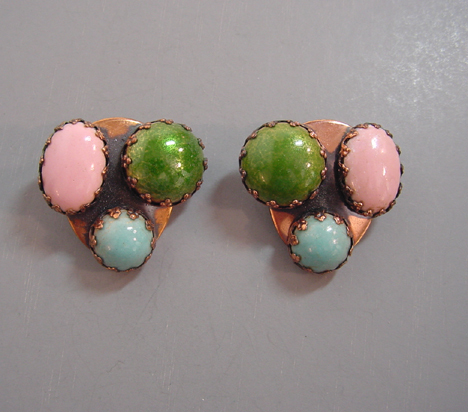 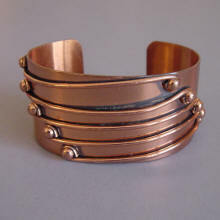 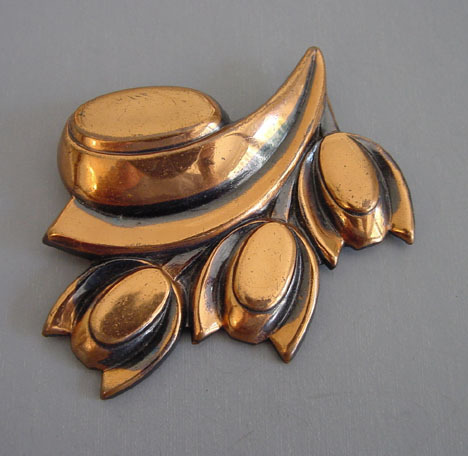 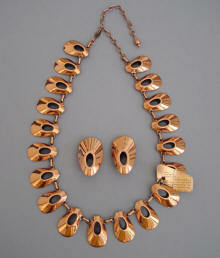 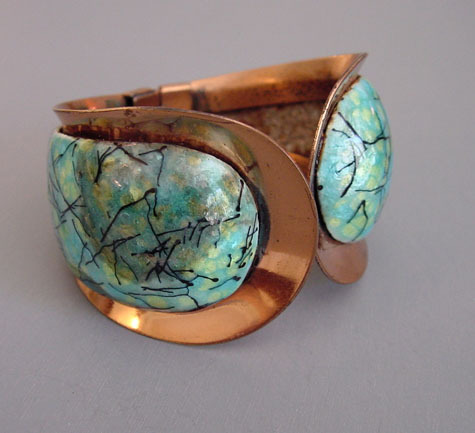 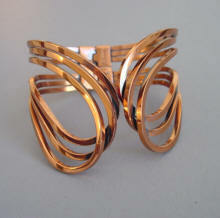 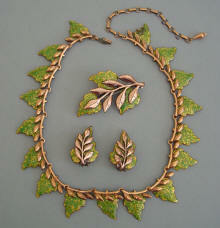 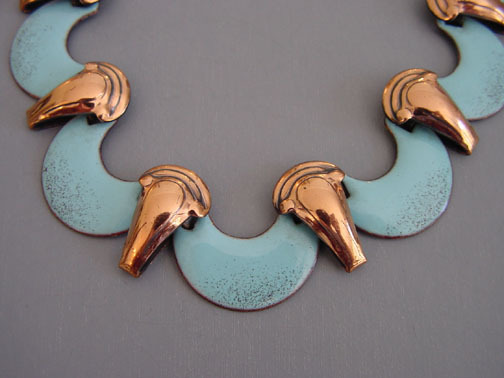 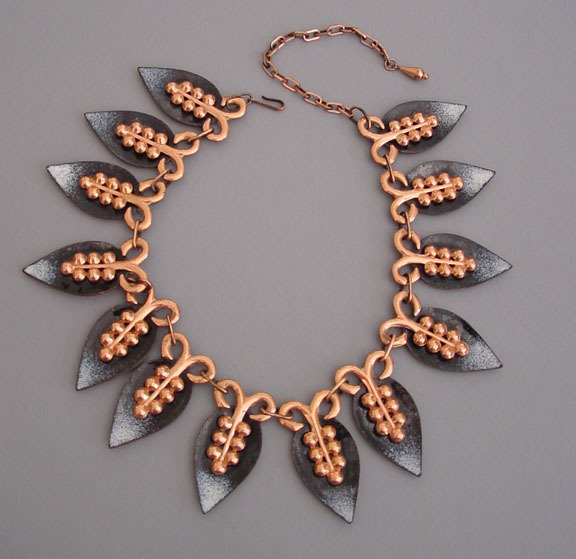 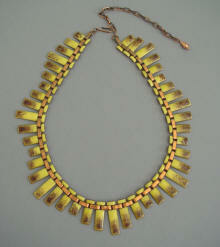 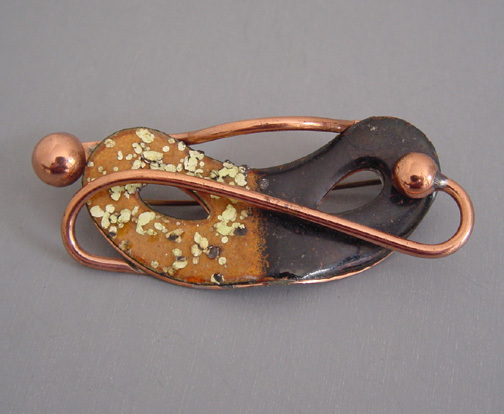 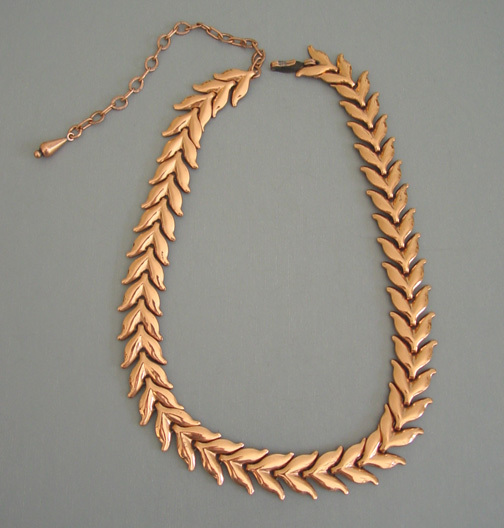 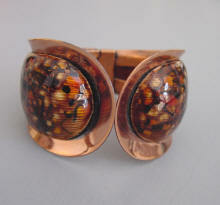 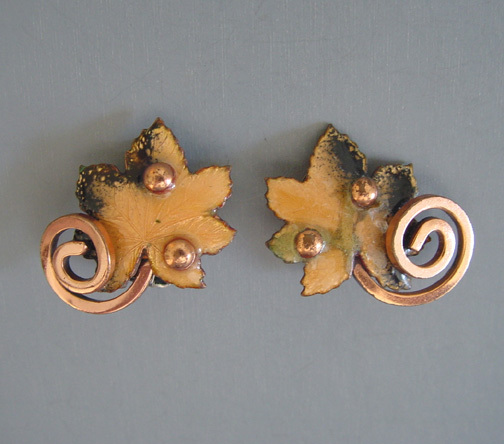 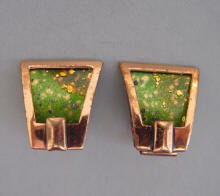 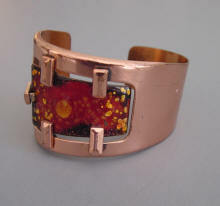 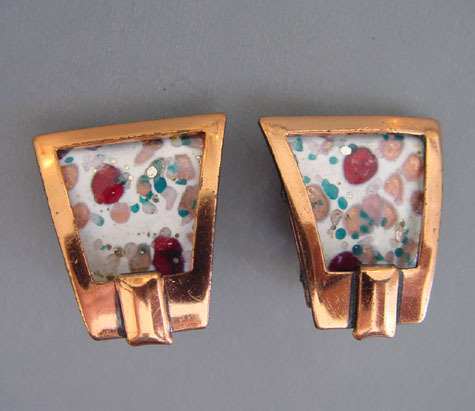 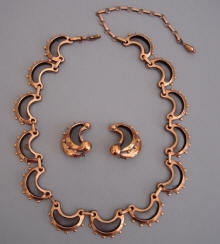 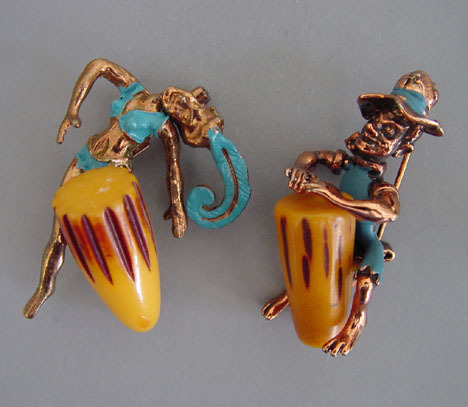 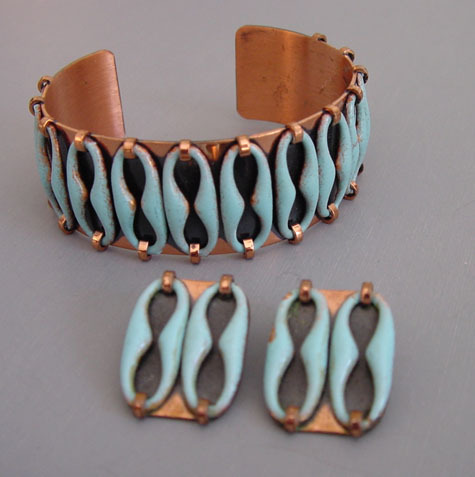 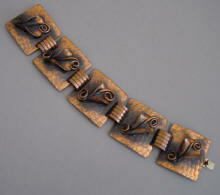 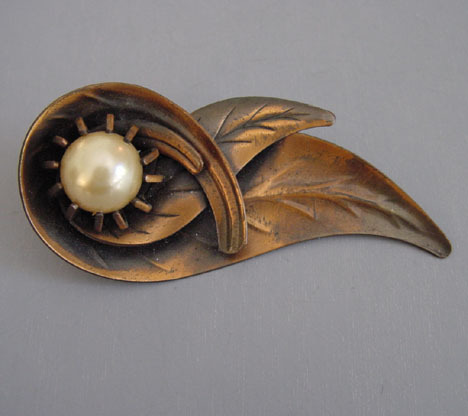 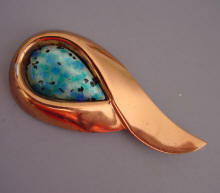 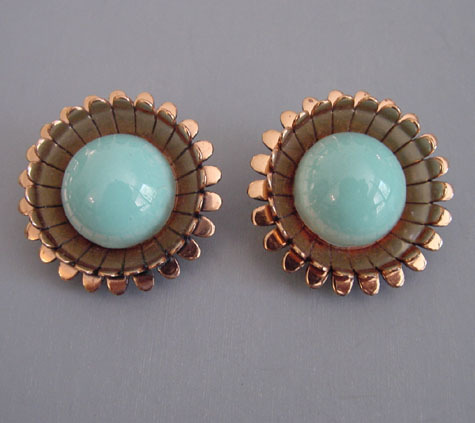 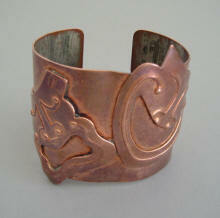 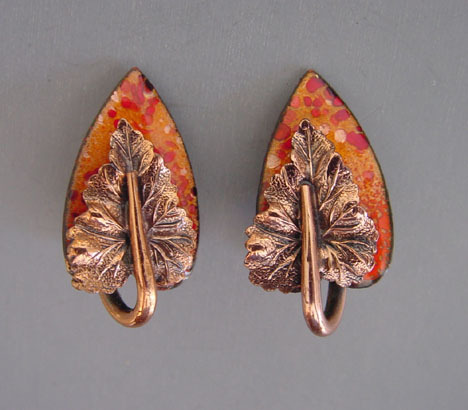 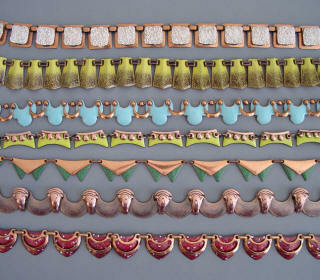 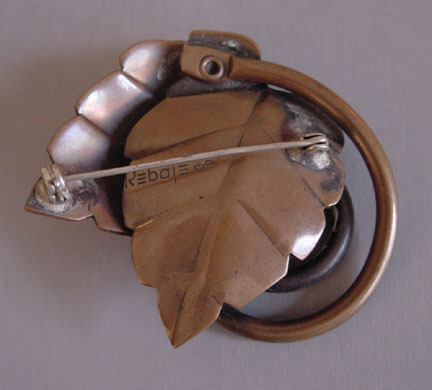 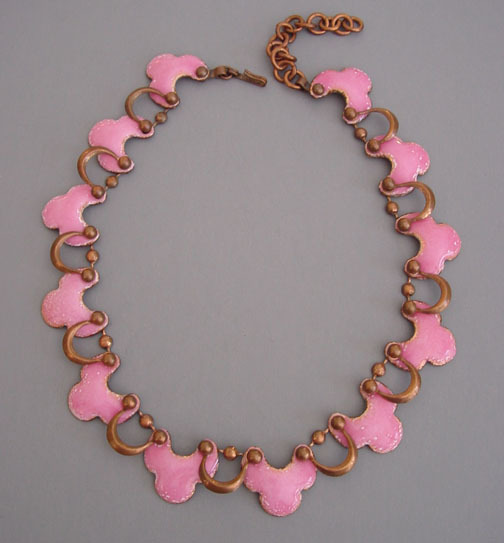 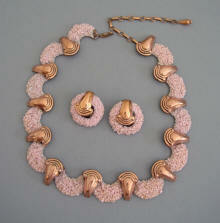 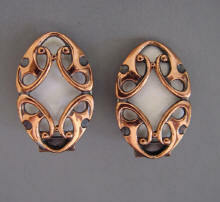 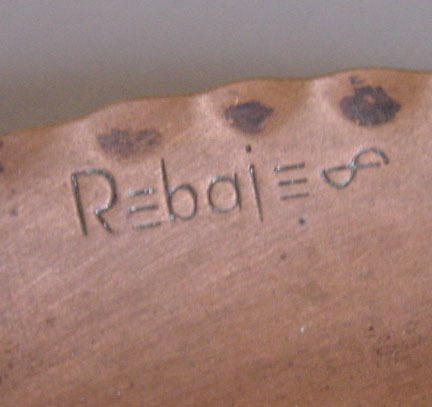 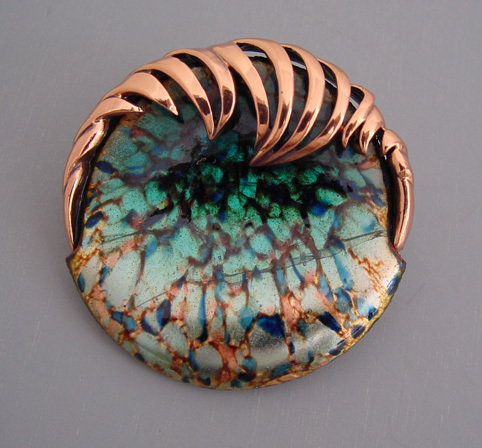 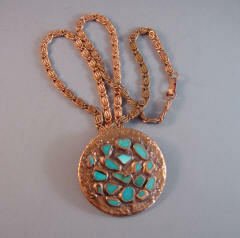 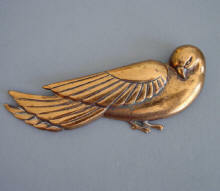 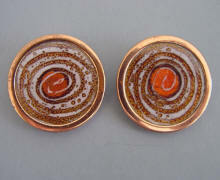 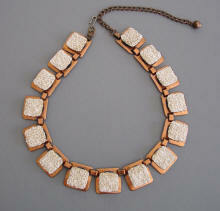 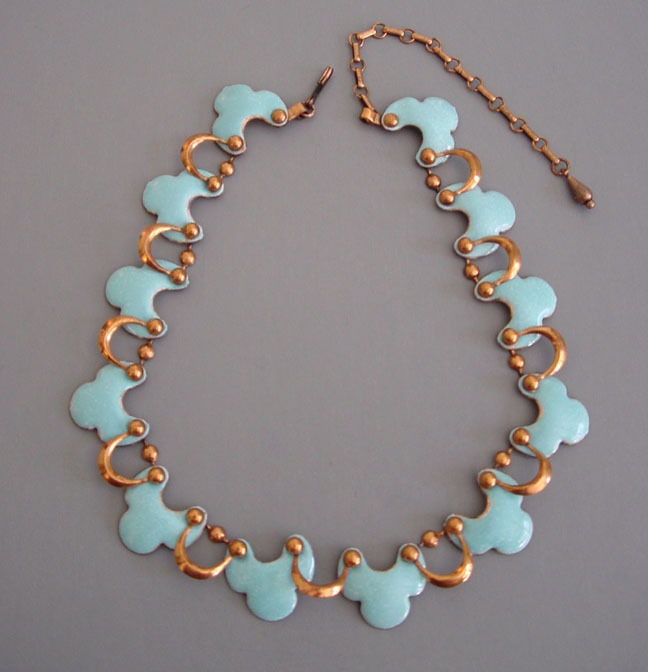 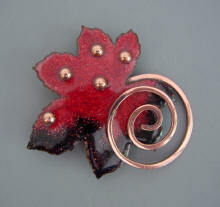 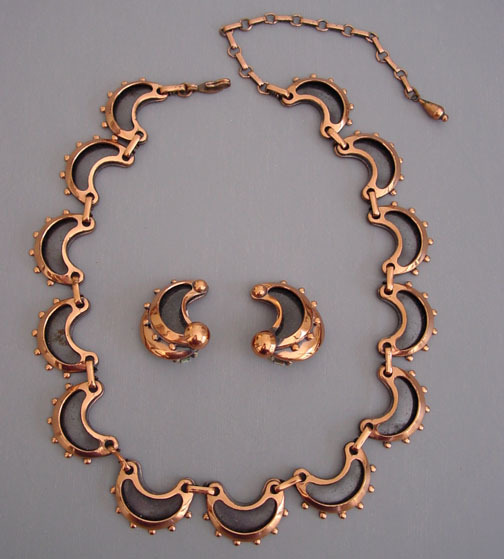 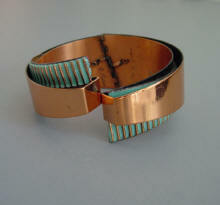 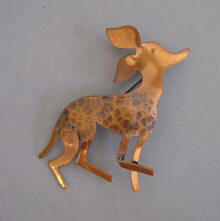 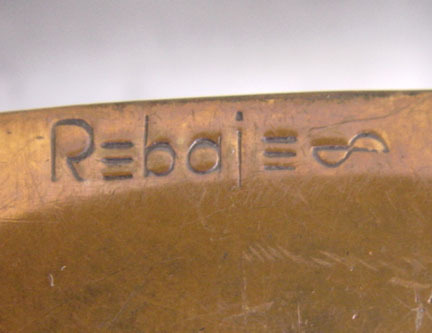 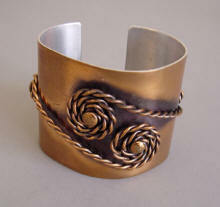 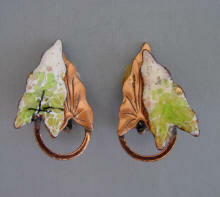 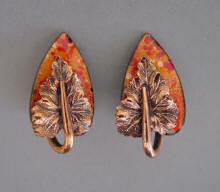 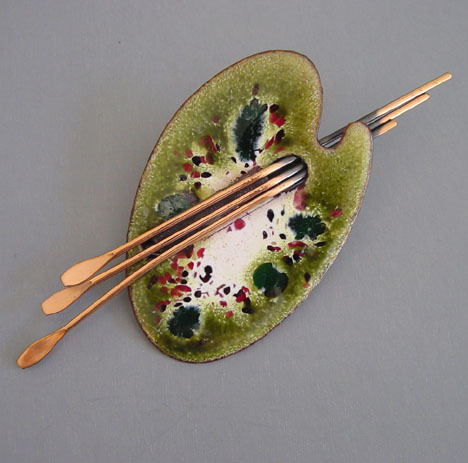 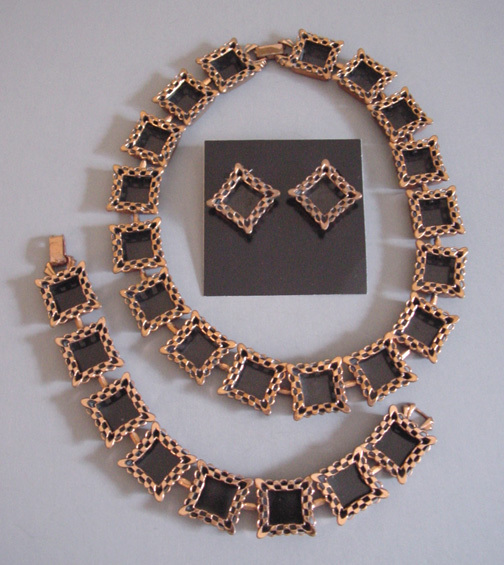 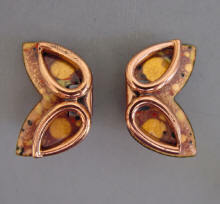 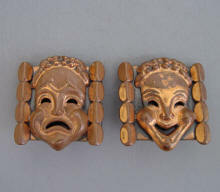 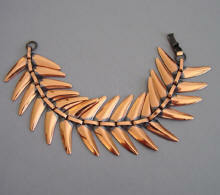 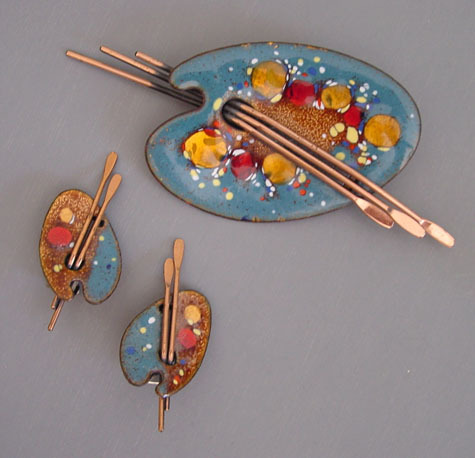 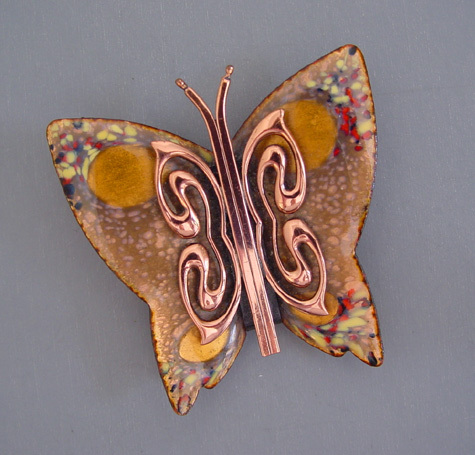 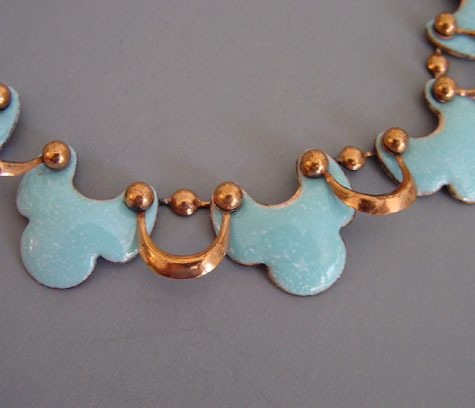 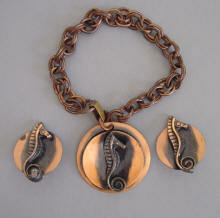 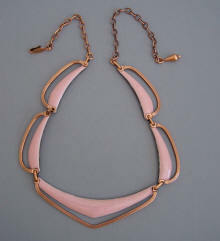 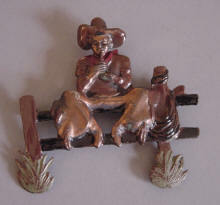 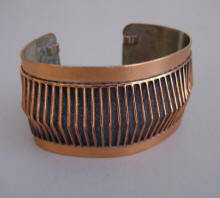 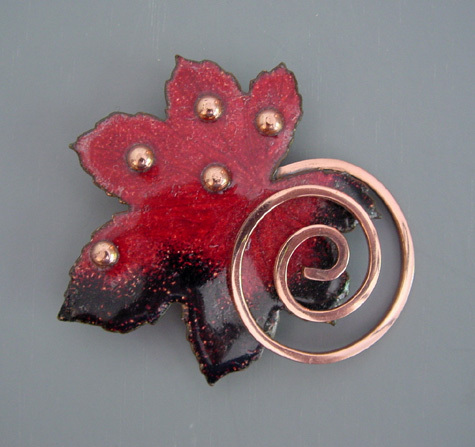 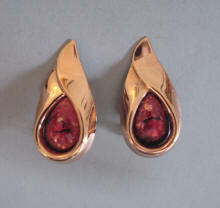 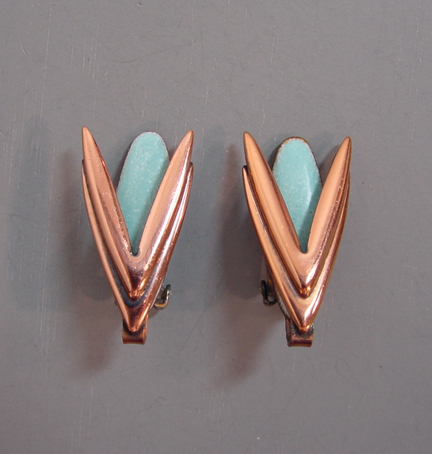 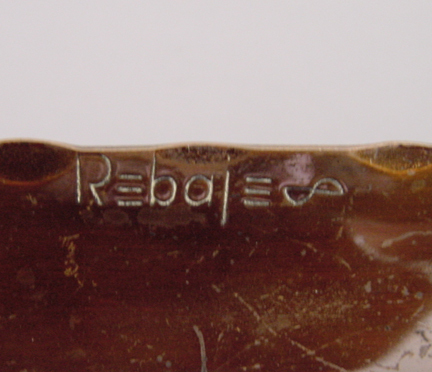 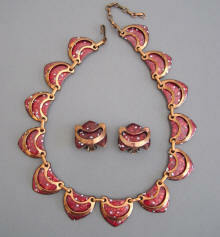 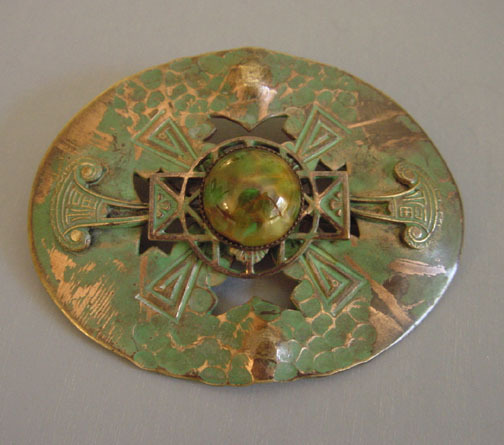 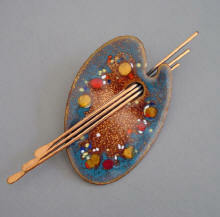 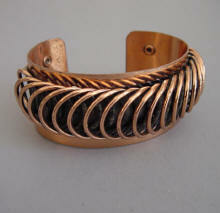 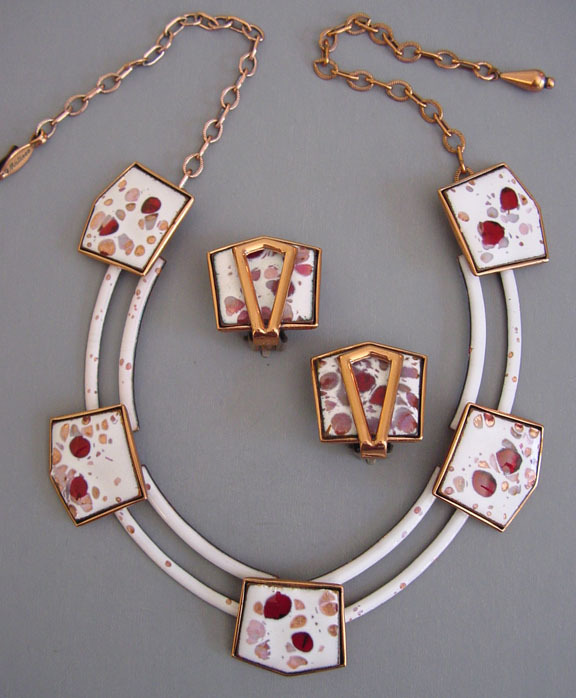 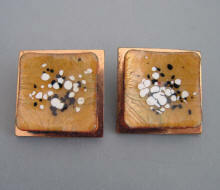 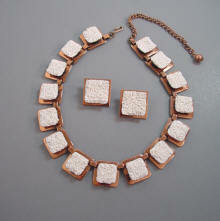 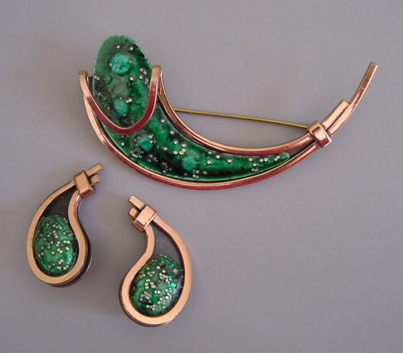 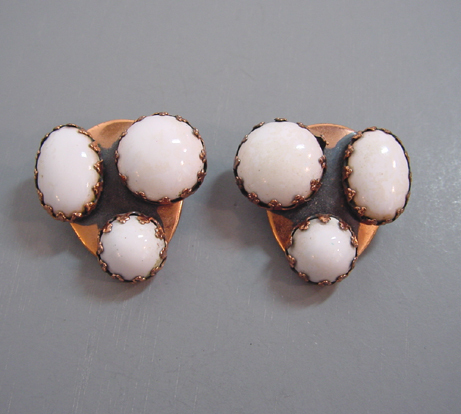 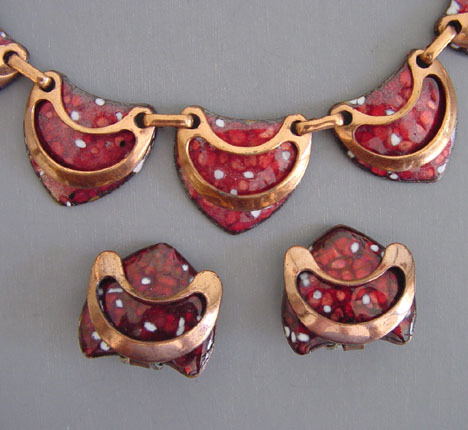 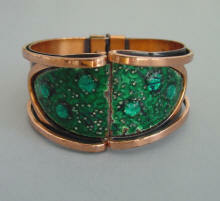 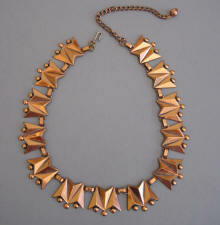 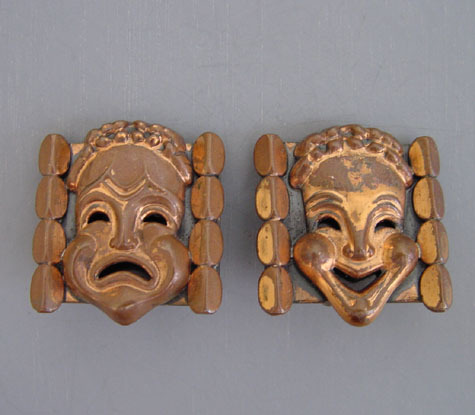 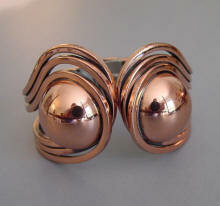 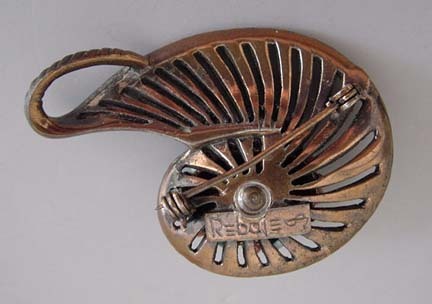 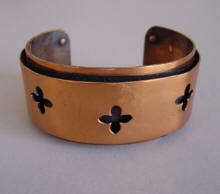 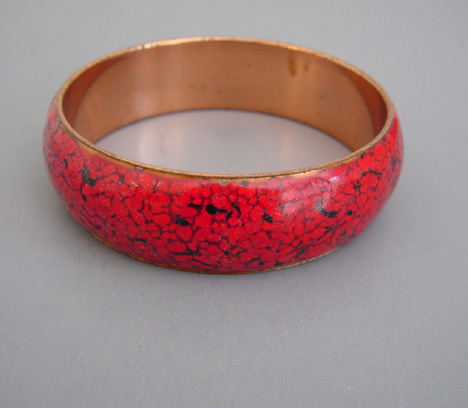 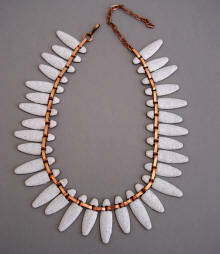 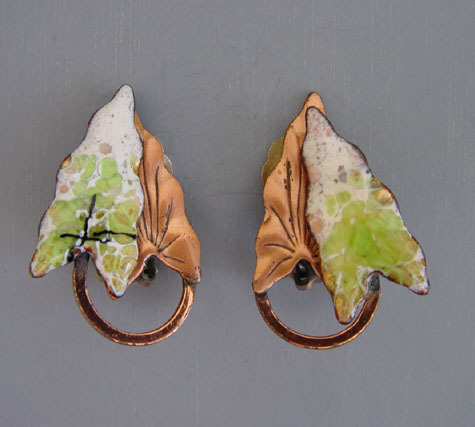 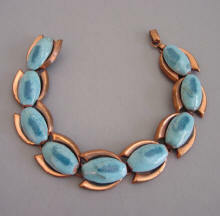 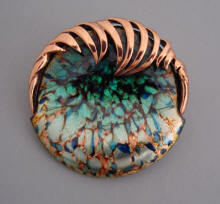 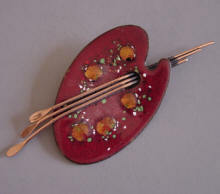 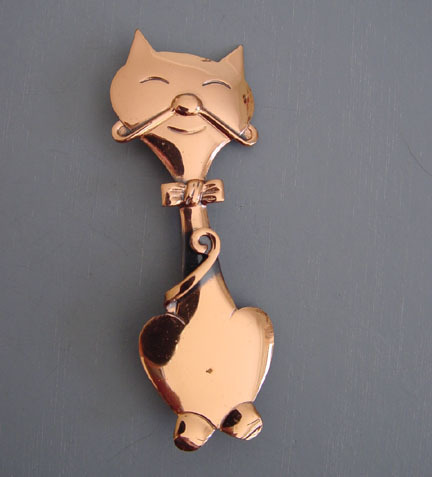 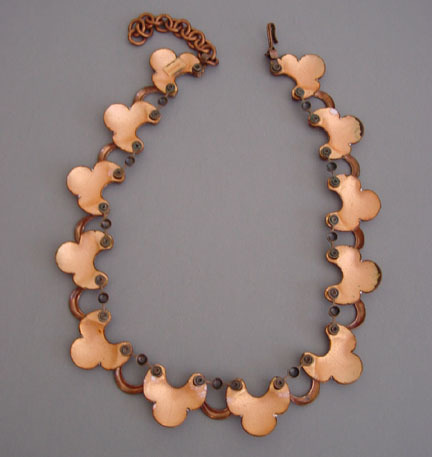 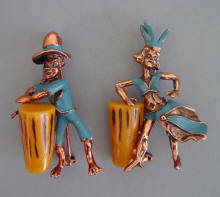 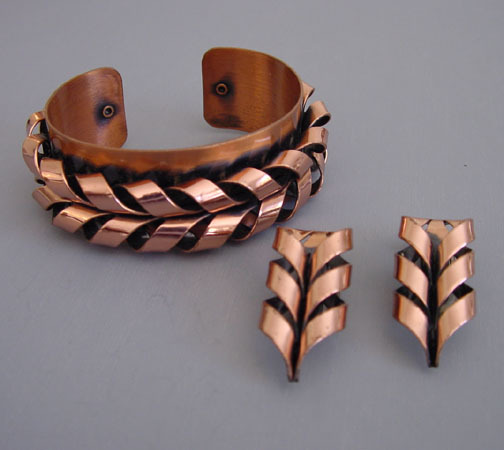 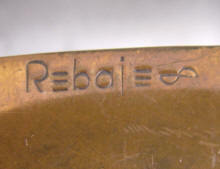 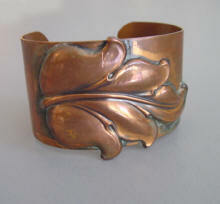 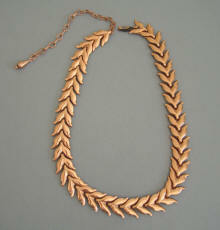 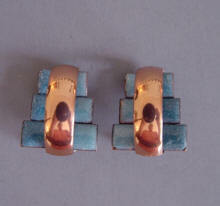 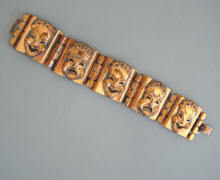 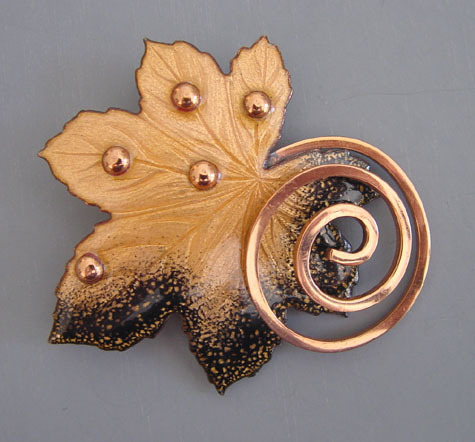 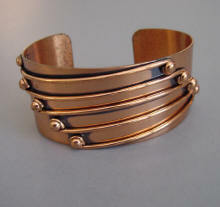 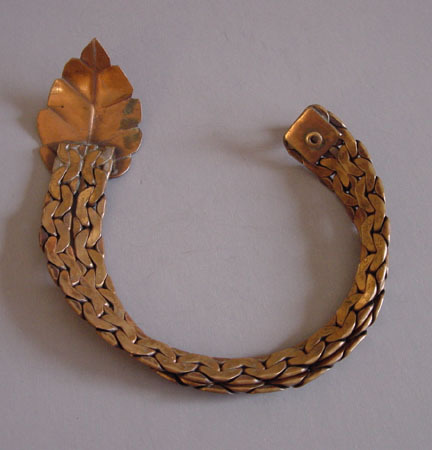 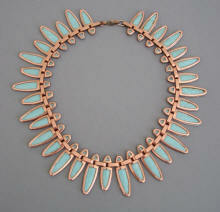 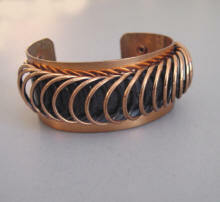 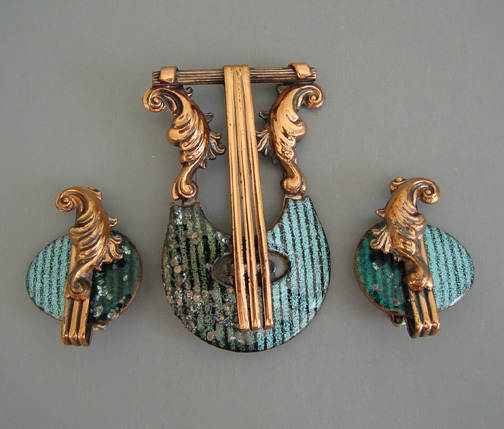 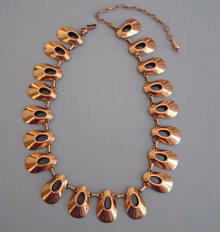 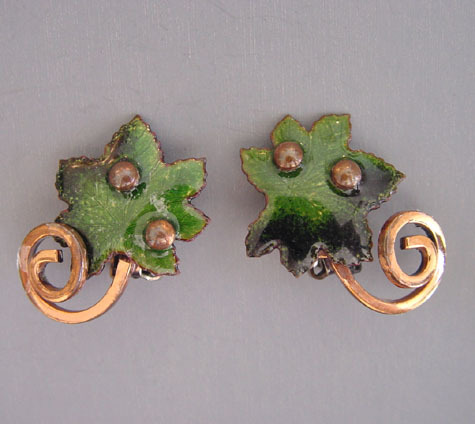 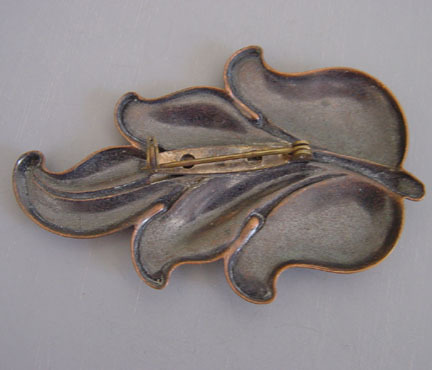 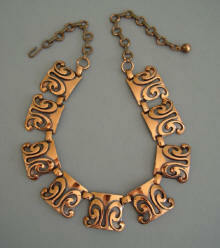 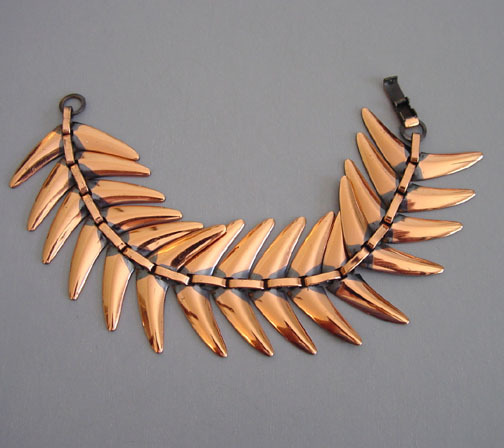 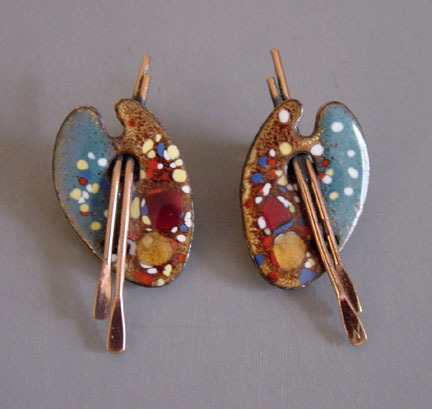 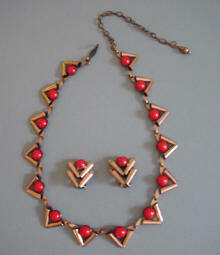 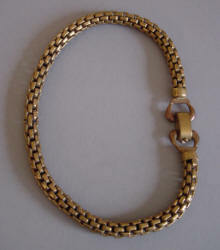 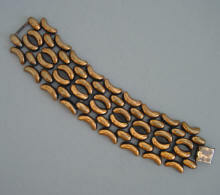 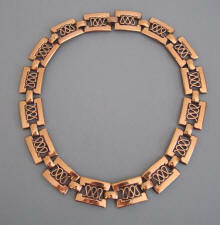 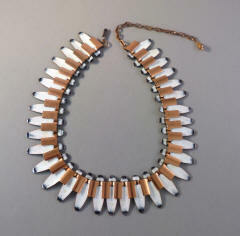 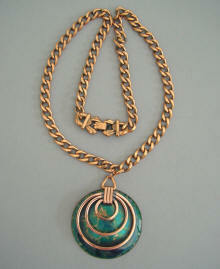 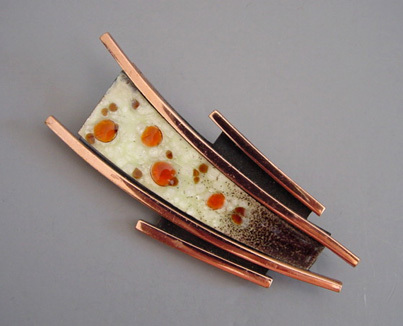 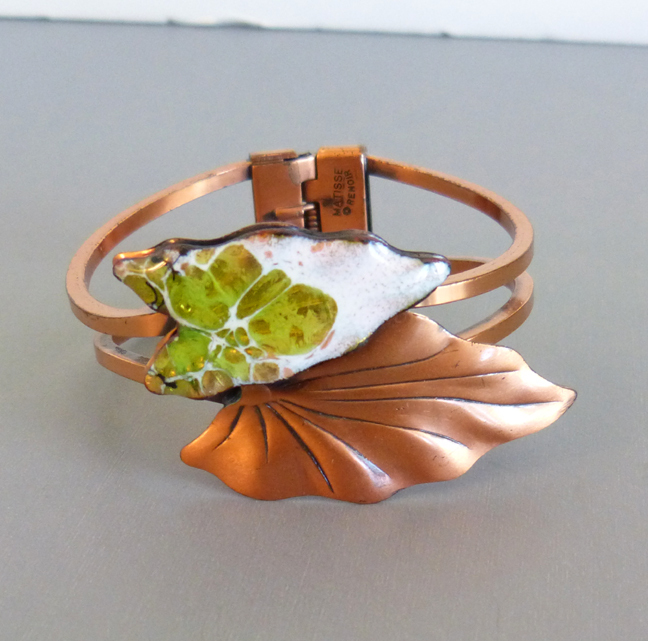 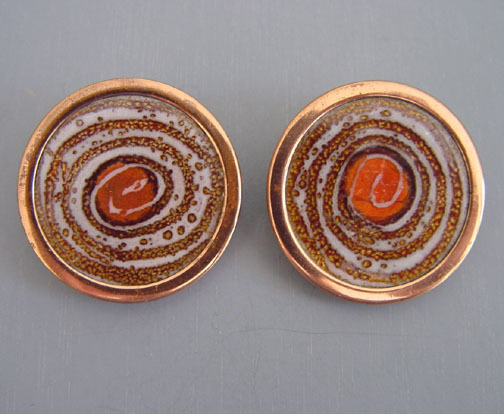 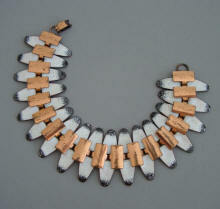 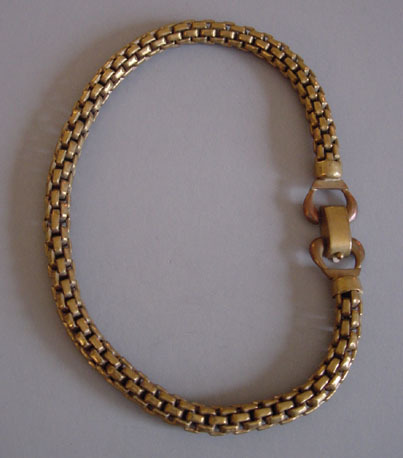 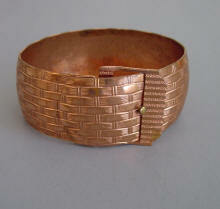 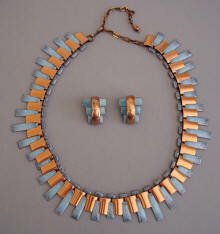 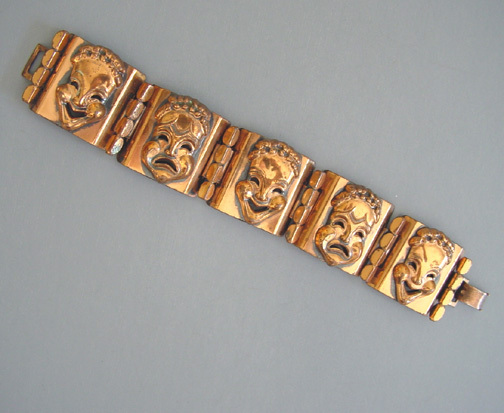 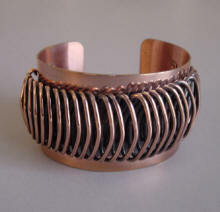 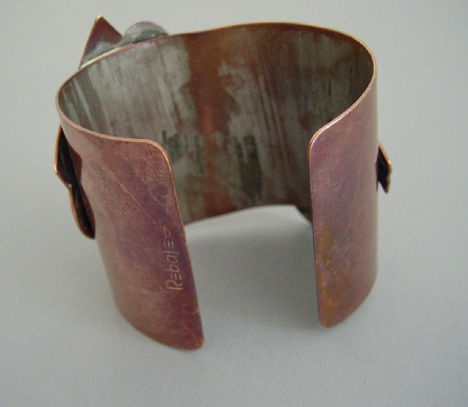 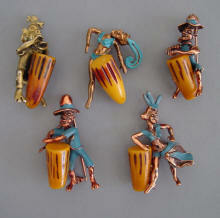 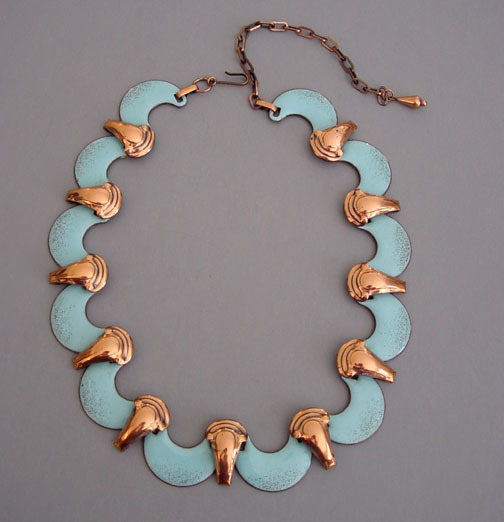 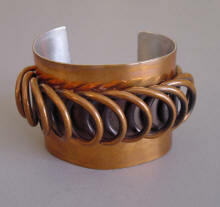 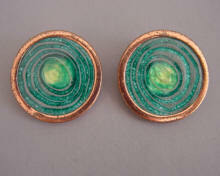 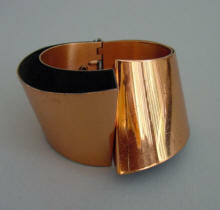 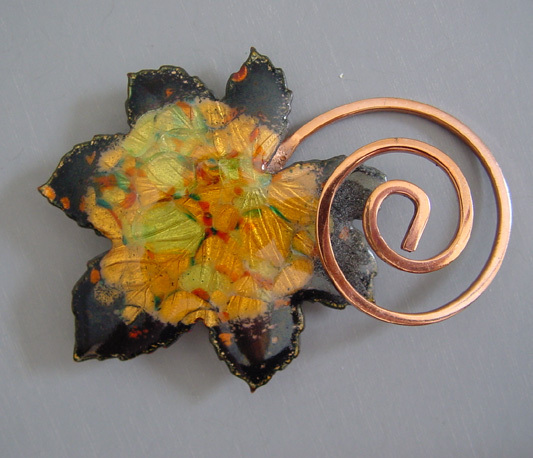 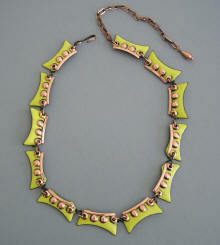 Rebajes also worked in silver and, very rarely, in copper with enameling, brass and even gold. 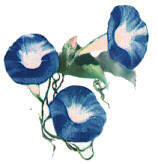 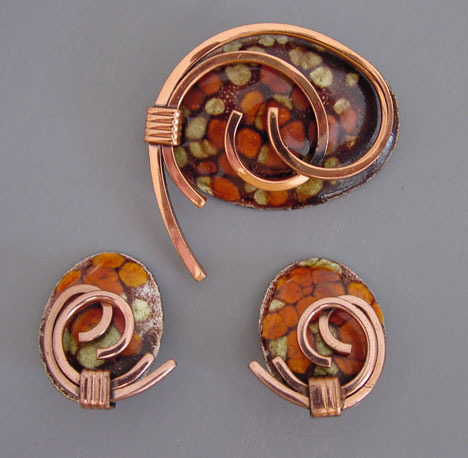 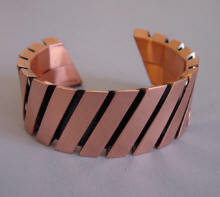 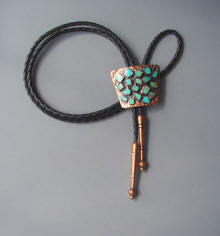 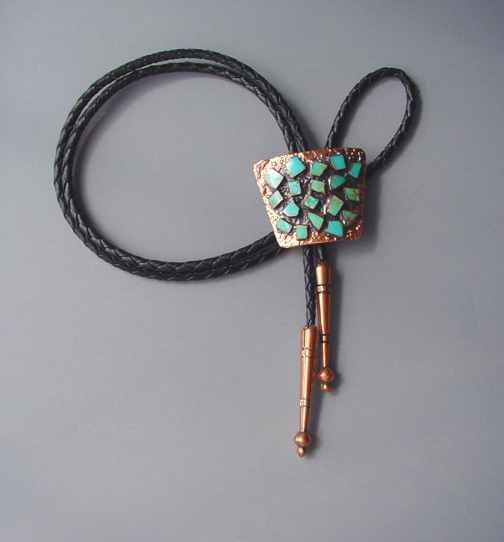 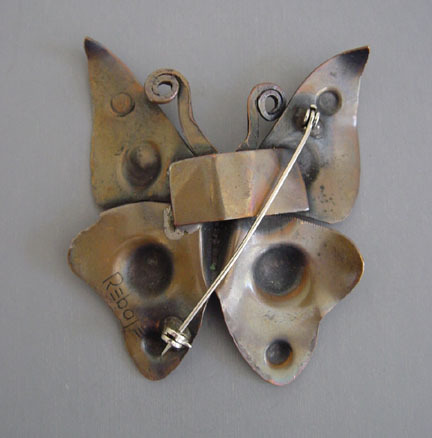 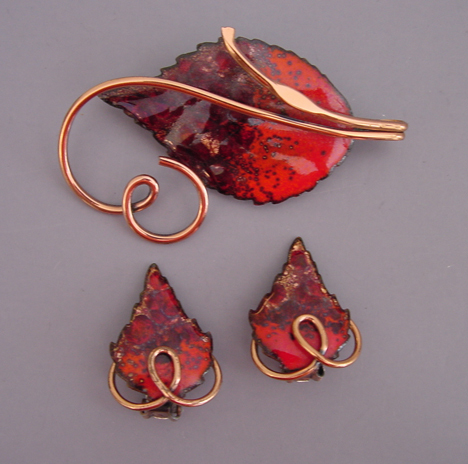 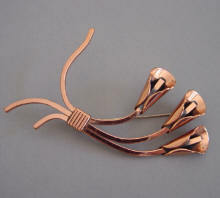 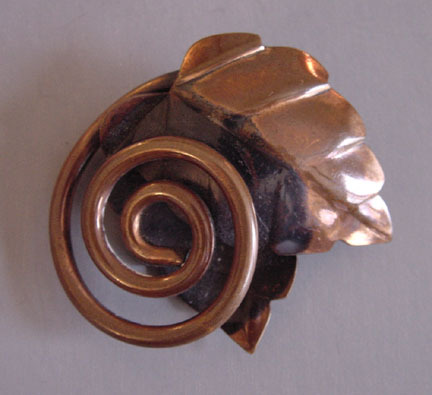 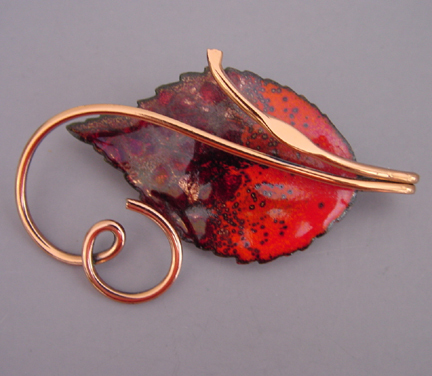 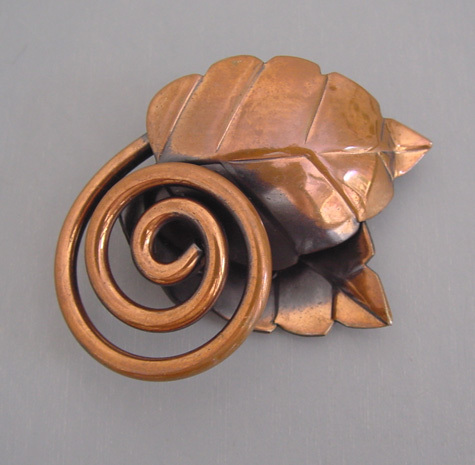 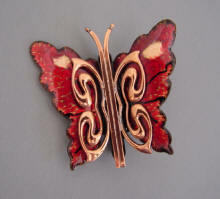 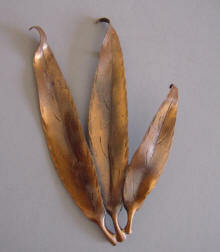 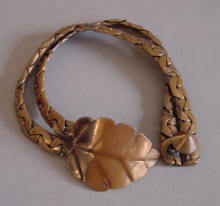 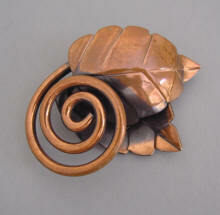 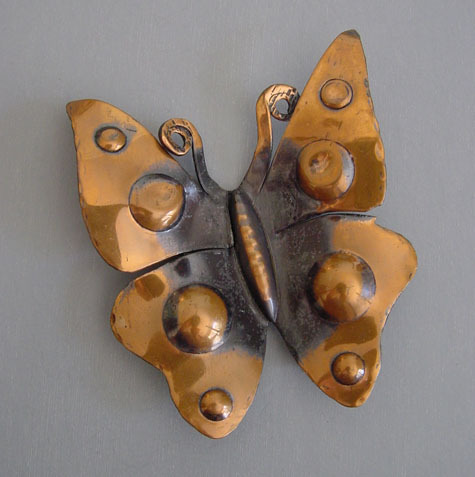 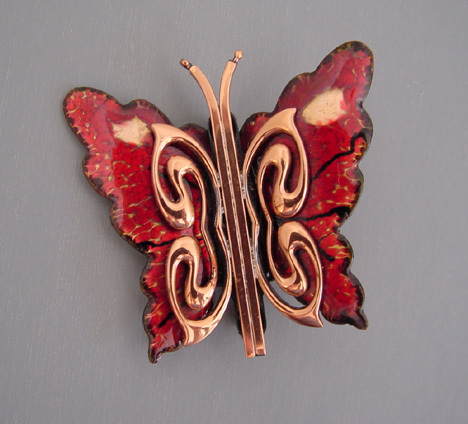 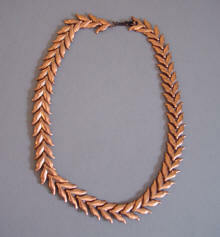 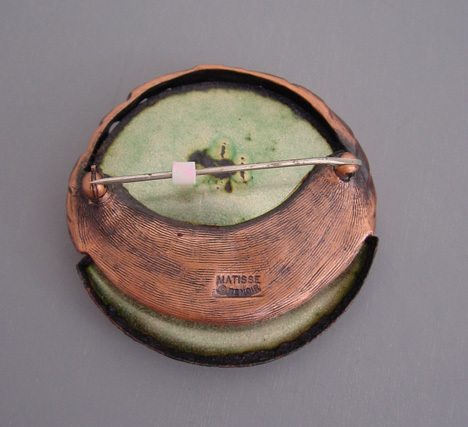 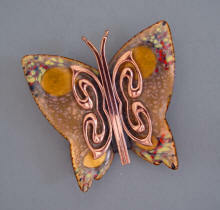 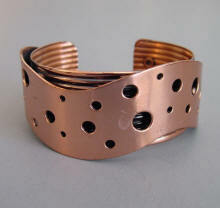 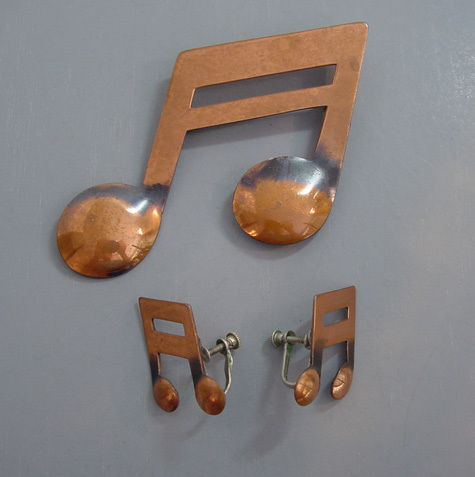 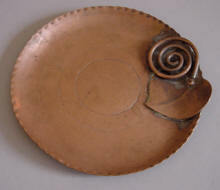 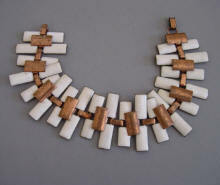 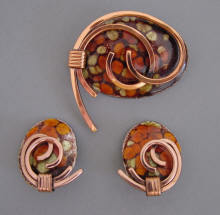 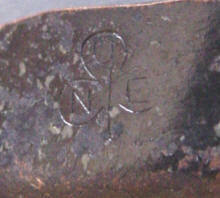 He occasionally used objects from nature with his copper. 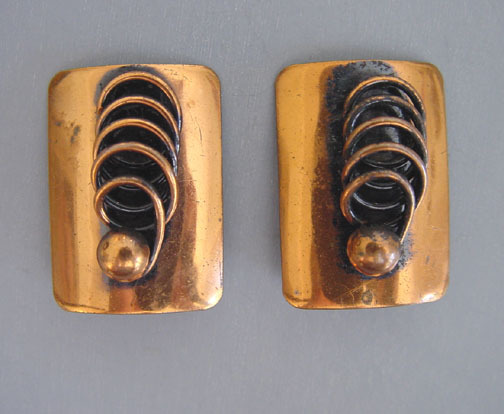 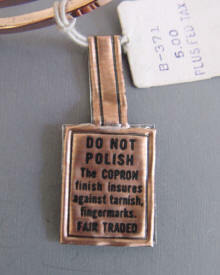 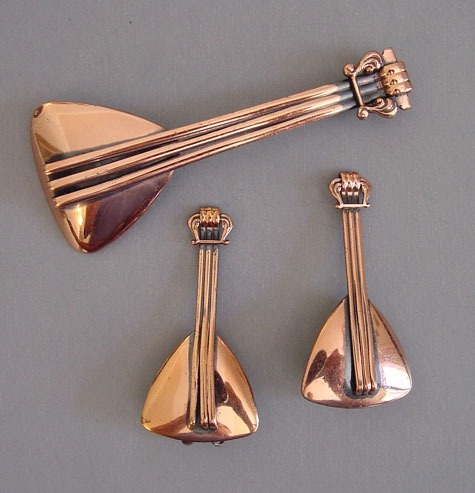 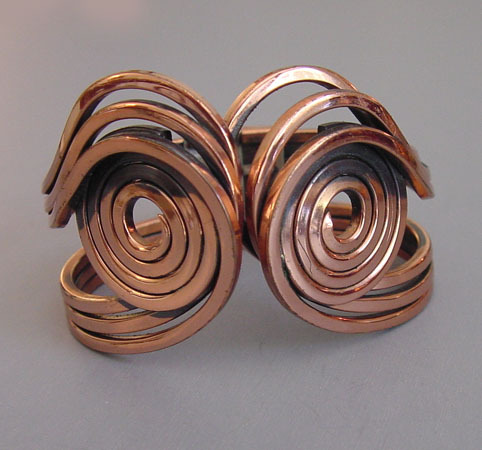 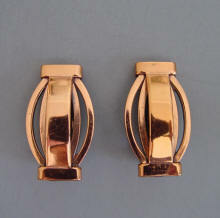 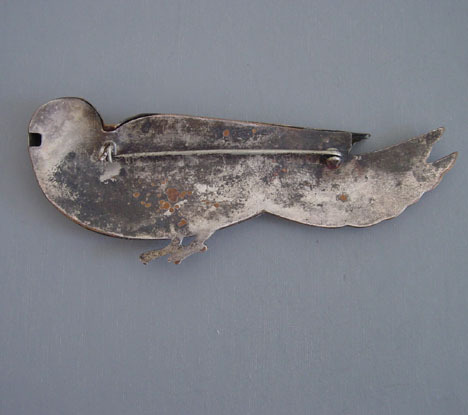 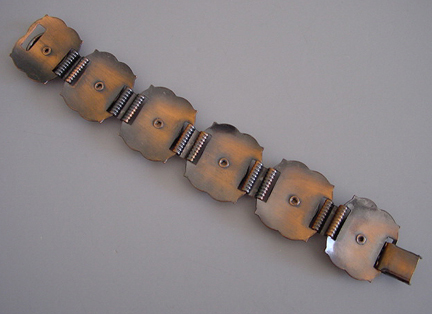 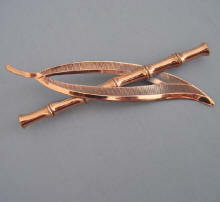 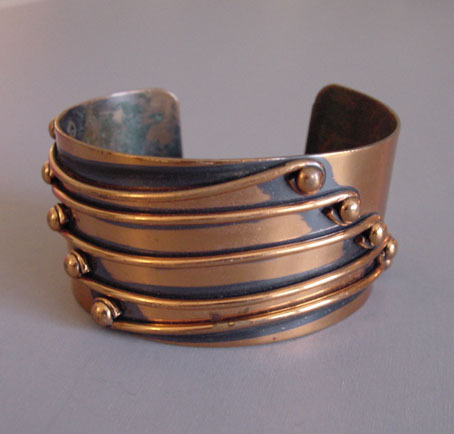 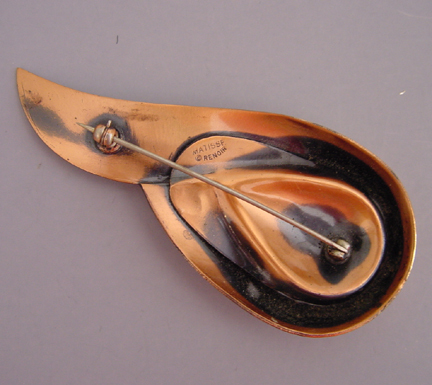 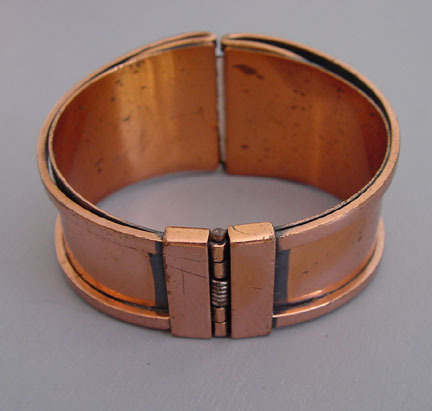 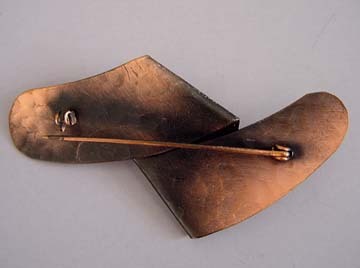 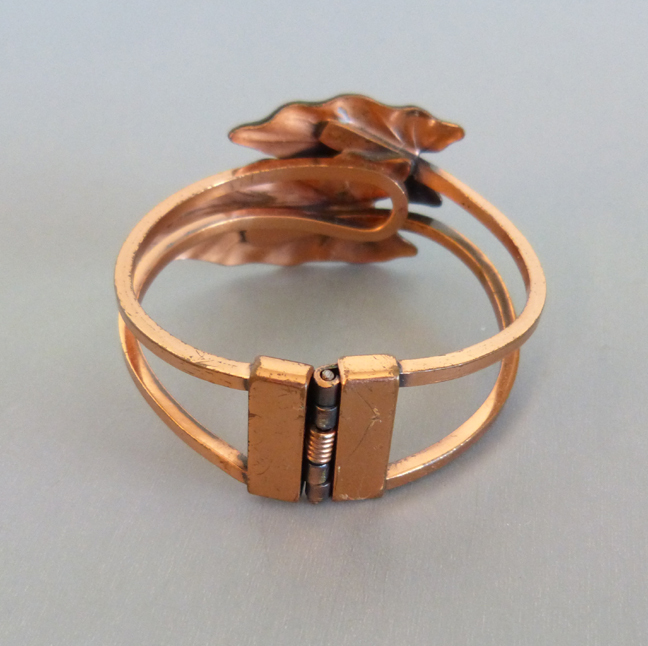 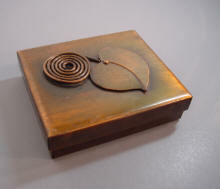 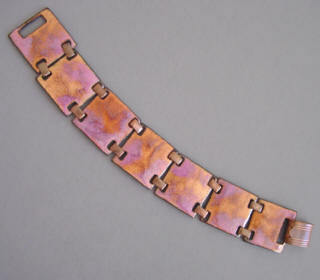 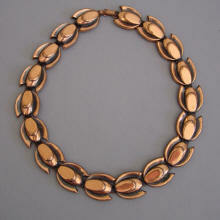 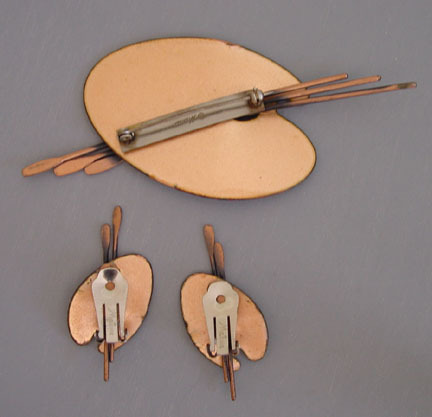 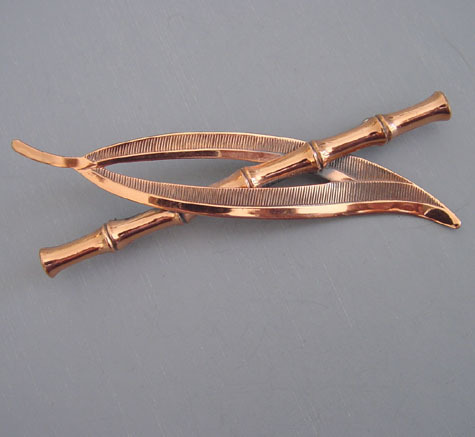 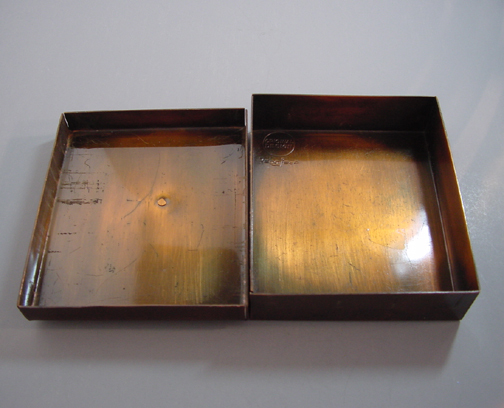 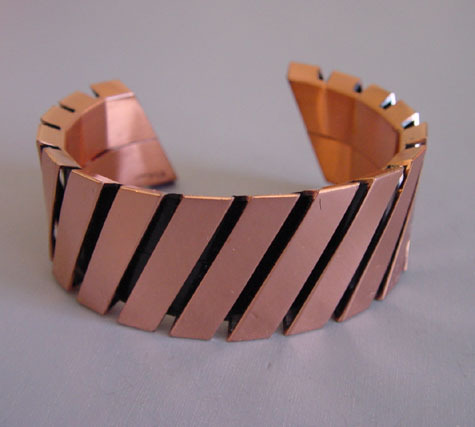 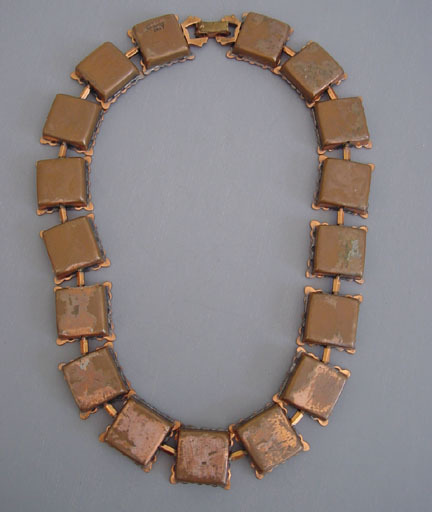 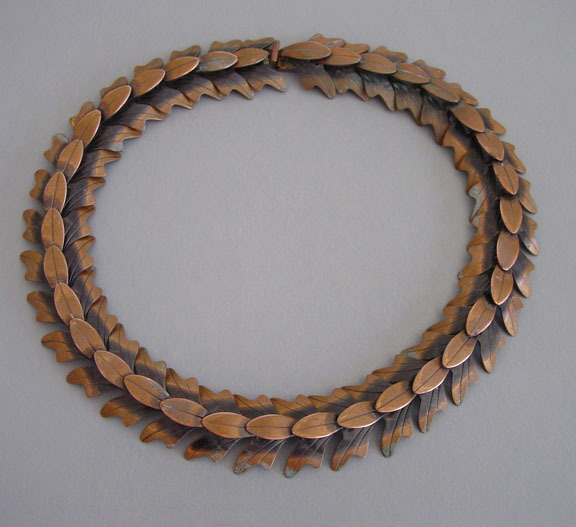 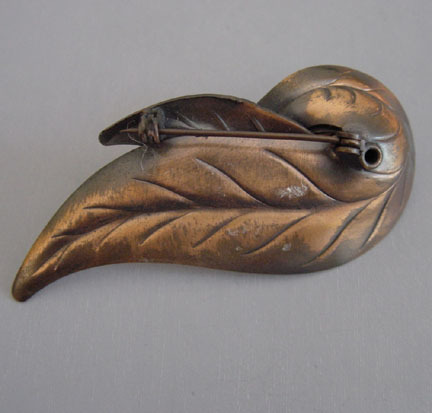 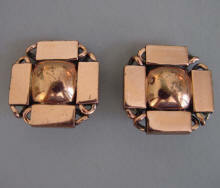 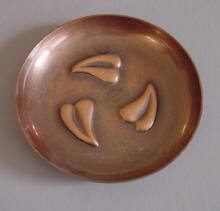 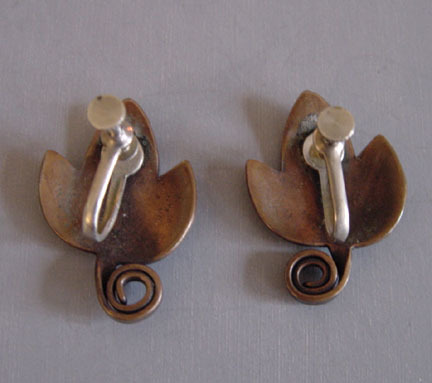 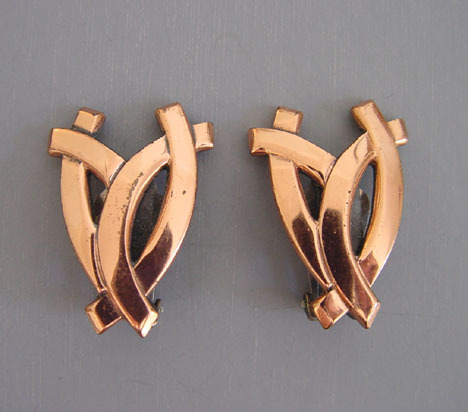 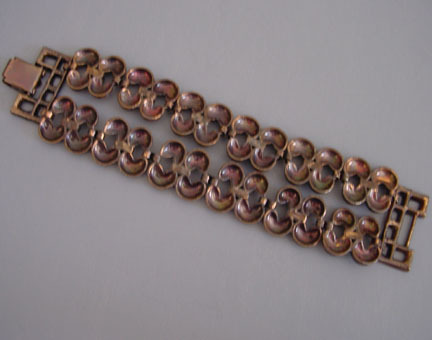 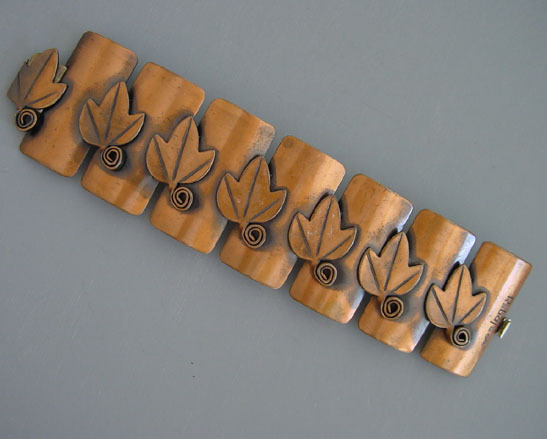 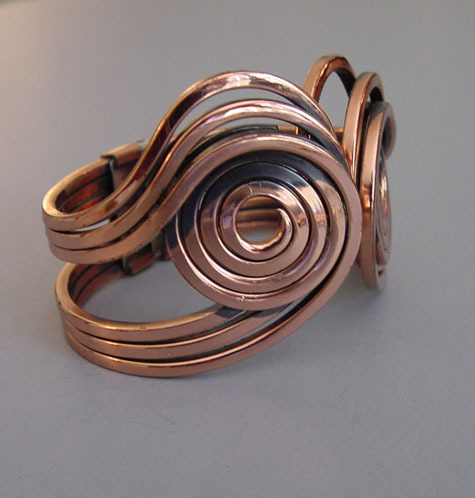 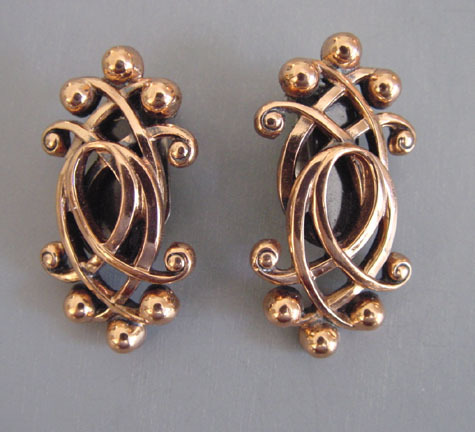 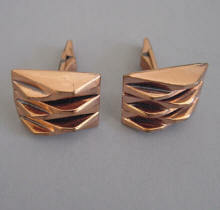 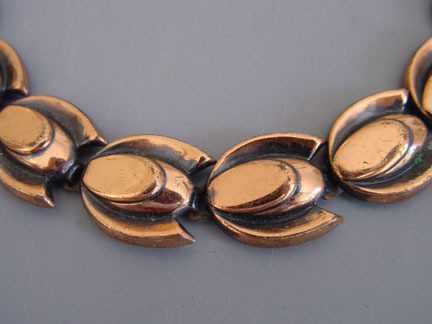 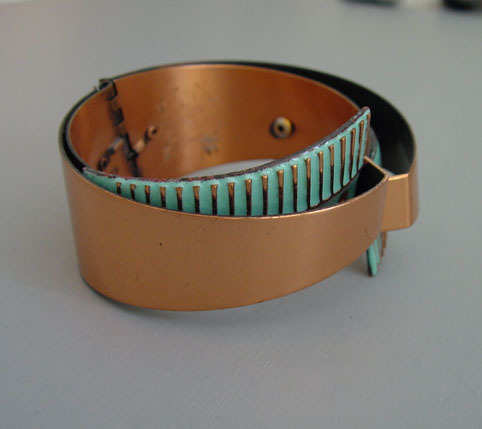 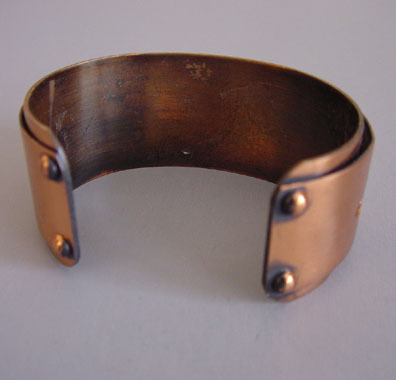 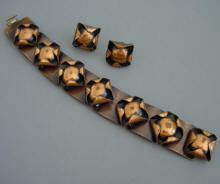 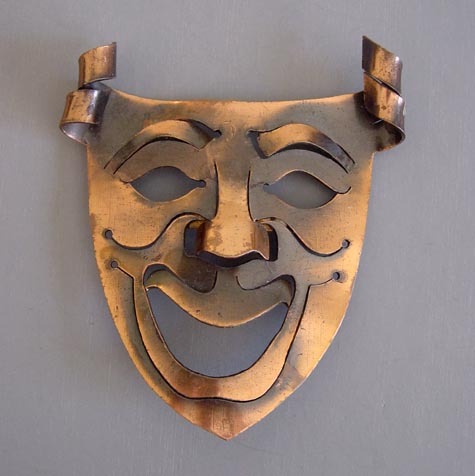 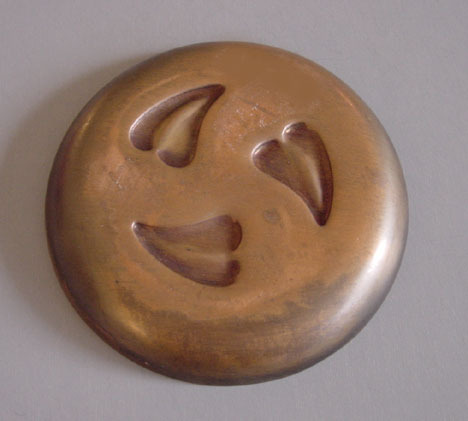 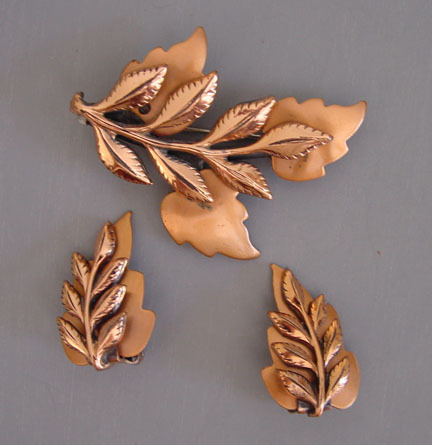 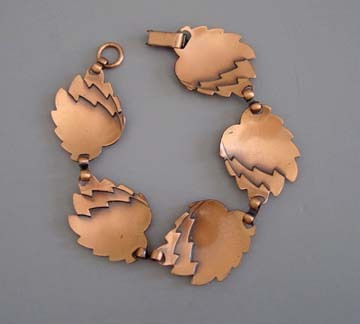 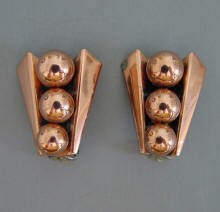 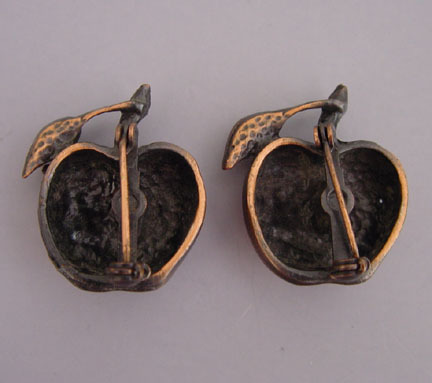 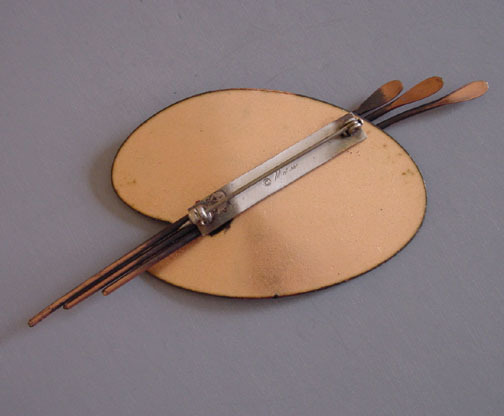 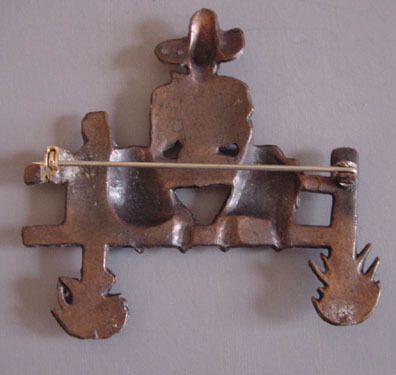 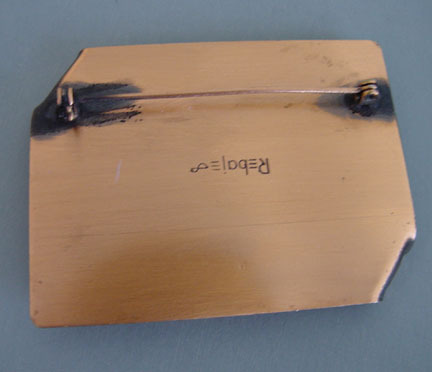 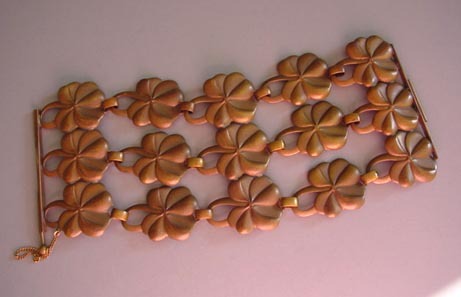 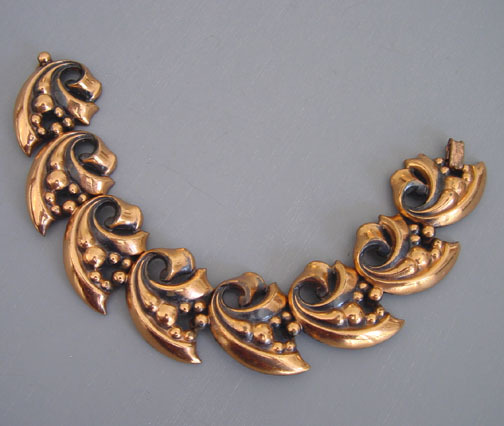 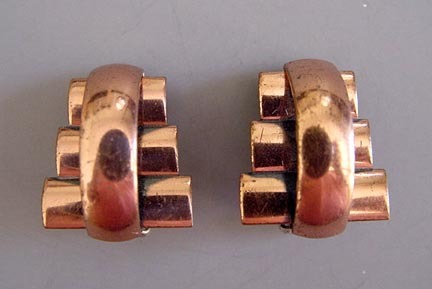 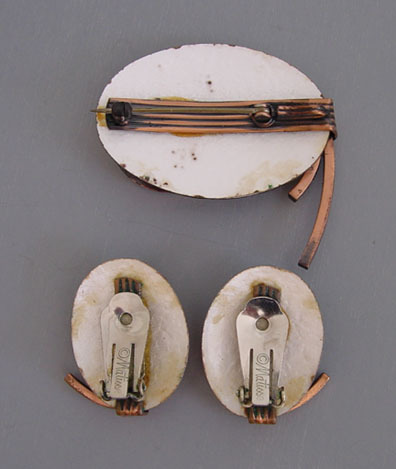 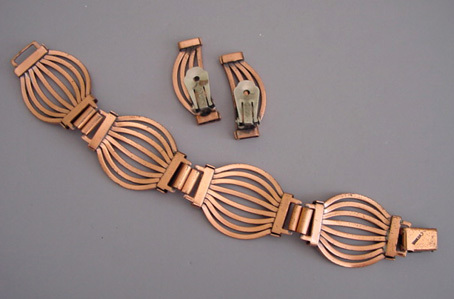 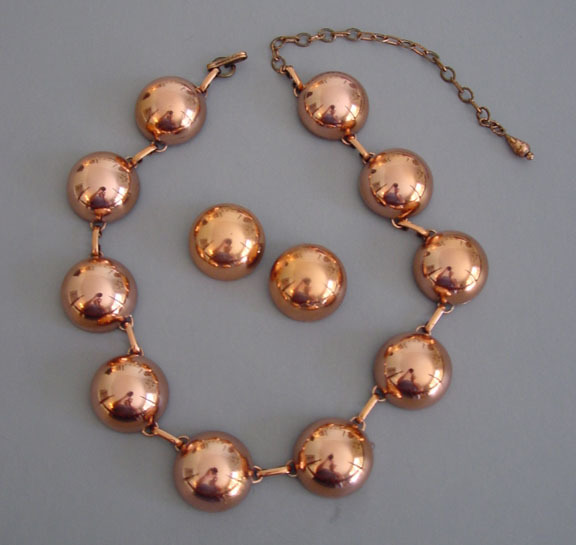 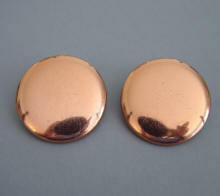 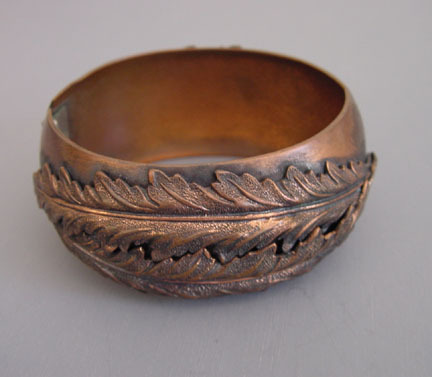 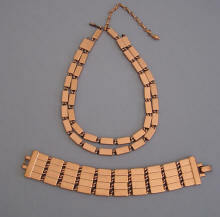 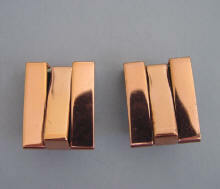 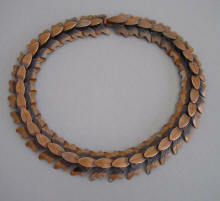 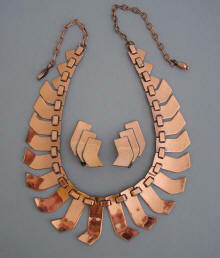 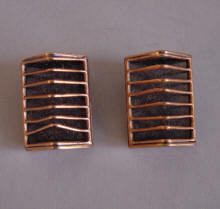 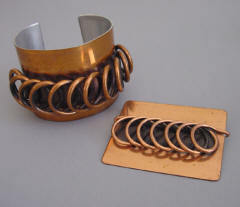 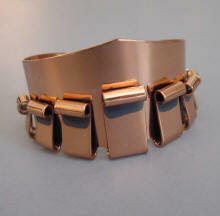 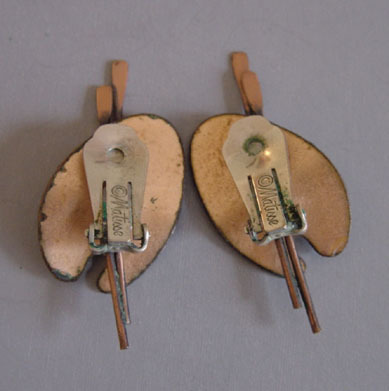 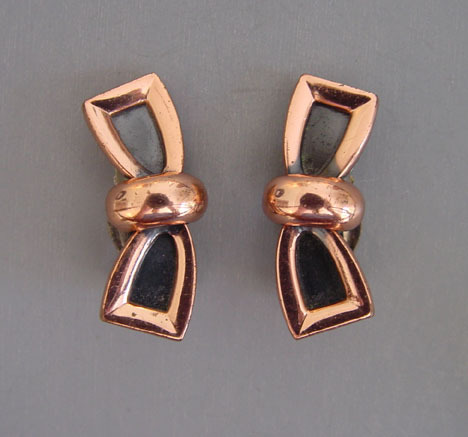 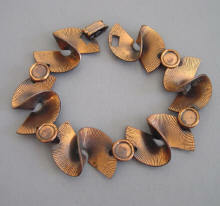 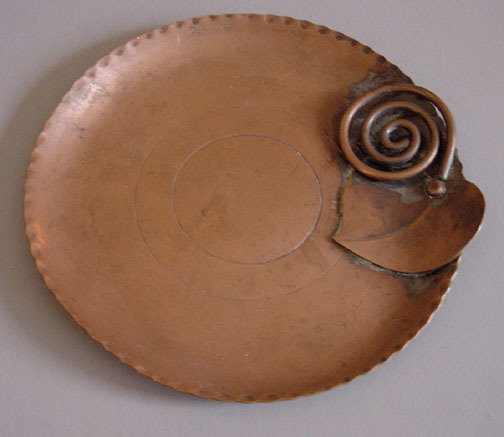 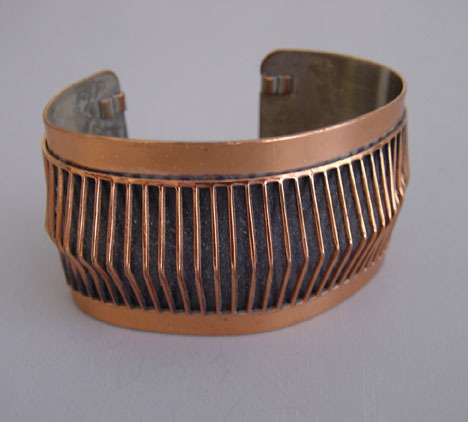 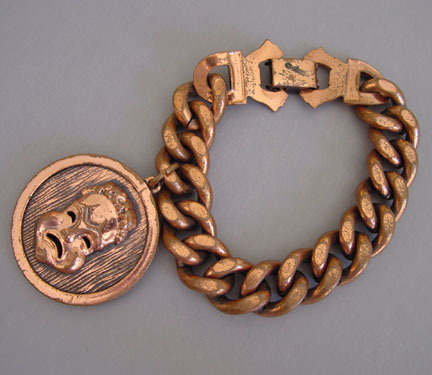 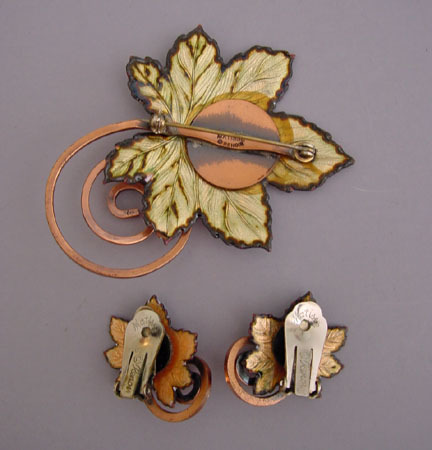 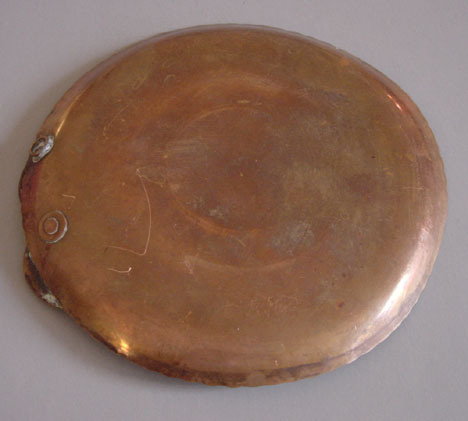 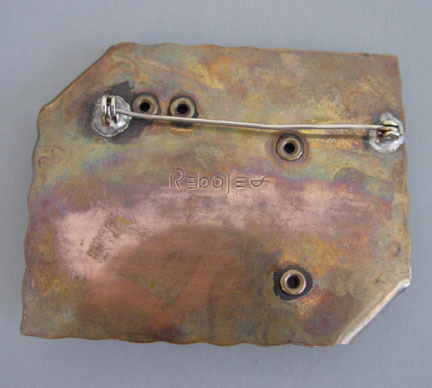 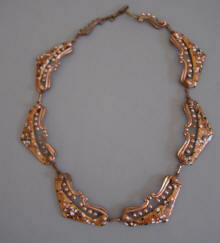 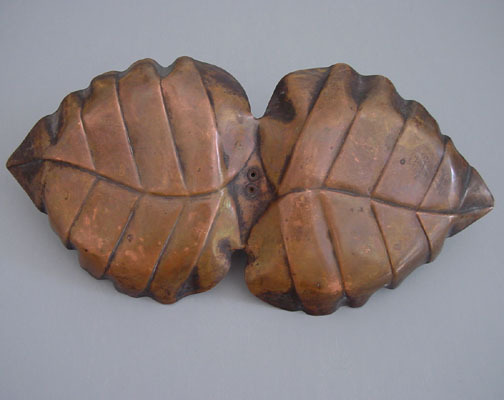 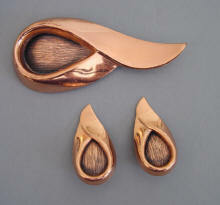 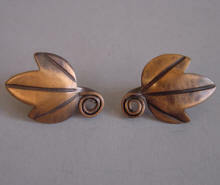 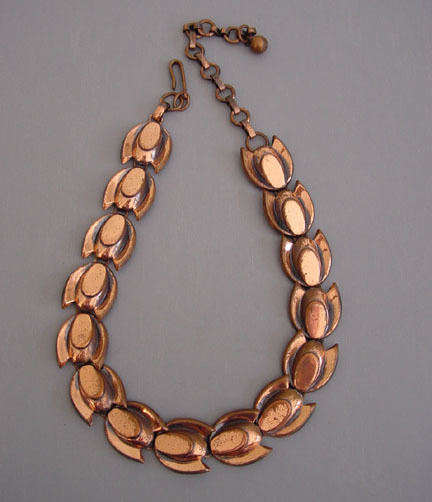 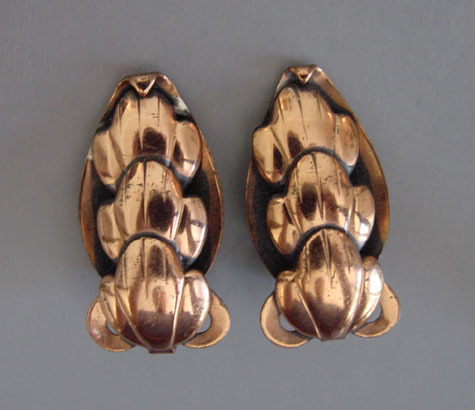 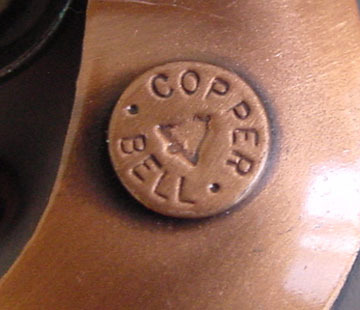 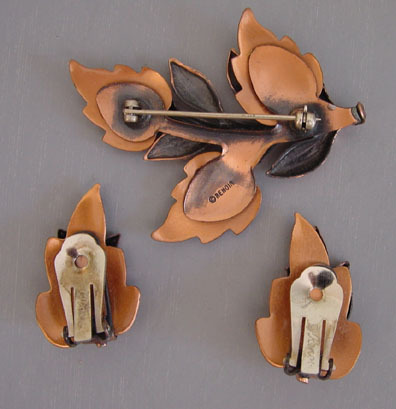 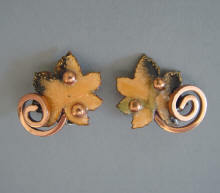 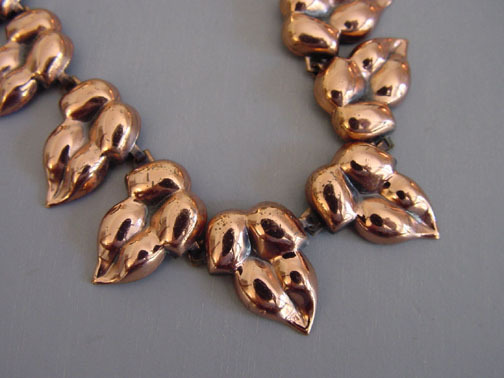 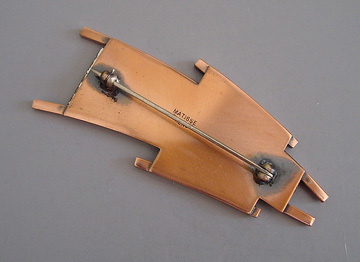 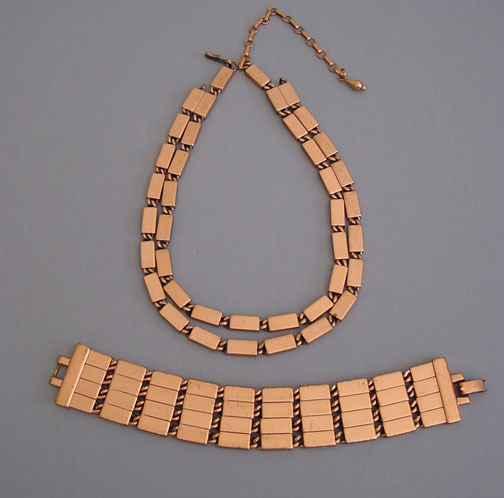 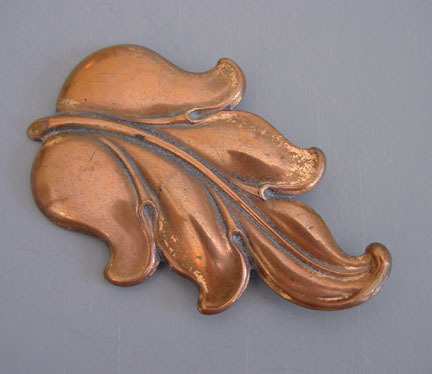 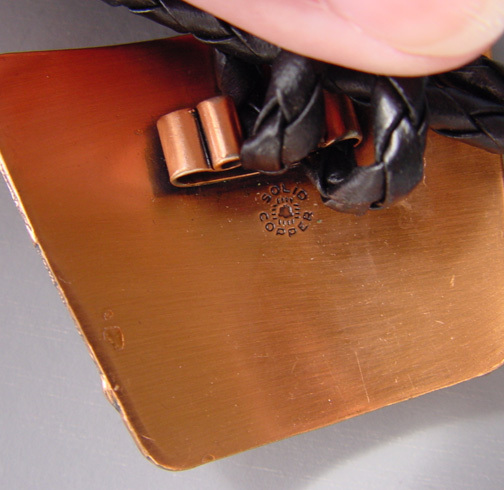 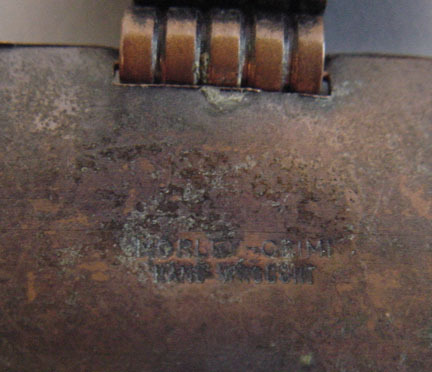 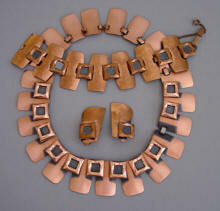 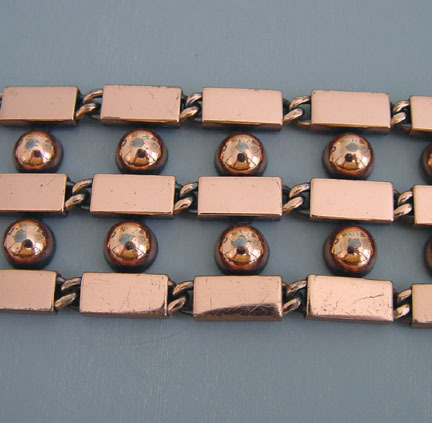 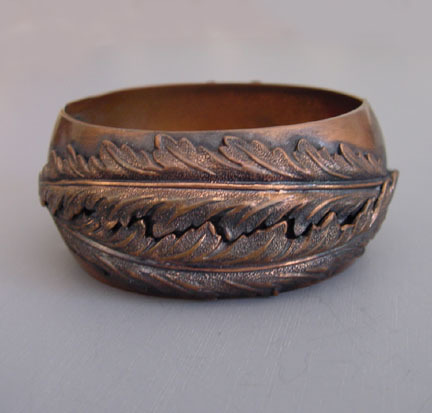 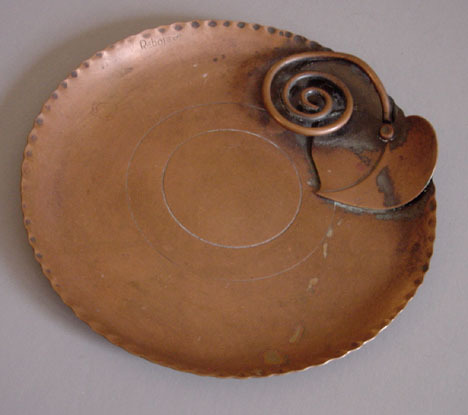 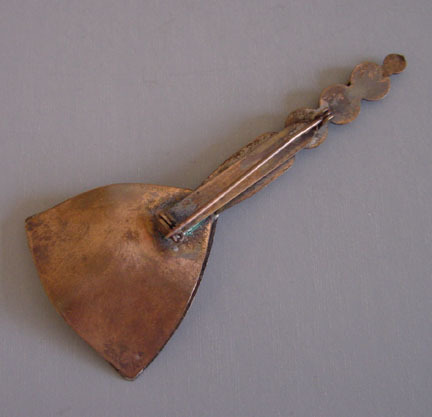 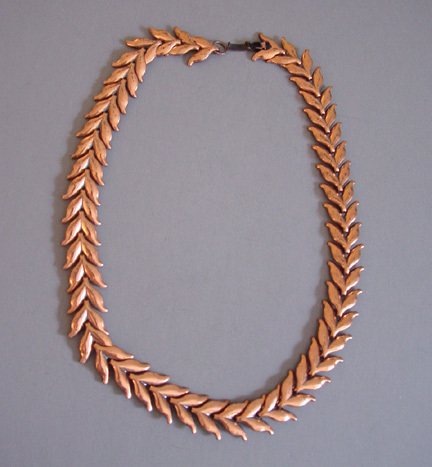 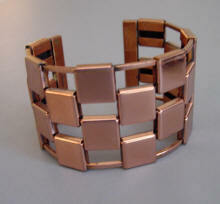 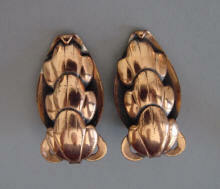 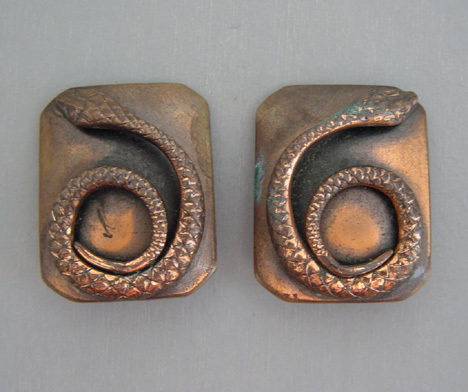 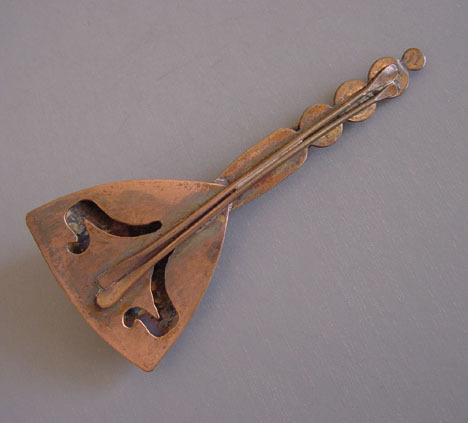 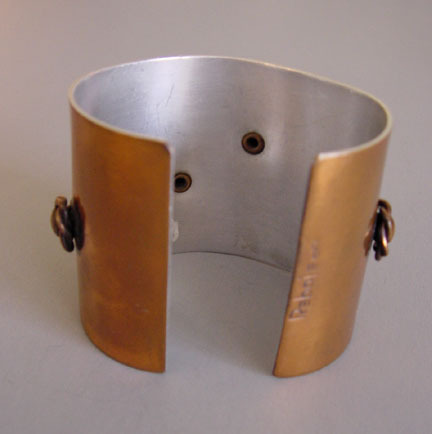 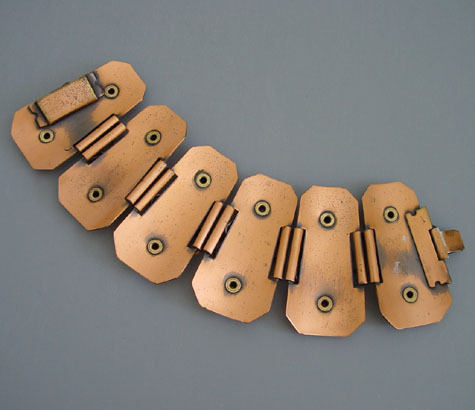 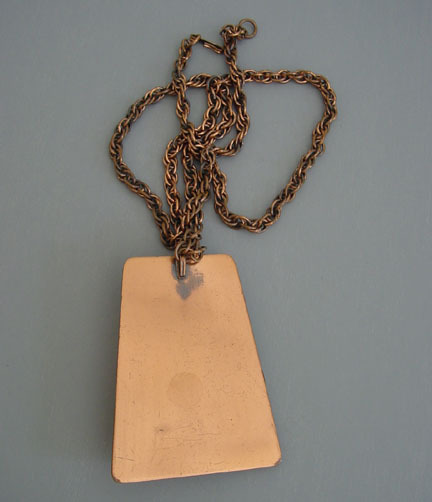 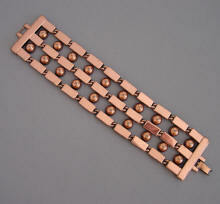 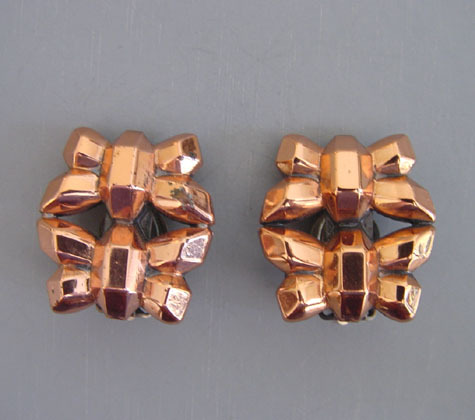 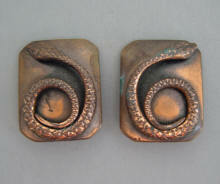 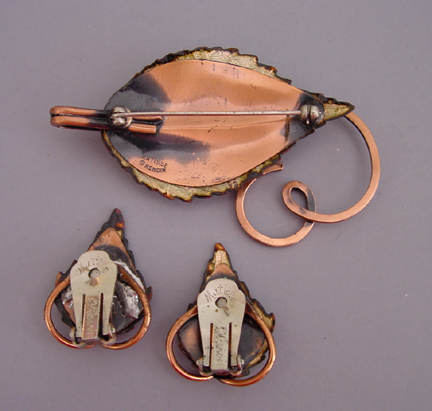 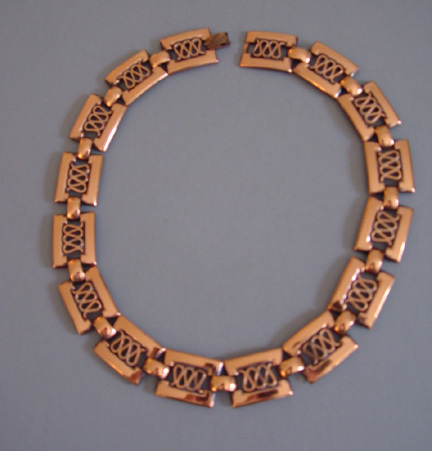 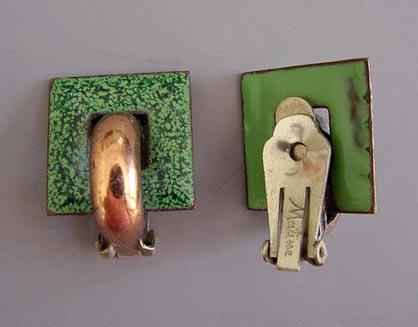 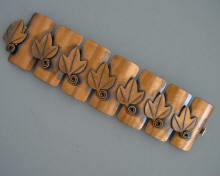 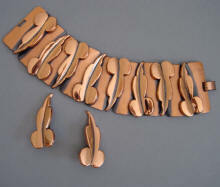 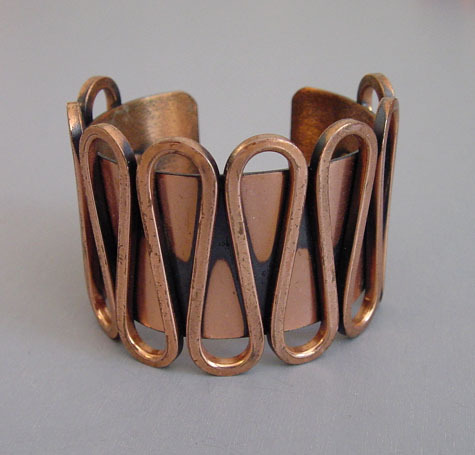 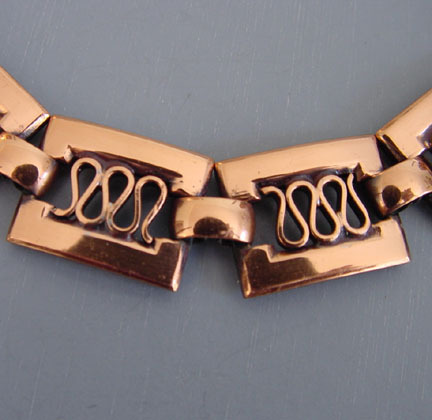 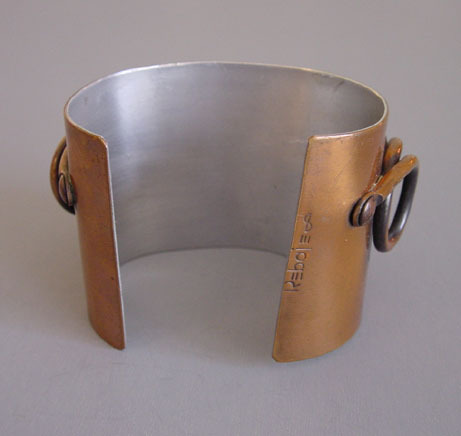 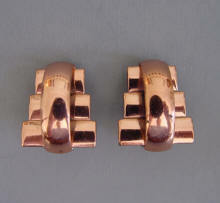 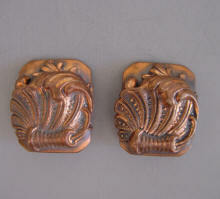 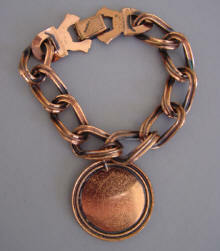 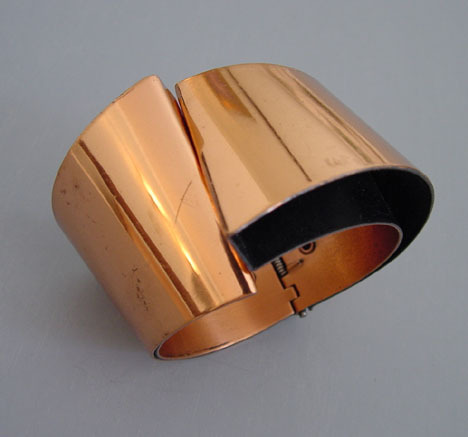 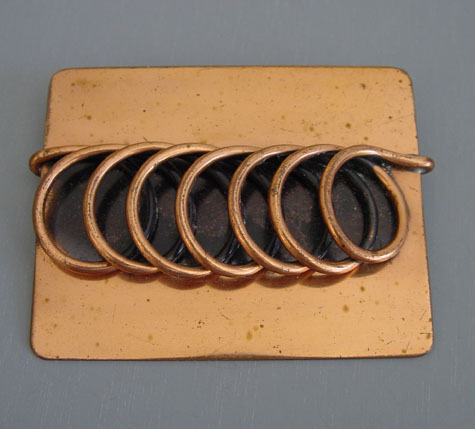 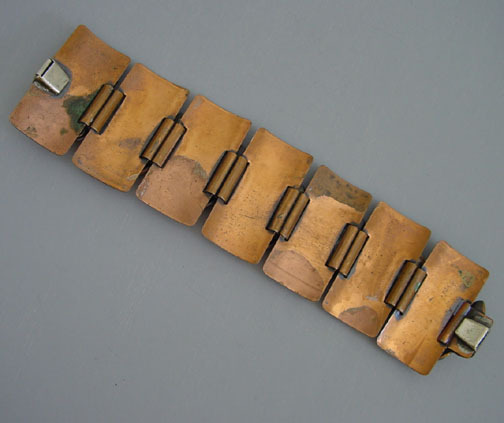 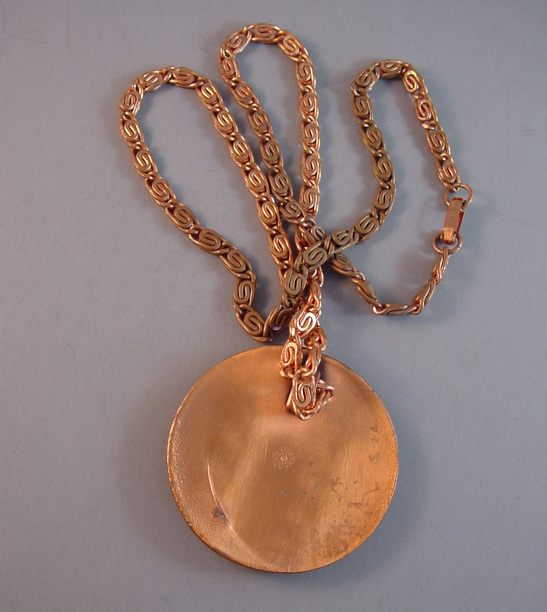 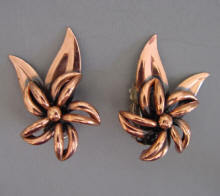 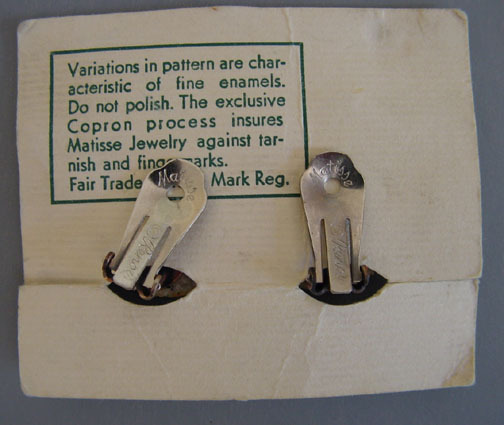 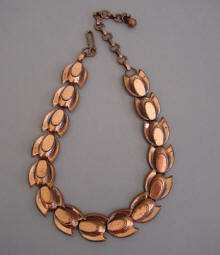 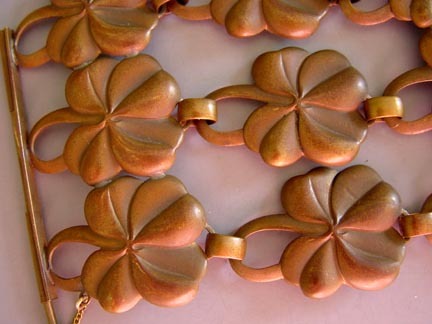 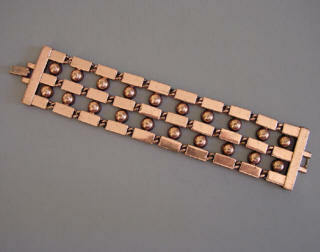 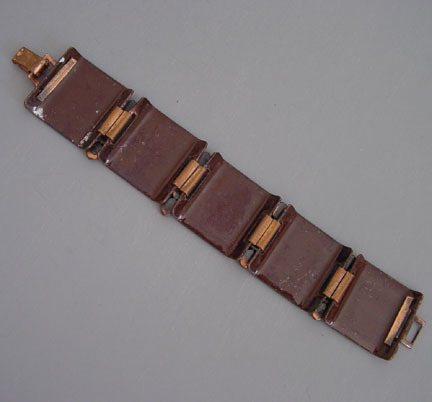 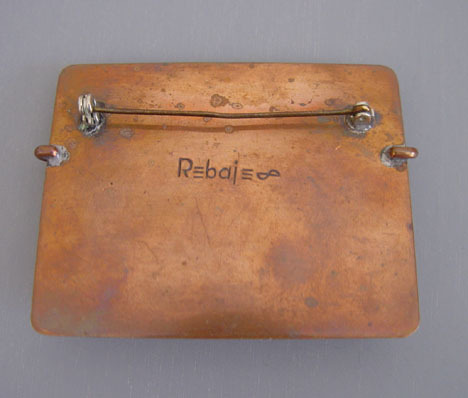 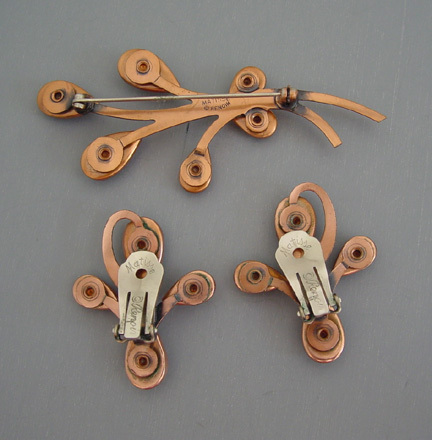 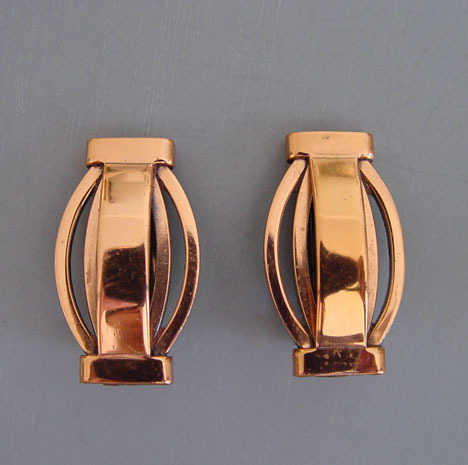 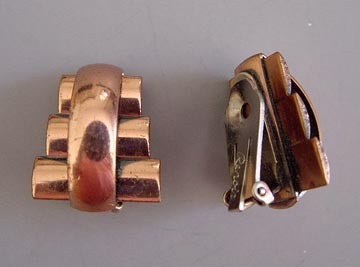 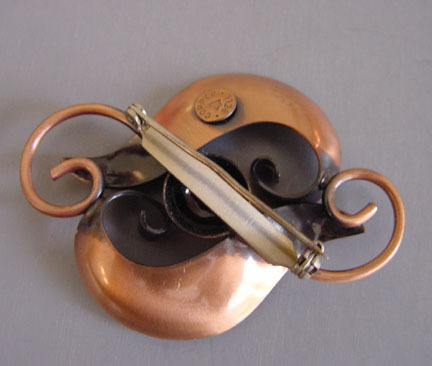 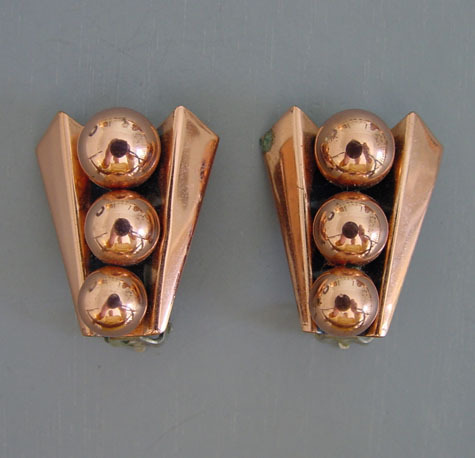 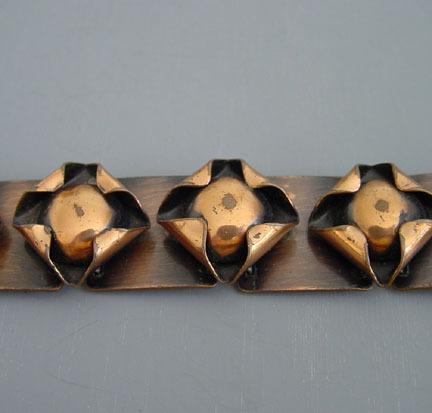 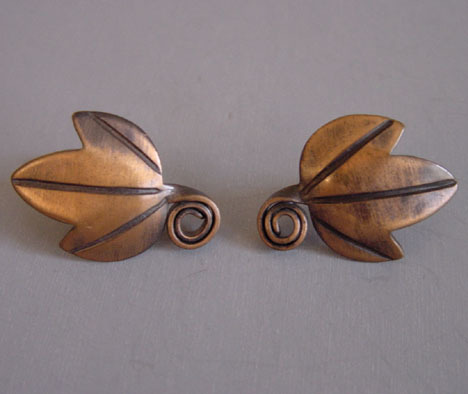 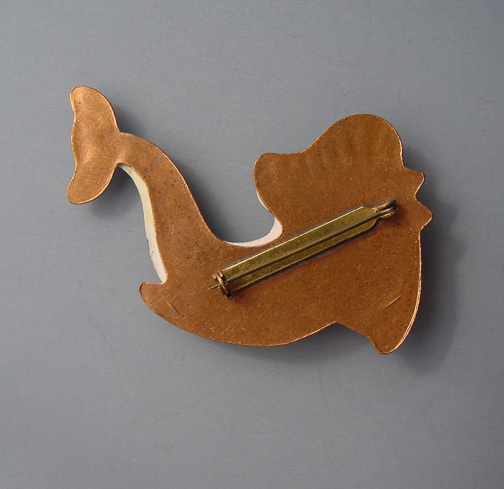 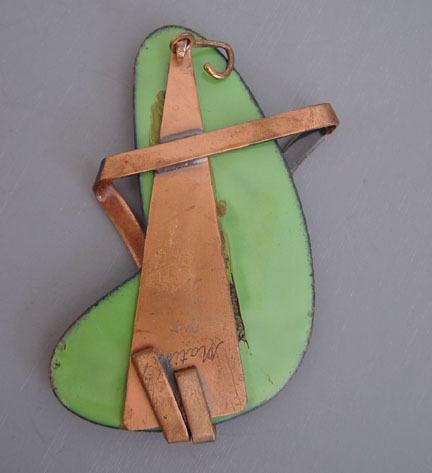 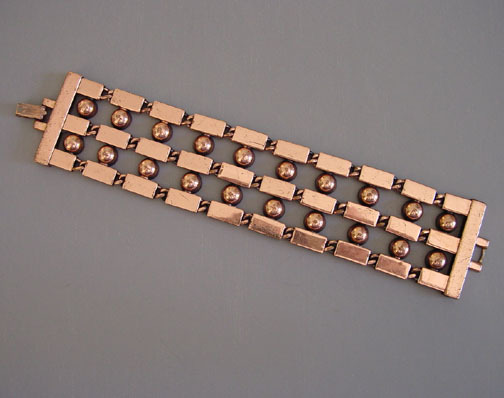 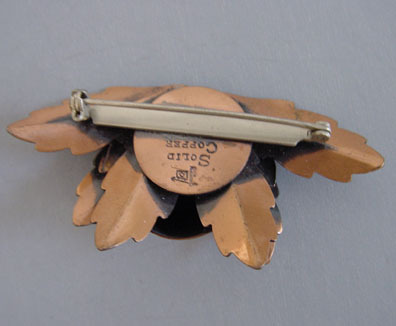 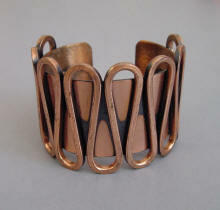 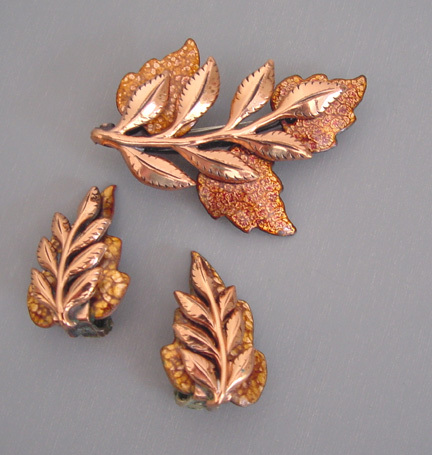 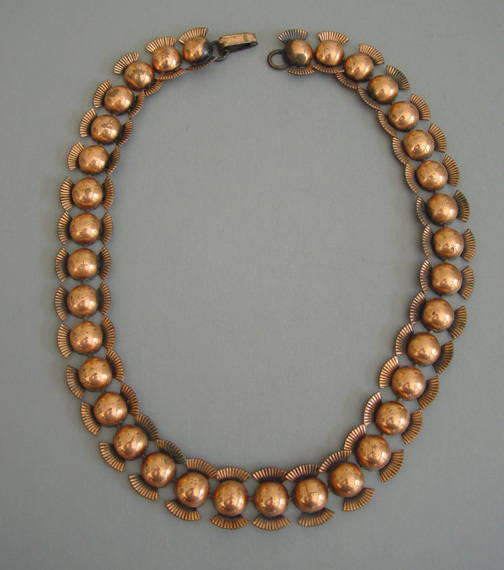 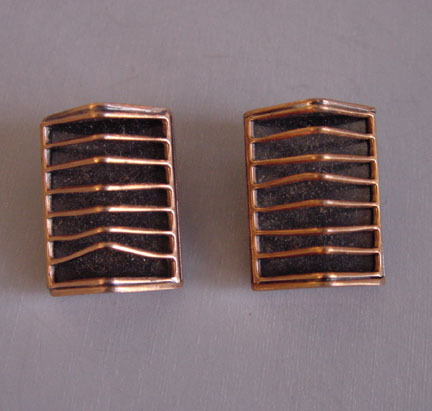 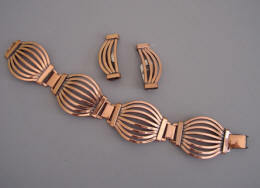 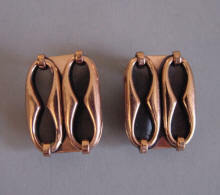 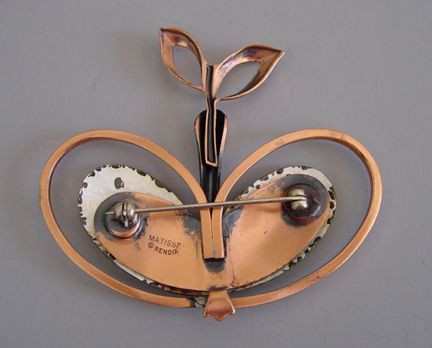 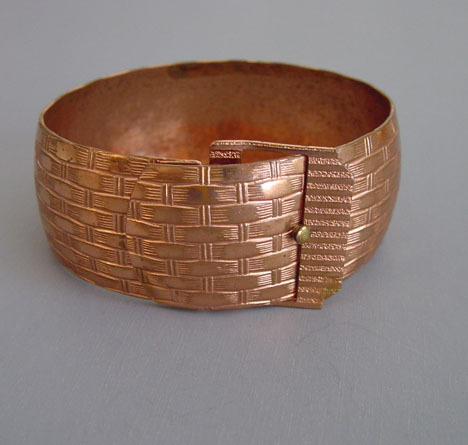 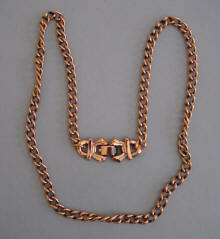 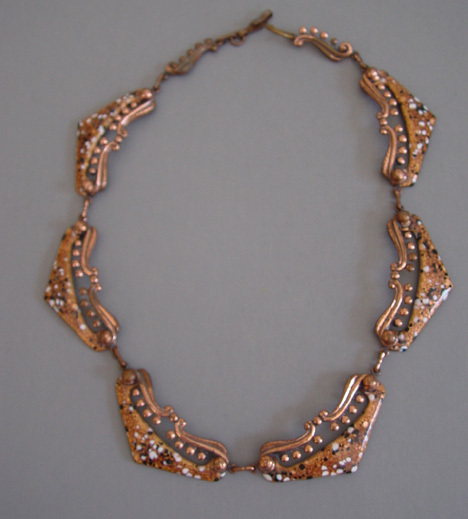 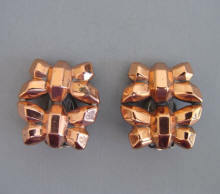 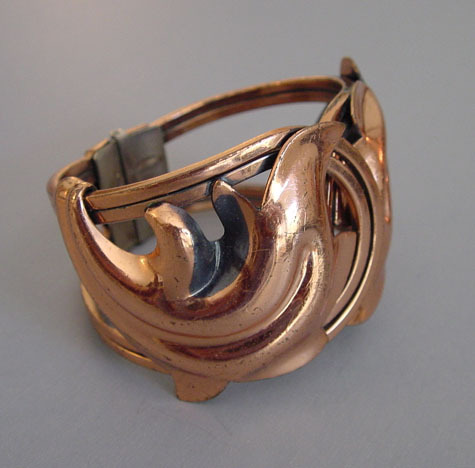 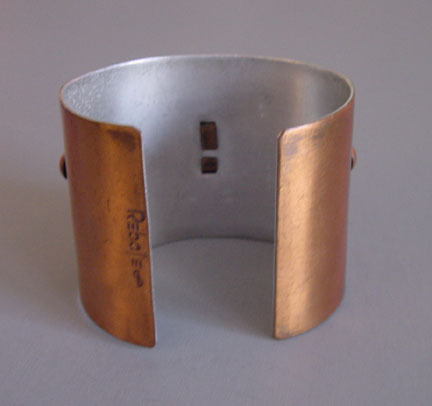 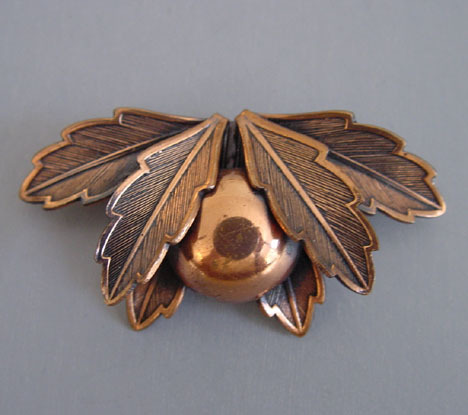 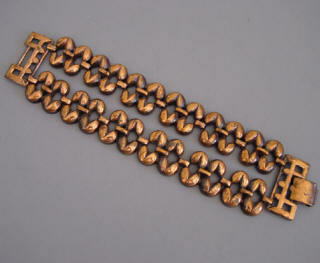 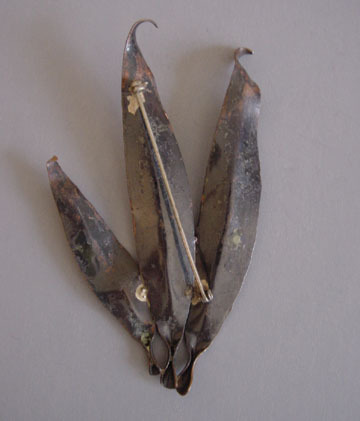 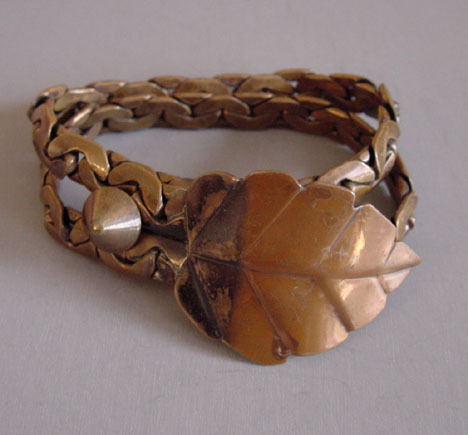 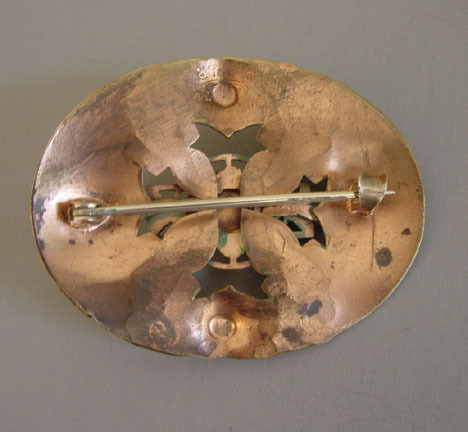 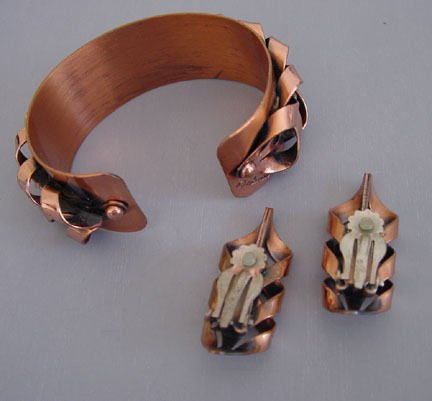 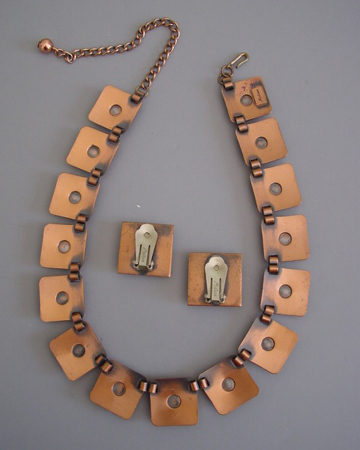 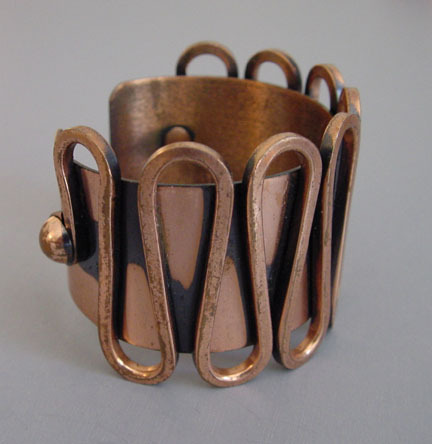 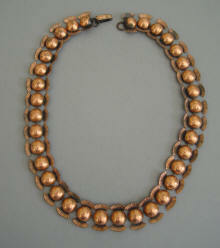 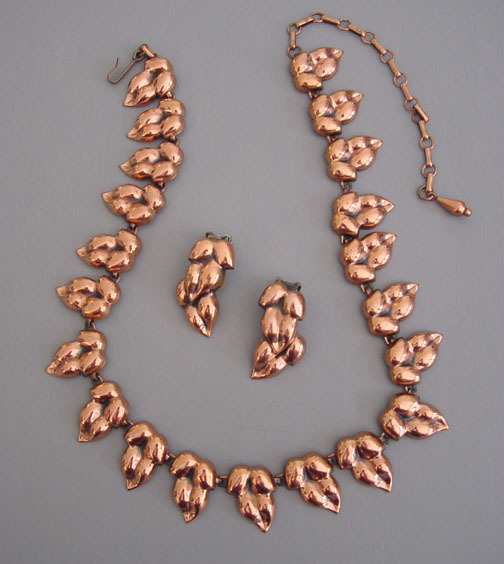 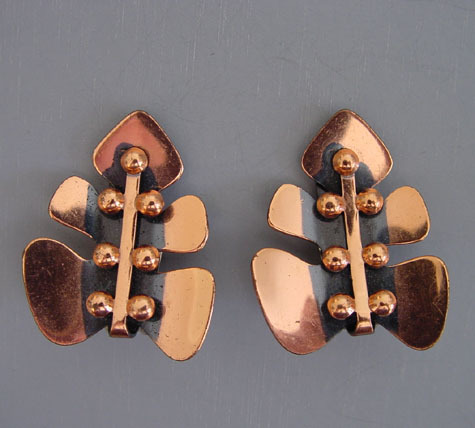 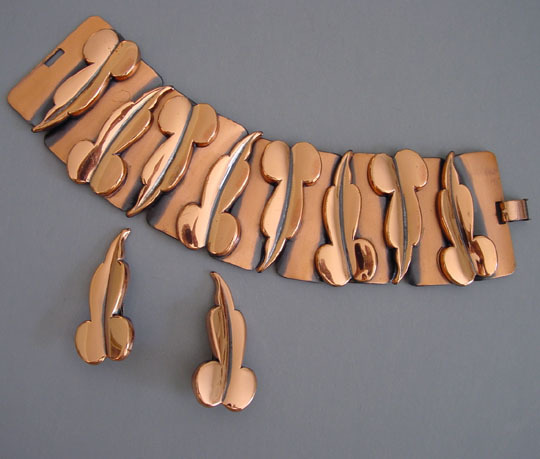 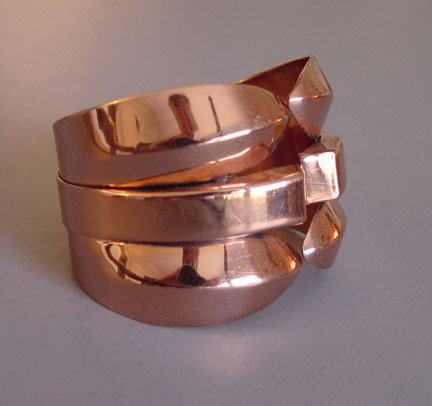 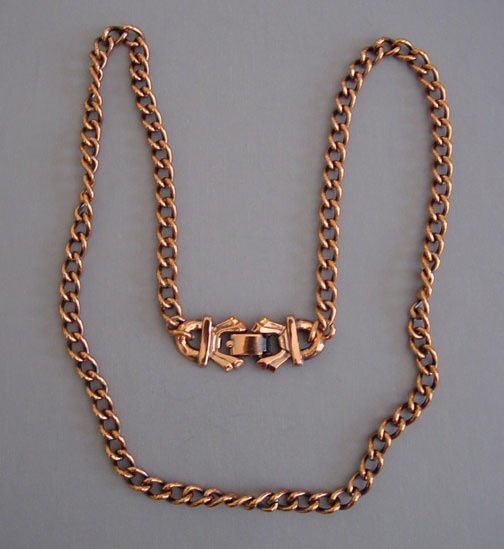 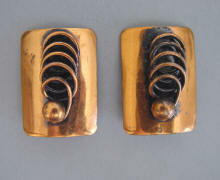 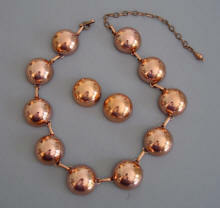 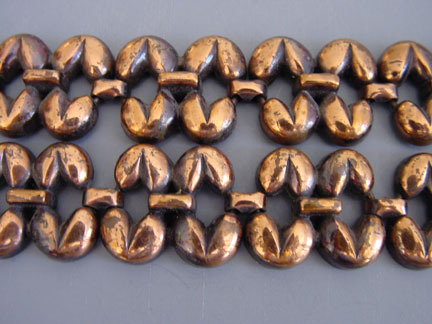 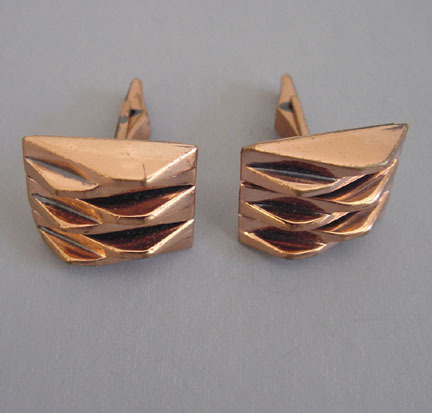 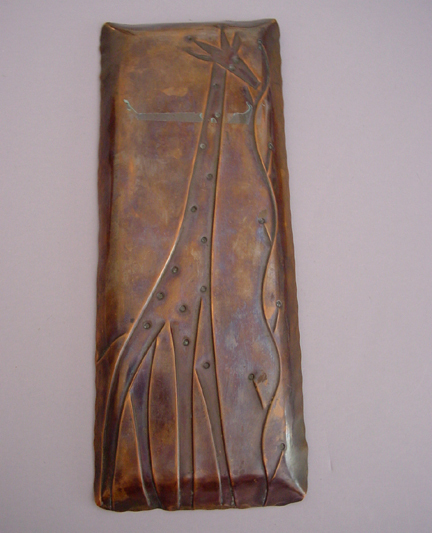 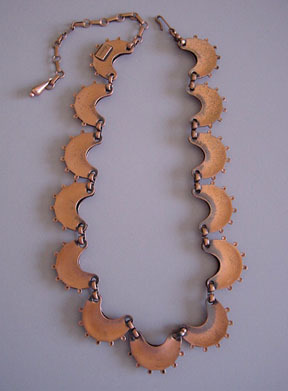 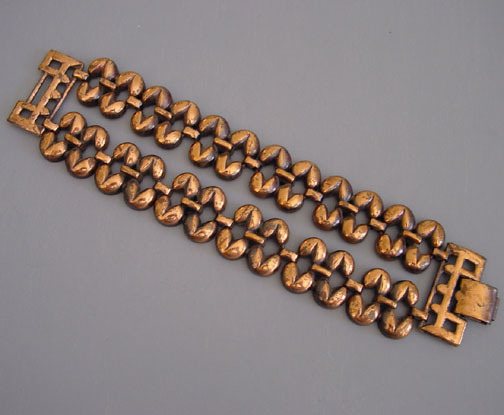 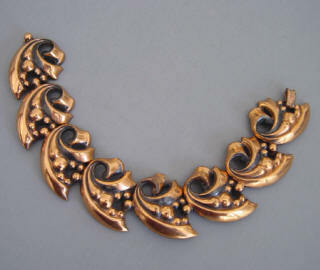 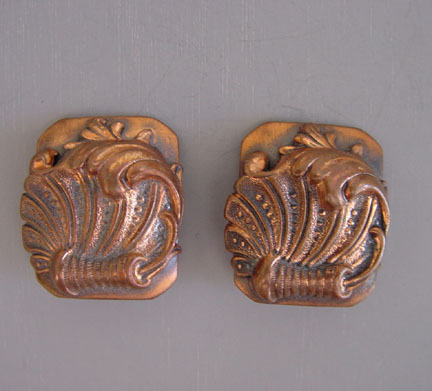 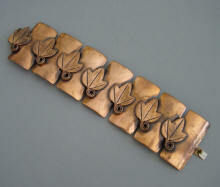 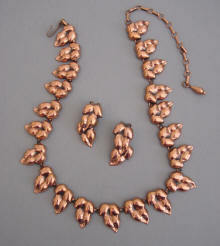 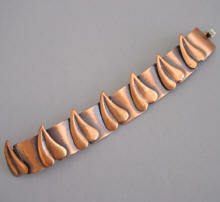 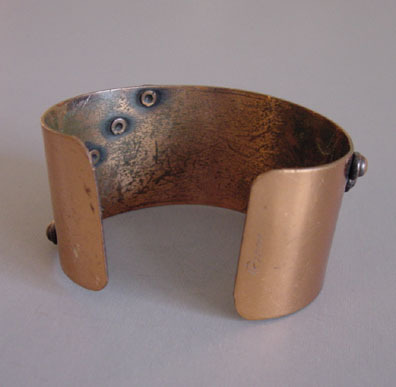 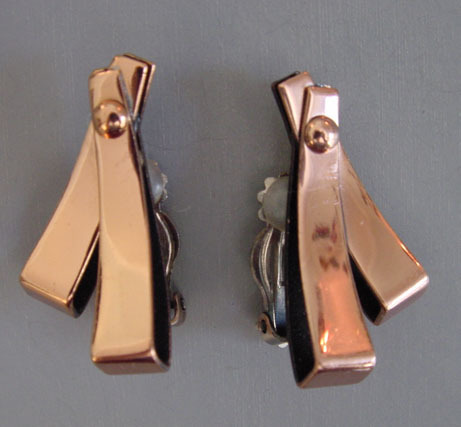 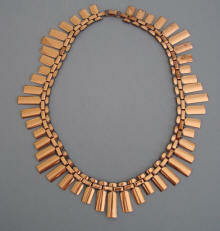 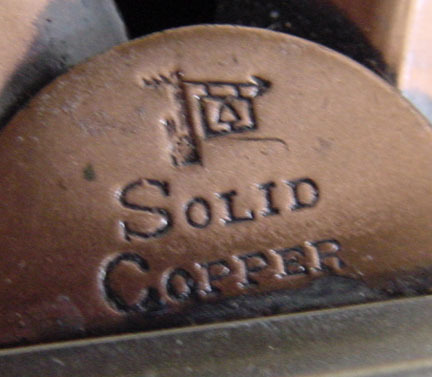 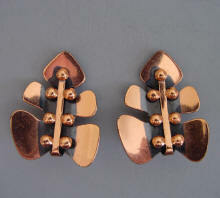 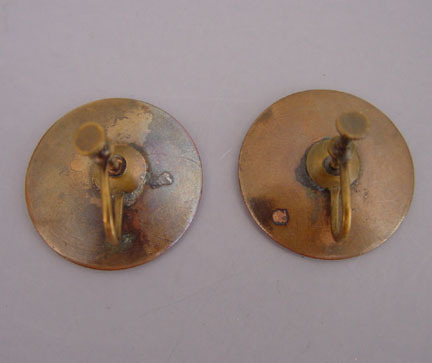 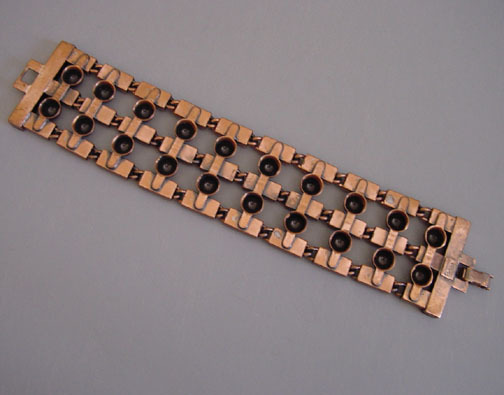 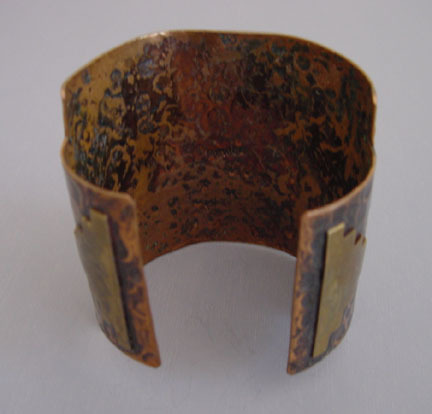 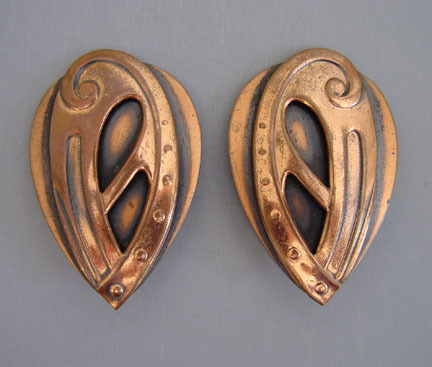 During the Korean War some larger copper pieces were also lined in aluminum for ease of wear. 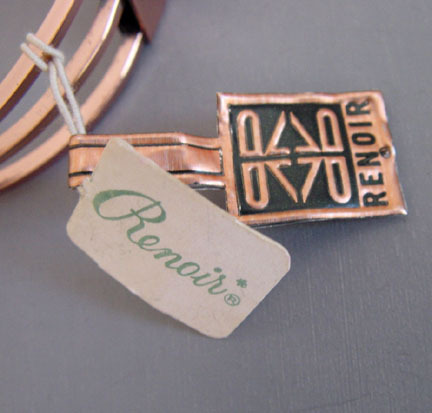 Jerry Fels and two partners started the Renoir company in Hollywood, California, in 1946. 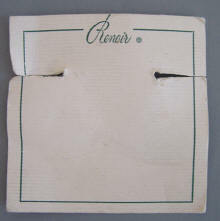 Originally named "Renoir of Hollywood" the name was changed in about 1948 to "Renoir of California". 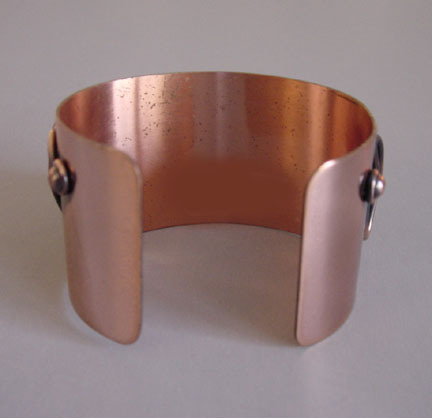 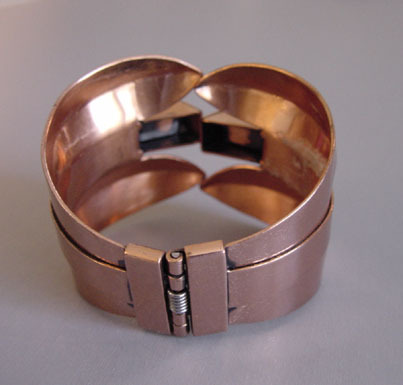 During the Korean War copper and aluminum were used together for a brief time. 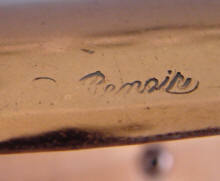 The mark "Hand Made Renoir of California" was used from 1952-1954, and "Renoir" was used thereafter. 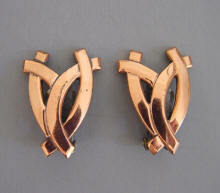 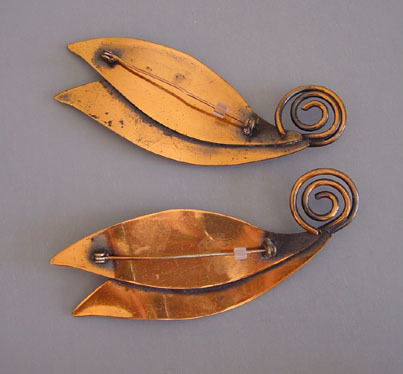 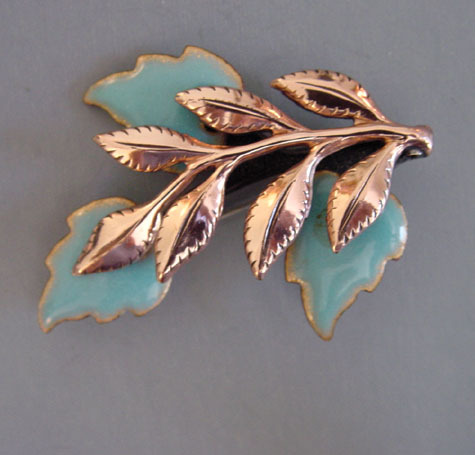 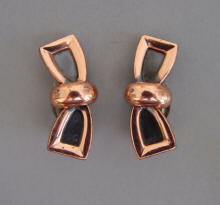 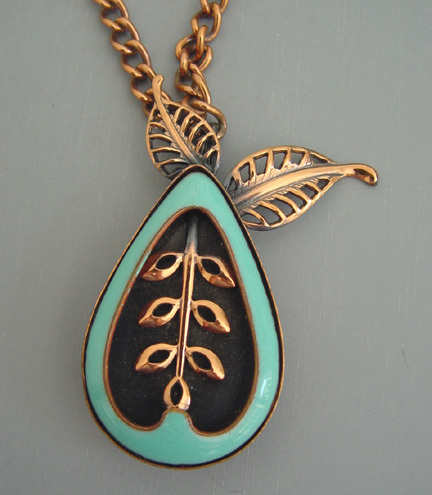 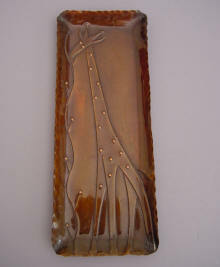 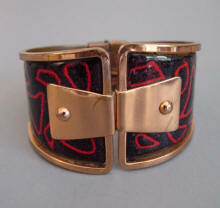 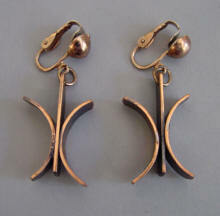 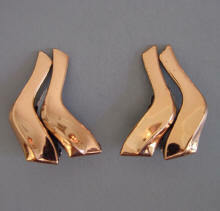 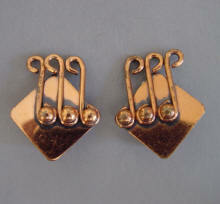 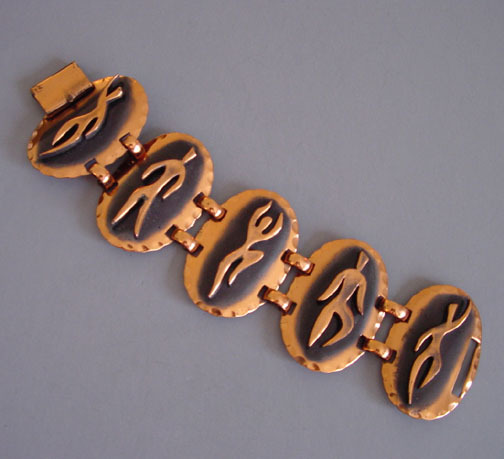 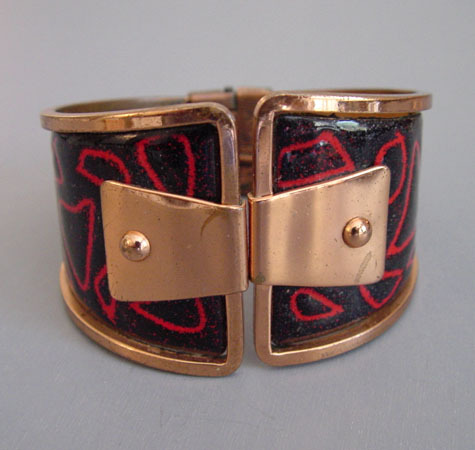 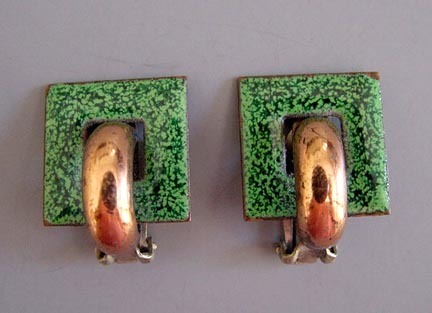 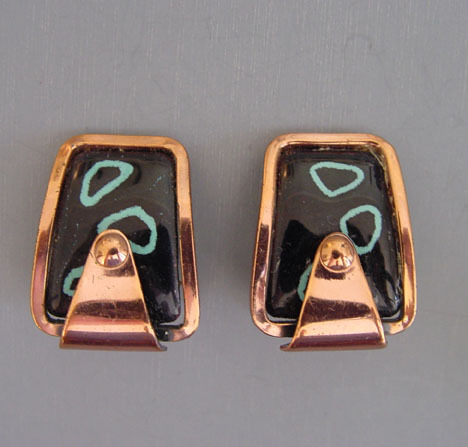 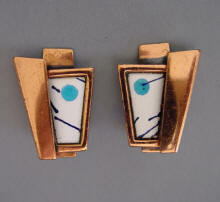 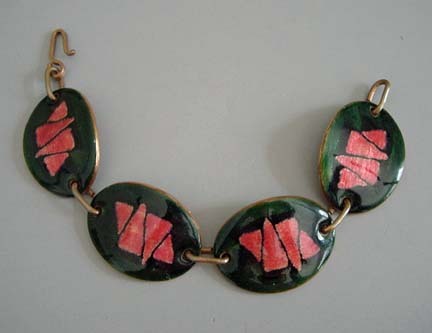 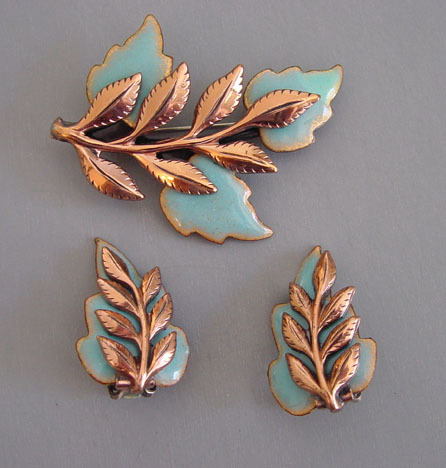 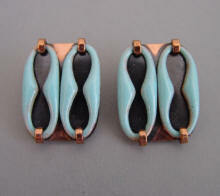 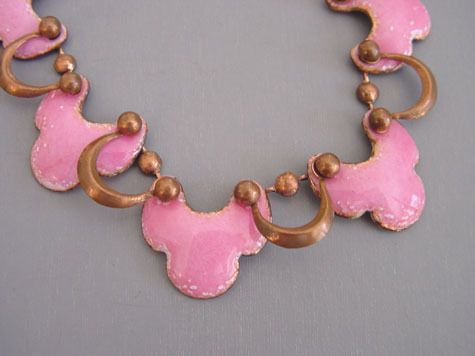 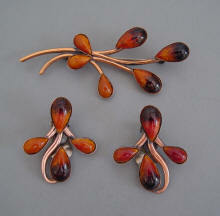 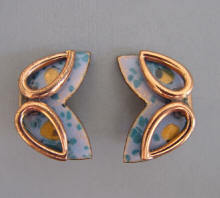 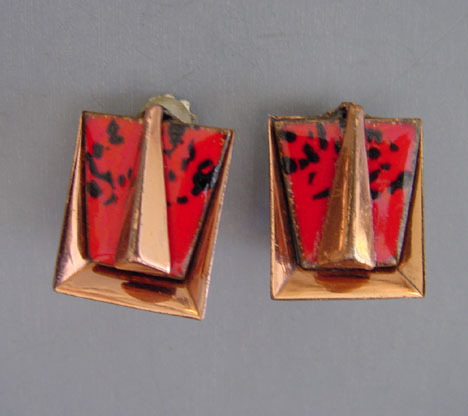 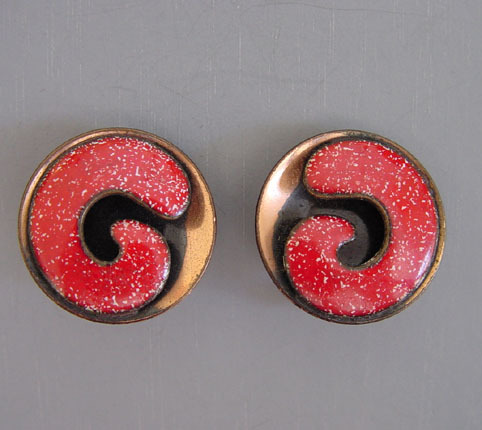 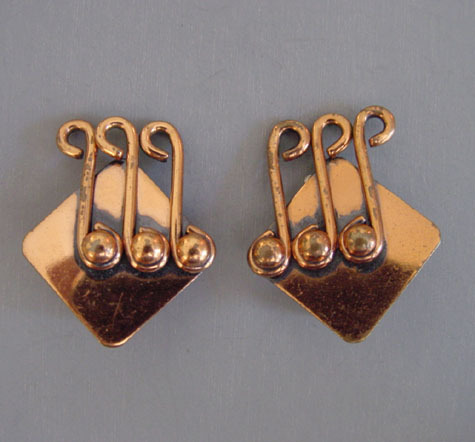 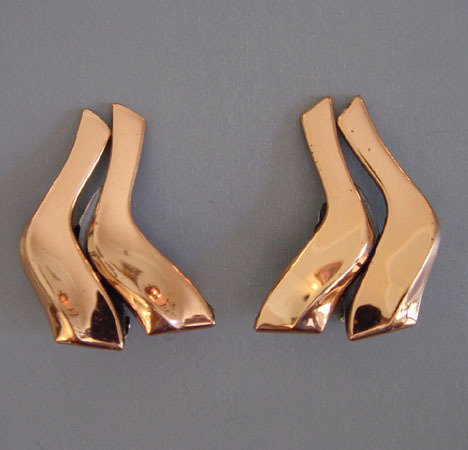 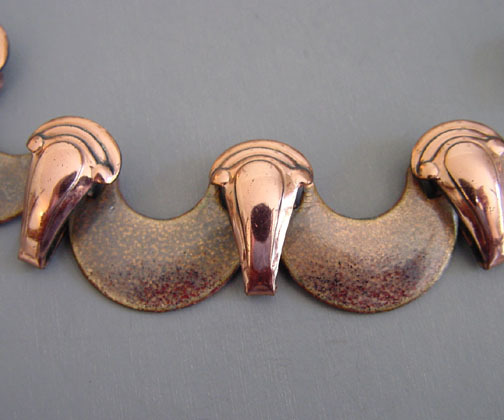 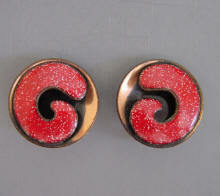 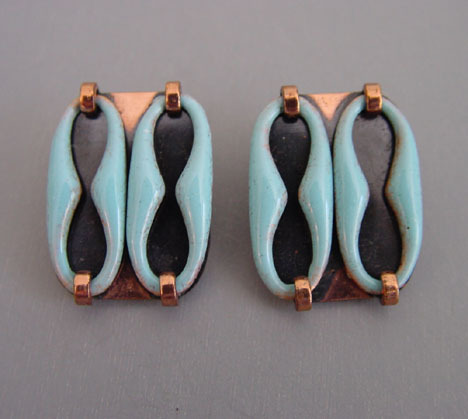 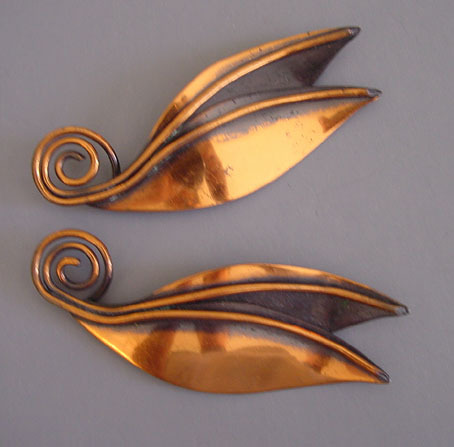 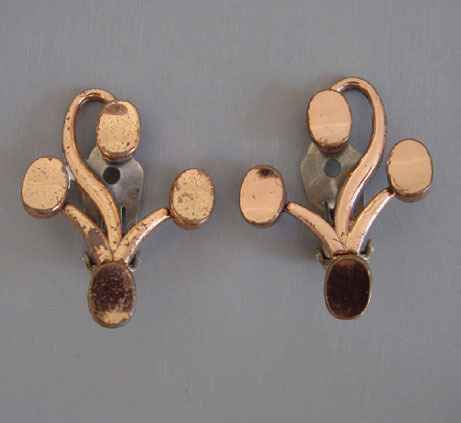 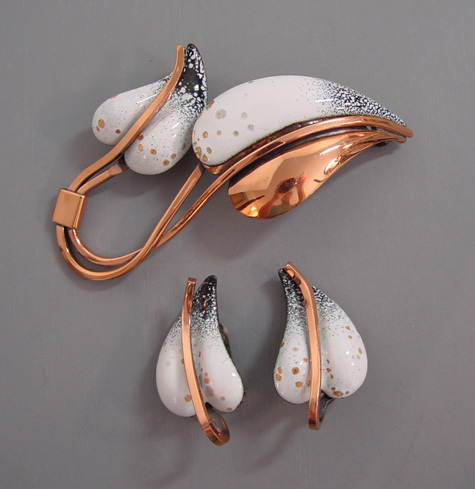 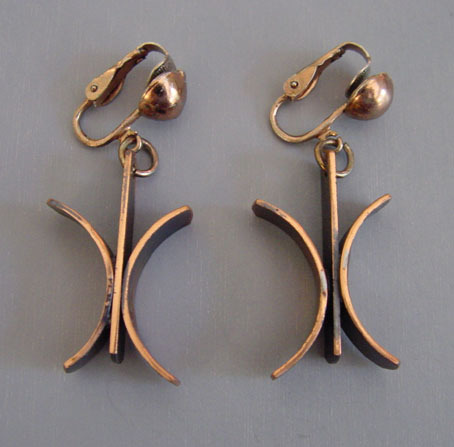 "Matisse" was introduced in 1952, with the lovely enamel on copper look. 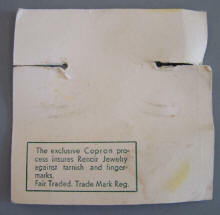 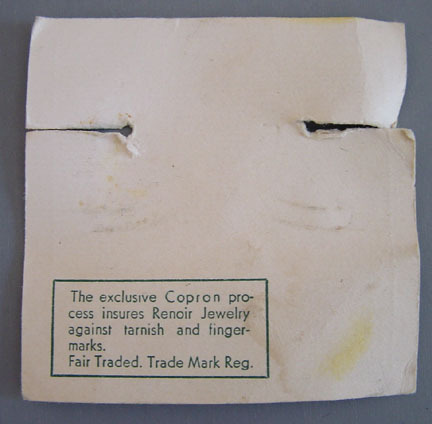 After 1954 pieces bore the copyright mark. 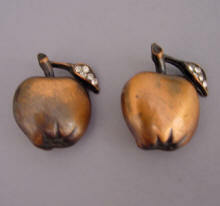 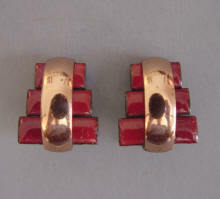 In the mid-50s Renoir also did sterling silver jewelry and that line was named "Sauteur". 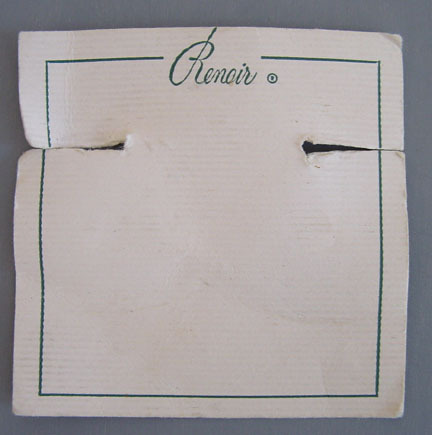 Renoir was closed in 1964. 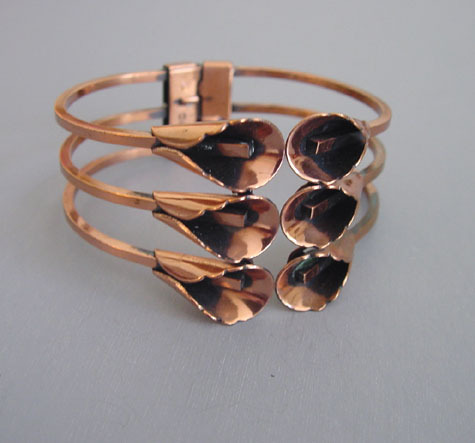 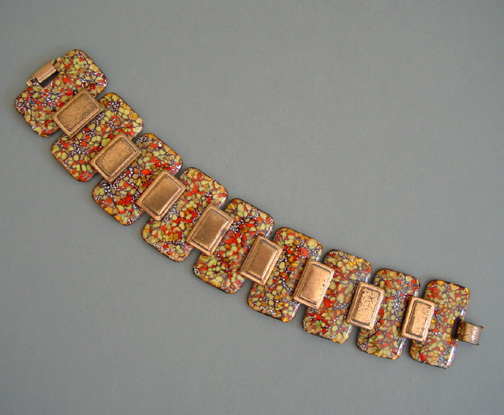 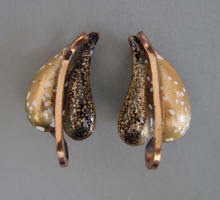 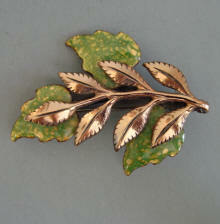 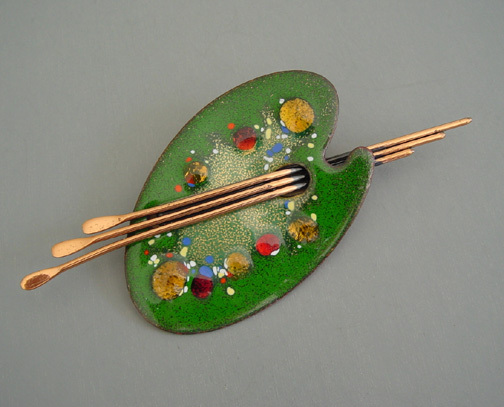 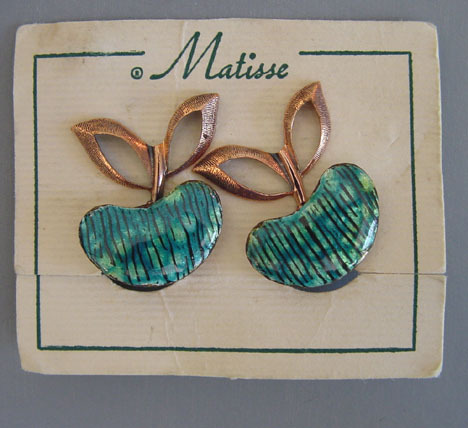 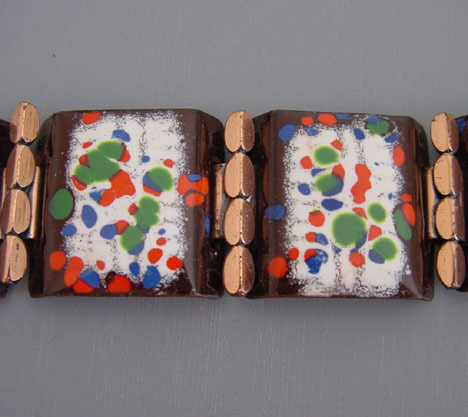 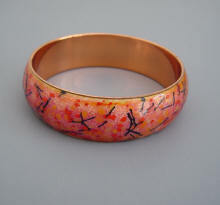 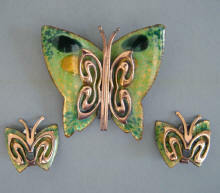 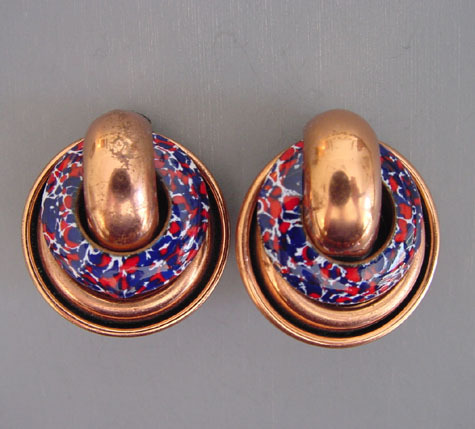 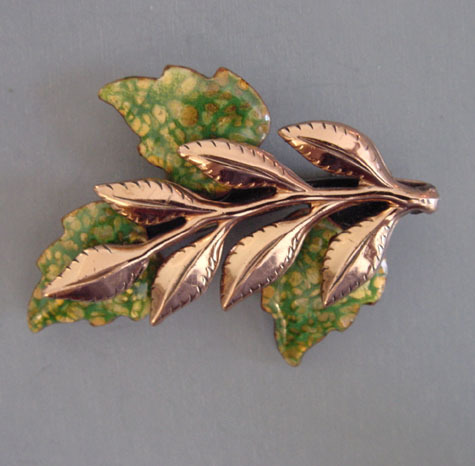 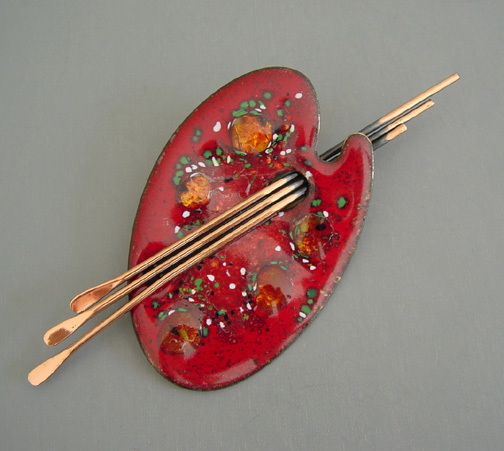 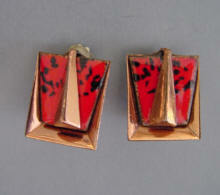 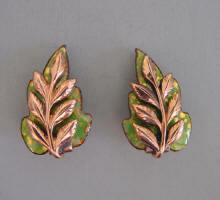 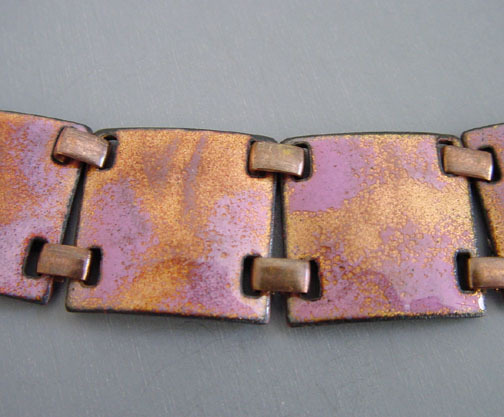 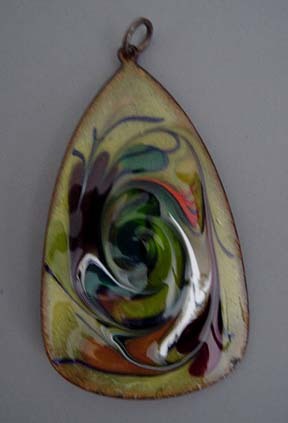 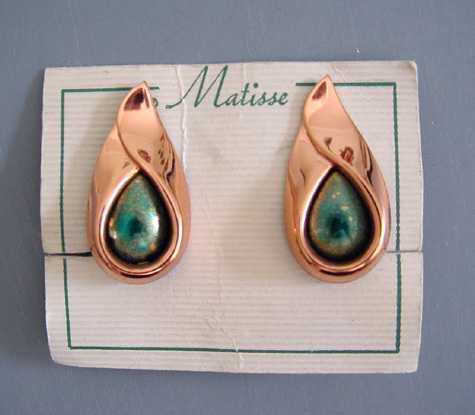 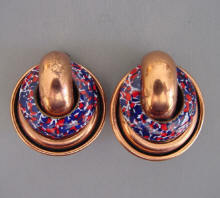 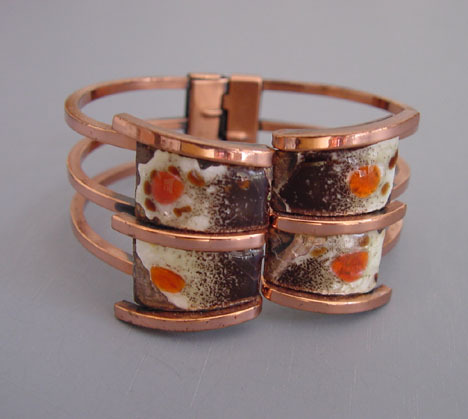 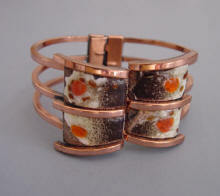 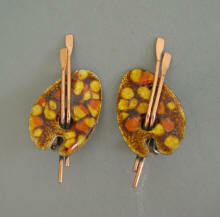 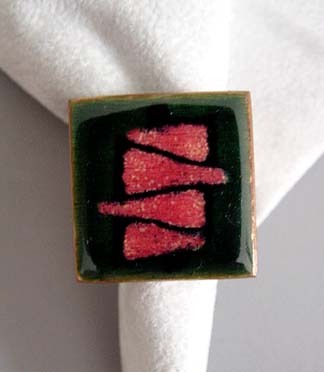 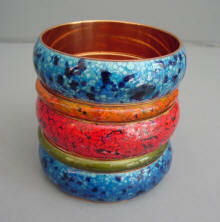 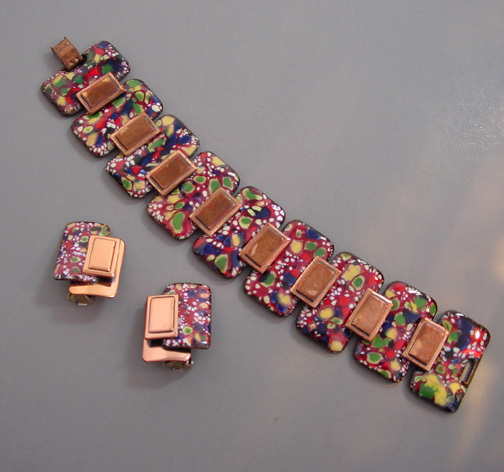 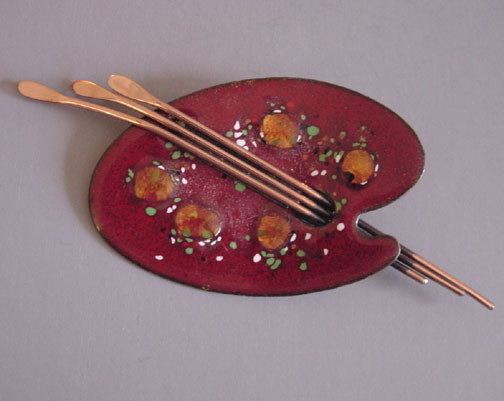 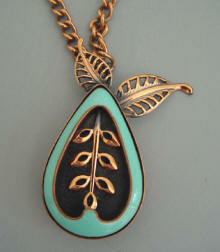 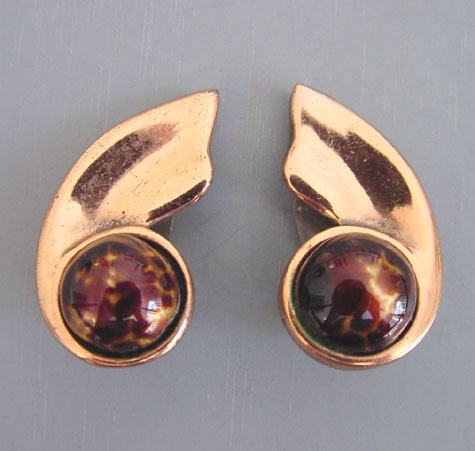 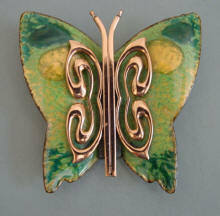 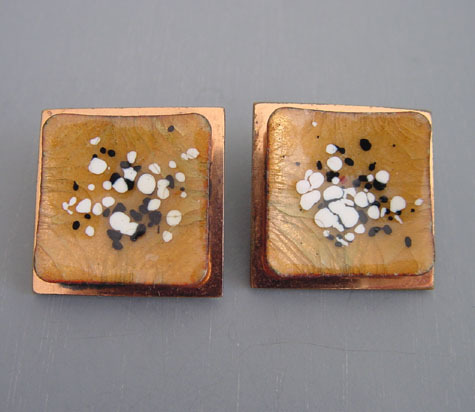 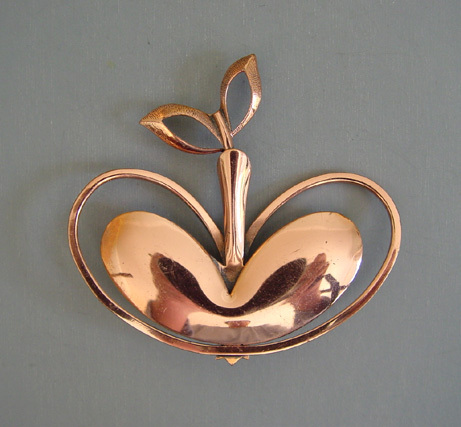 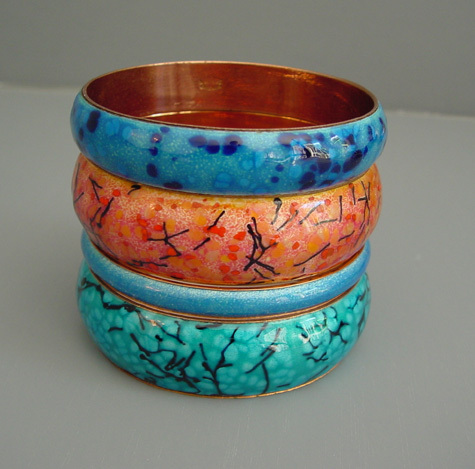 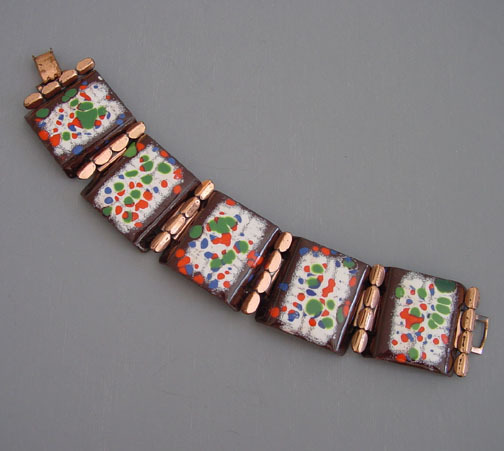 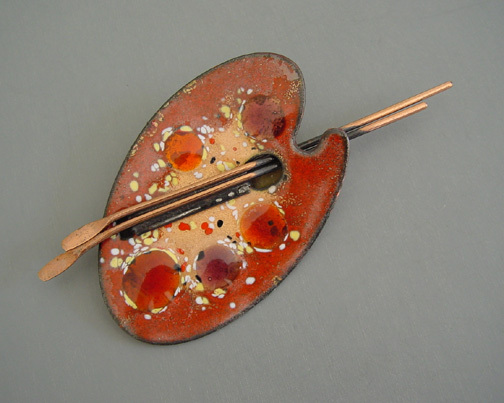 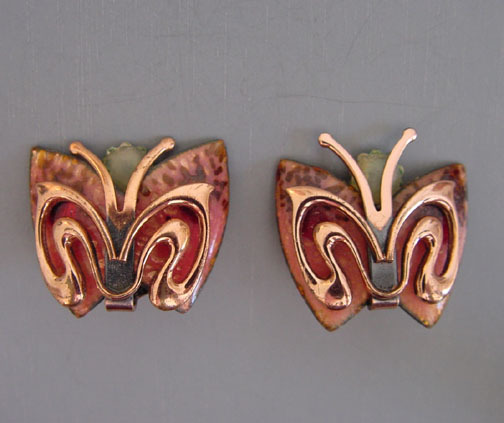 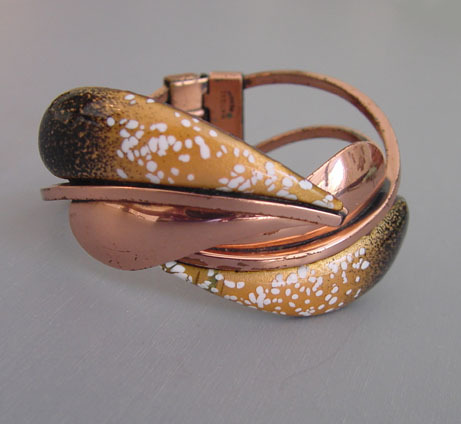 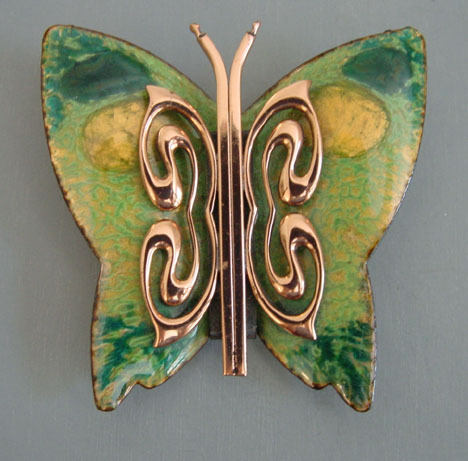 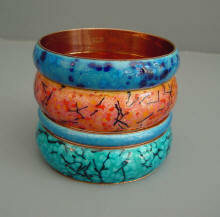 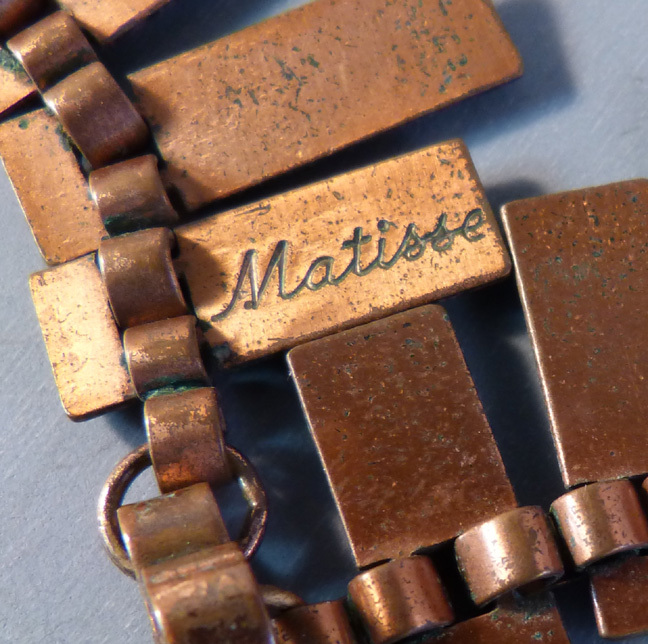 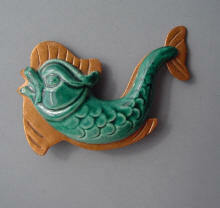 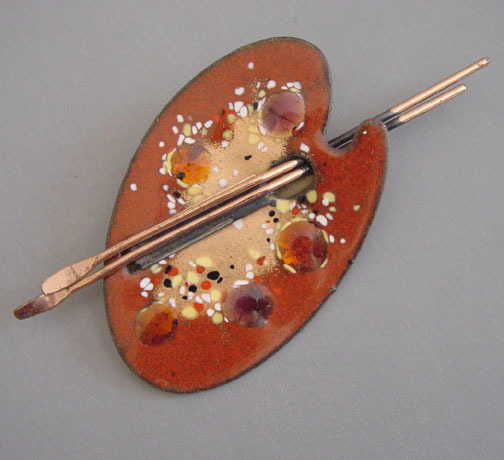 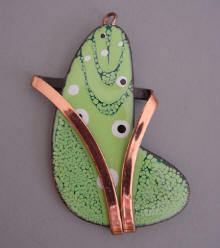 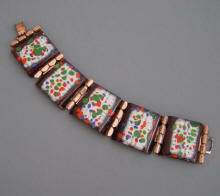 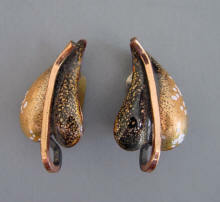 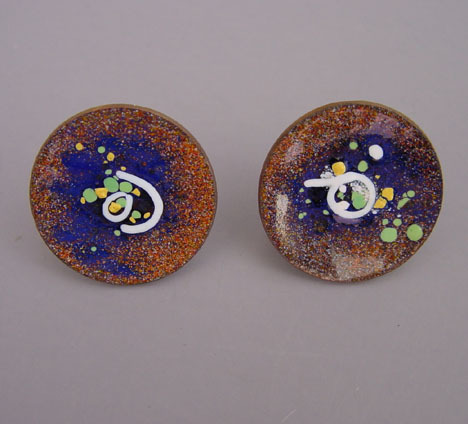 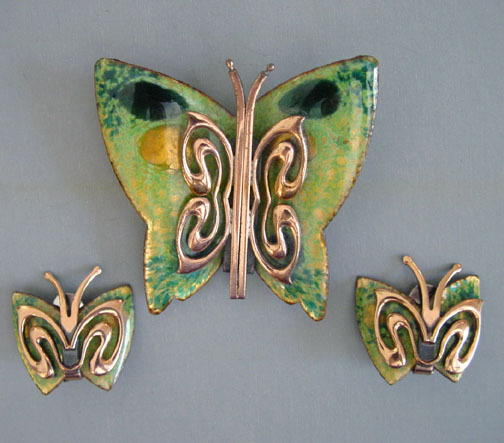 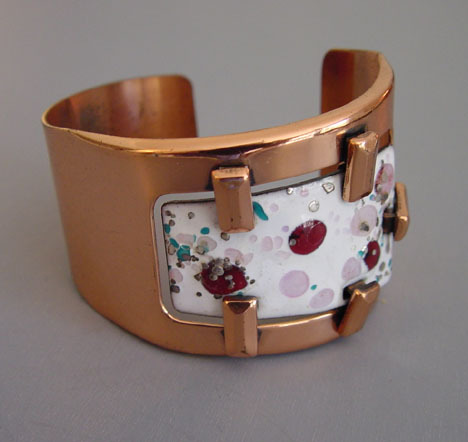 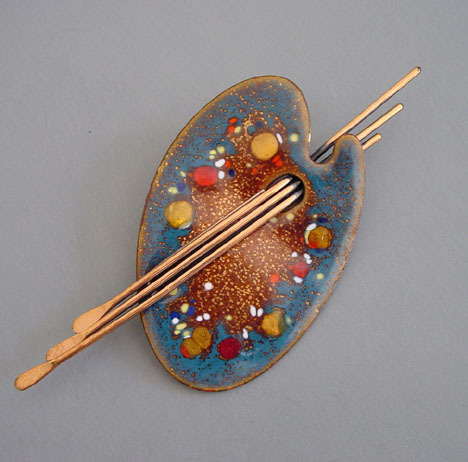 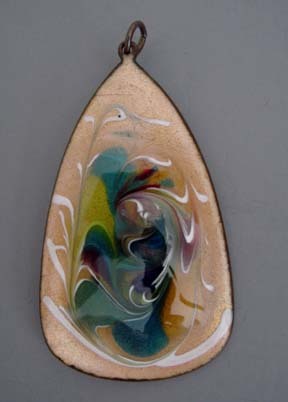 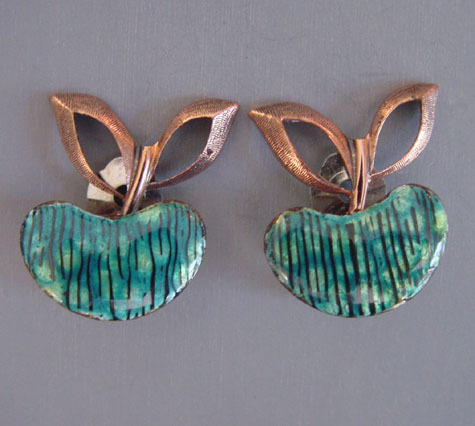 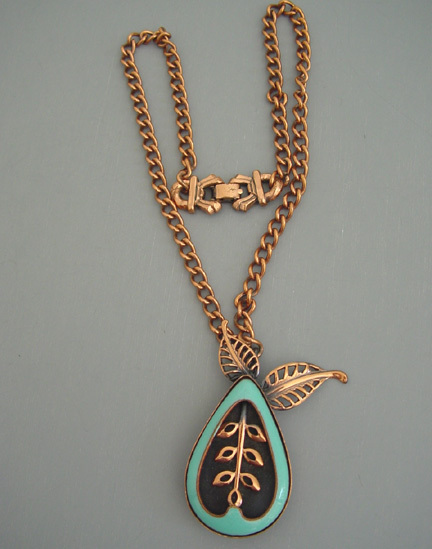 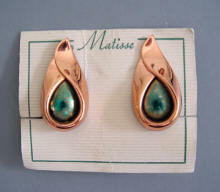 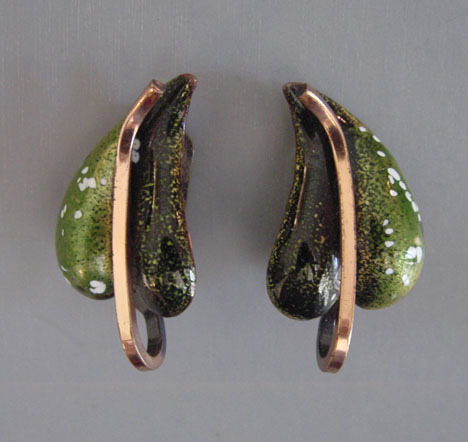 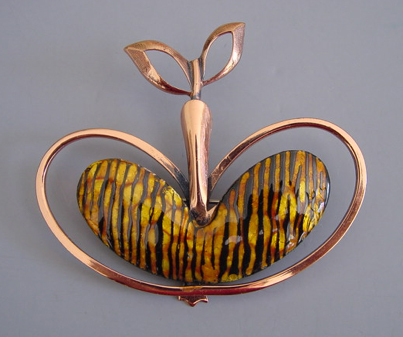 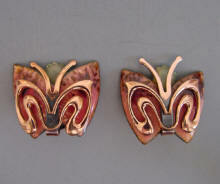 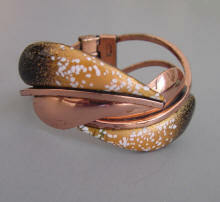 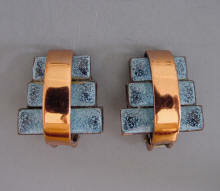 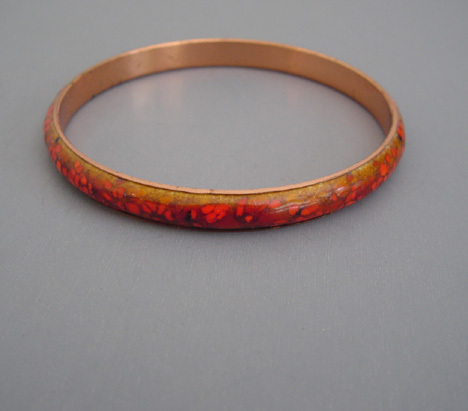 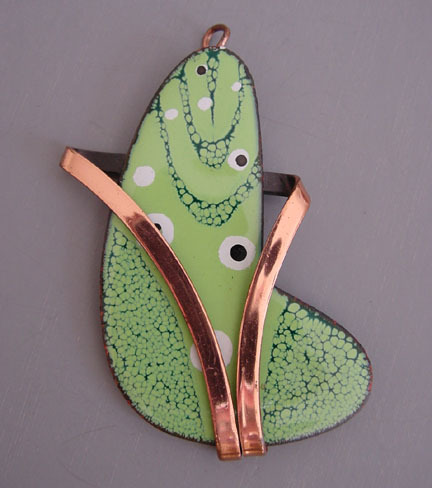 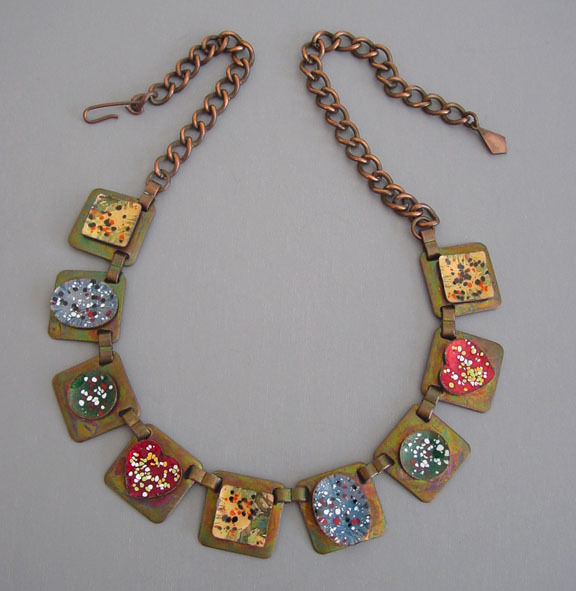 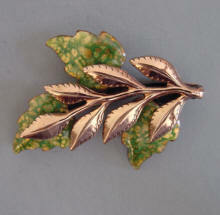 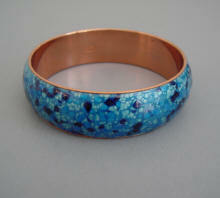 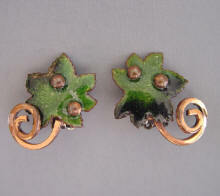 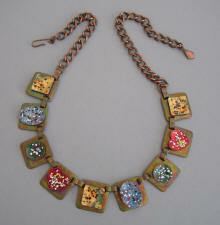 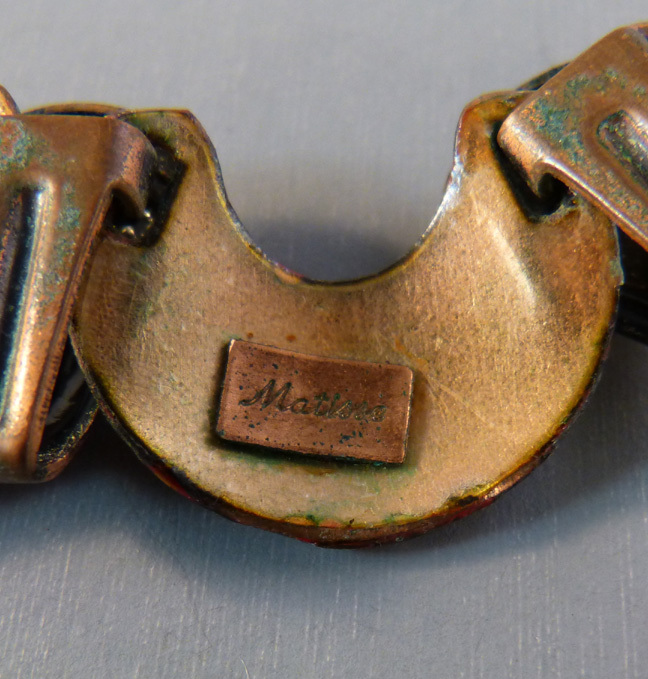 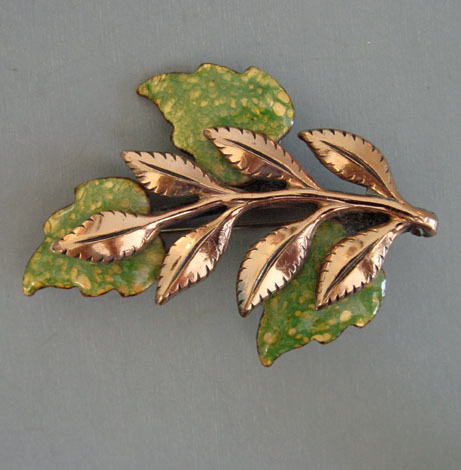 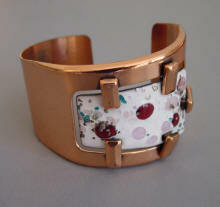 "Matisse" was introduced by Jerry Fels of Renoir in 1952, with the lovely enamel on copper look. 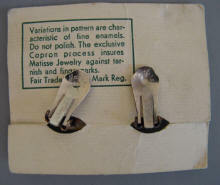 After 1954 pieces bore the copyright mark. 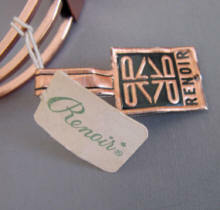 In the mid-50s Renoir also did sterling silver jewelry and that line was named "Sauteur". 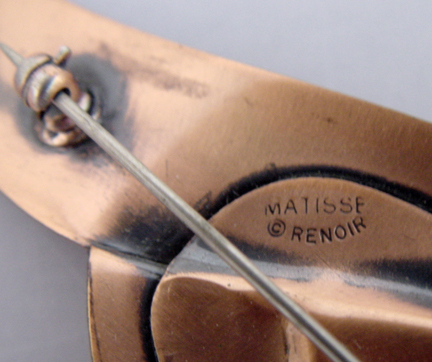 Renoir and Matisse Companies were closed in 1964.